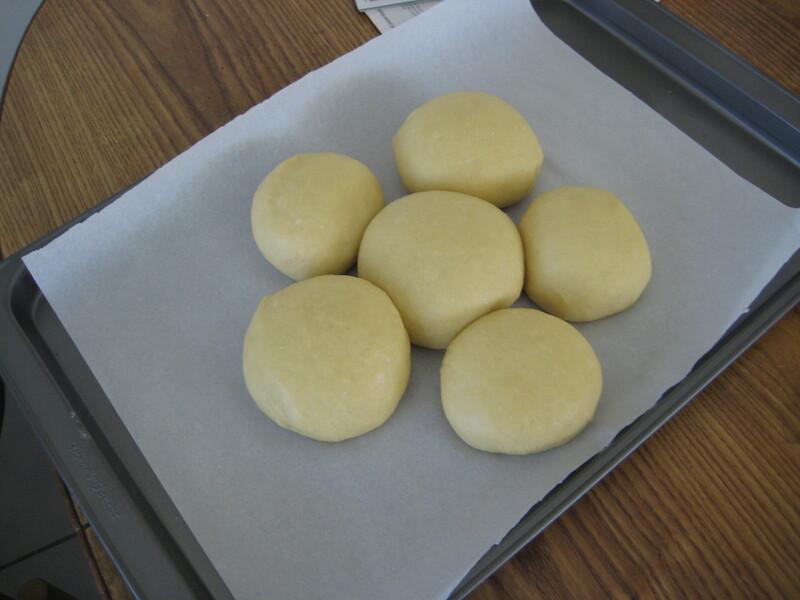 While studying and writing papers I was hankering for something easy and inexpensive to make. 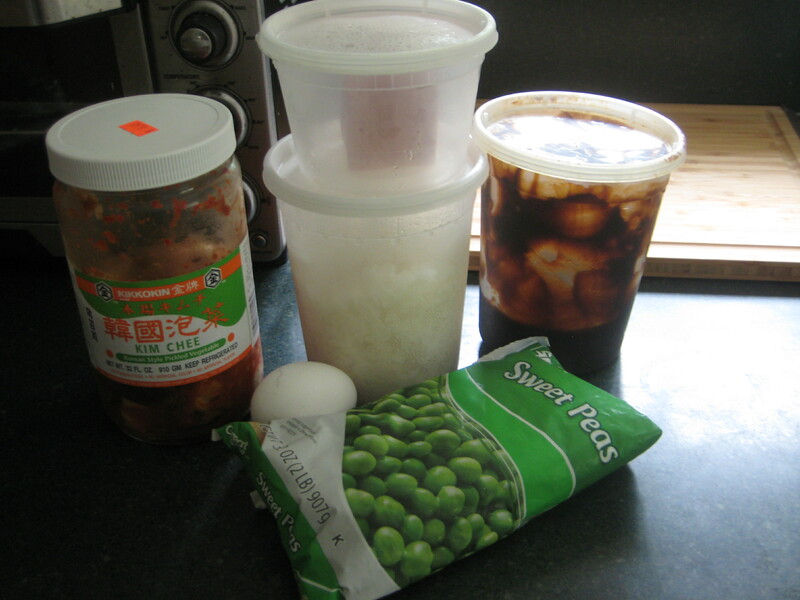 I had forgotten about the container of kimchi in the back of the refrigerator and stumbled across it just the other day. 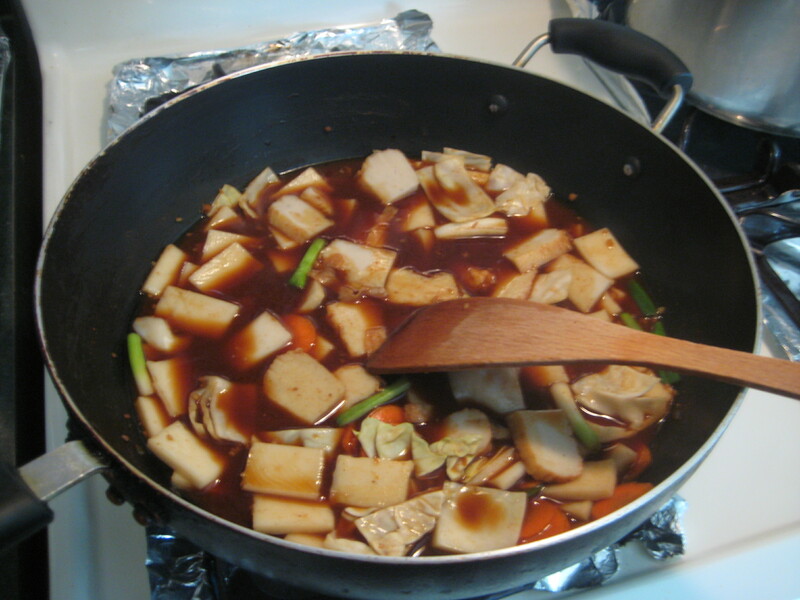 So I got to thinking that I should make something with the kimchi. 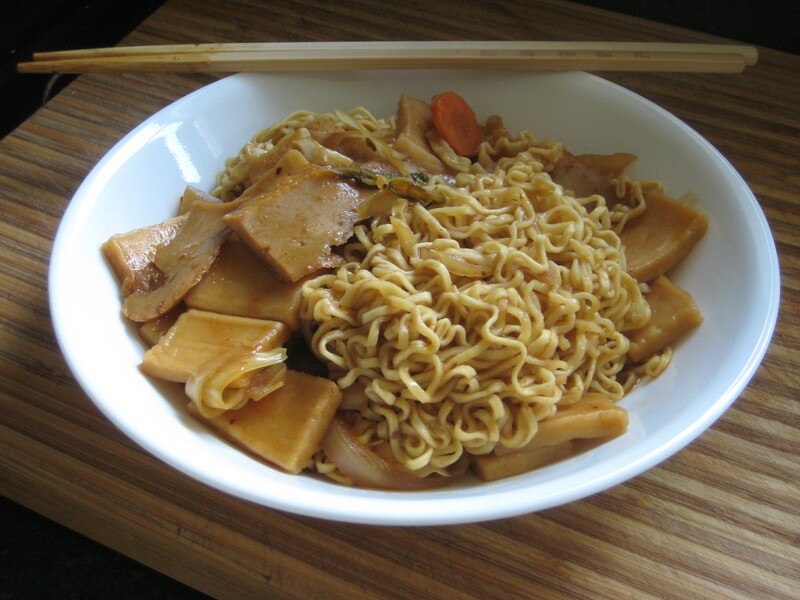 Well I would have had it in a bowl of noodles, but I ran out of noodles a while ago. 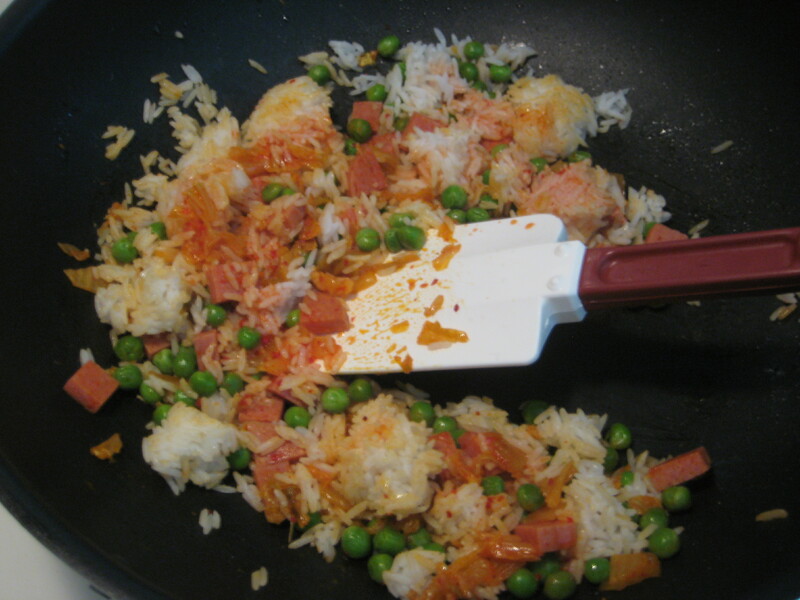 Instead there was a container of leftover rice and I figured why not combine the two. 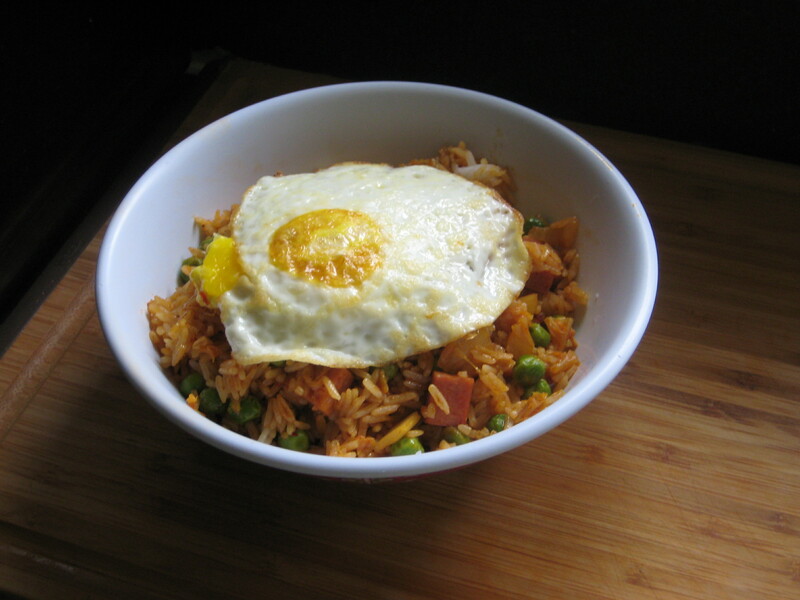 I was inspired to make this dish from watching Maangchi’s youtube video on Kimchi Fried Rice and just had to make it. 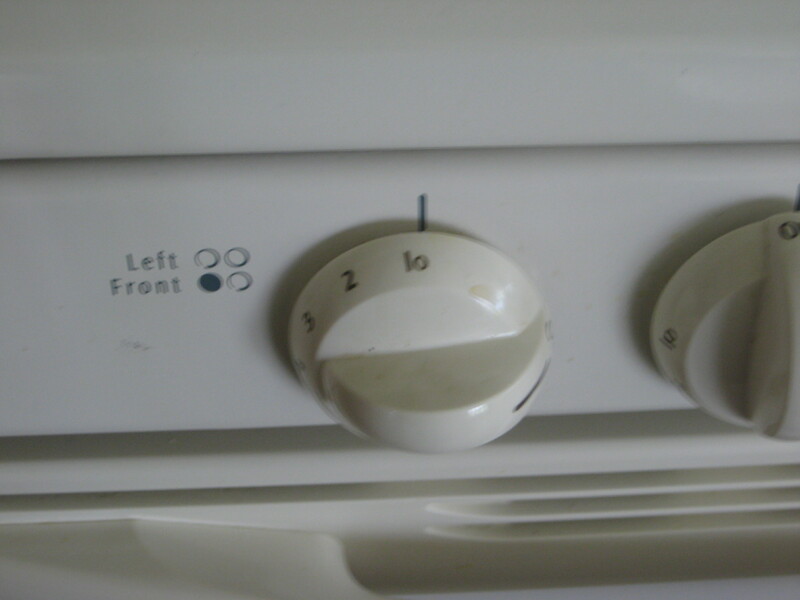 But with a few changes. 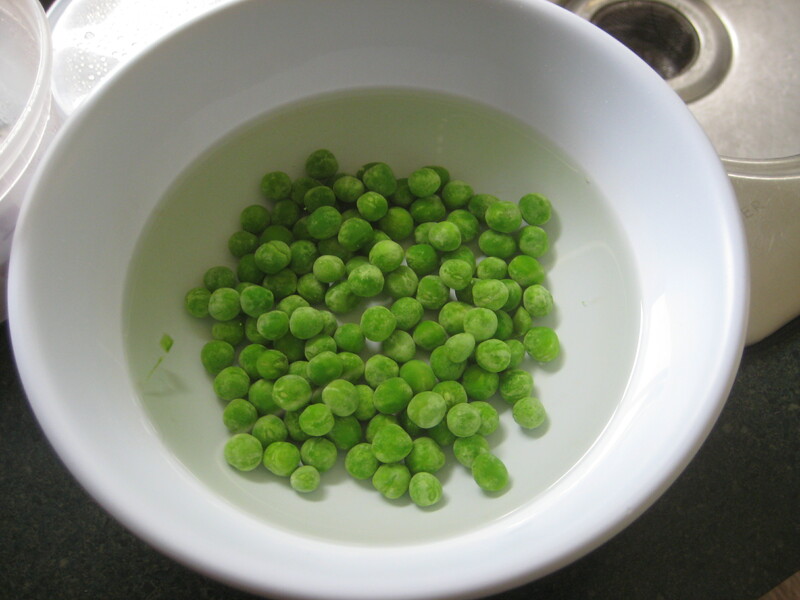 Step 1: Rinse the frozen sweet peas to remove the ice; set aside. 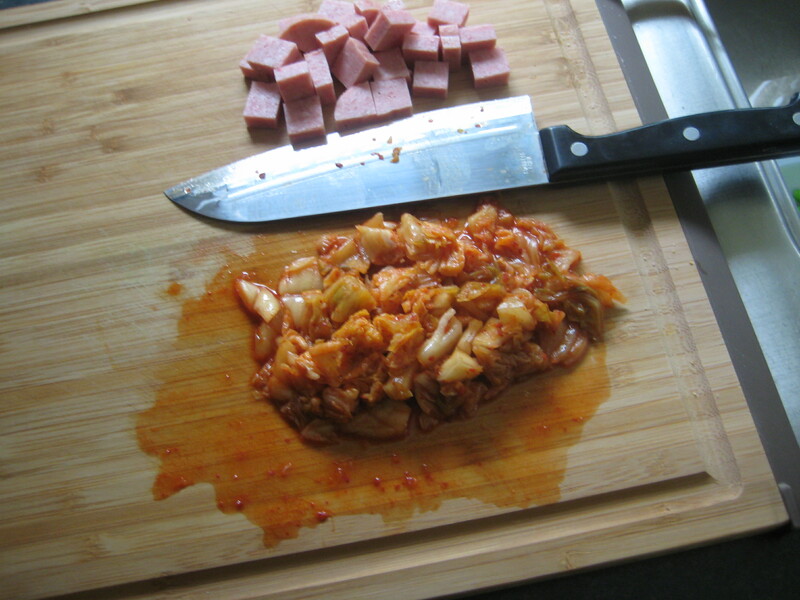 Step 2: Cut the Spam and kimchi into small pieces; set aside. 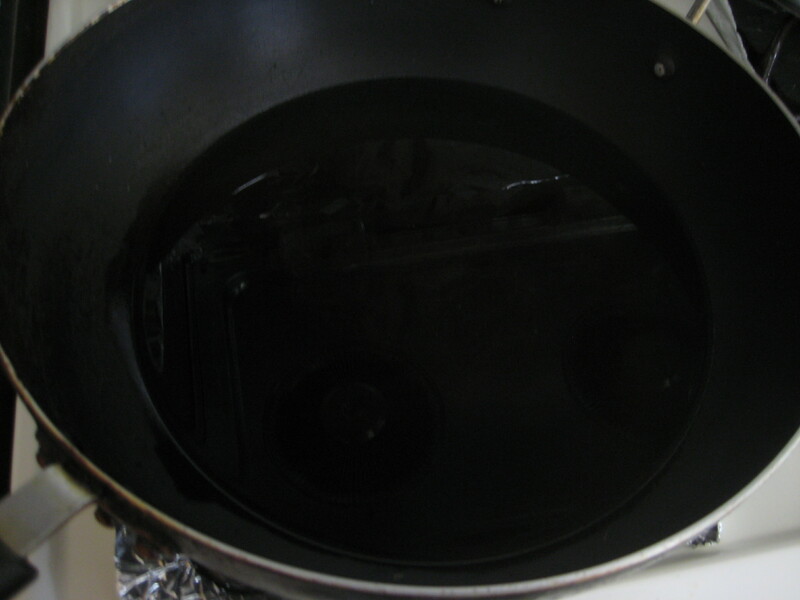 Step 3: In a large pan, add 1 Tbsp. 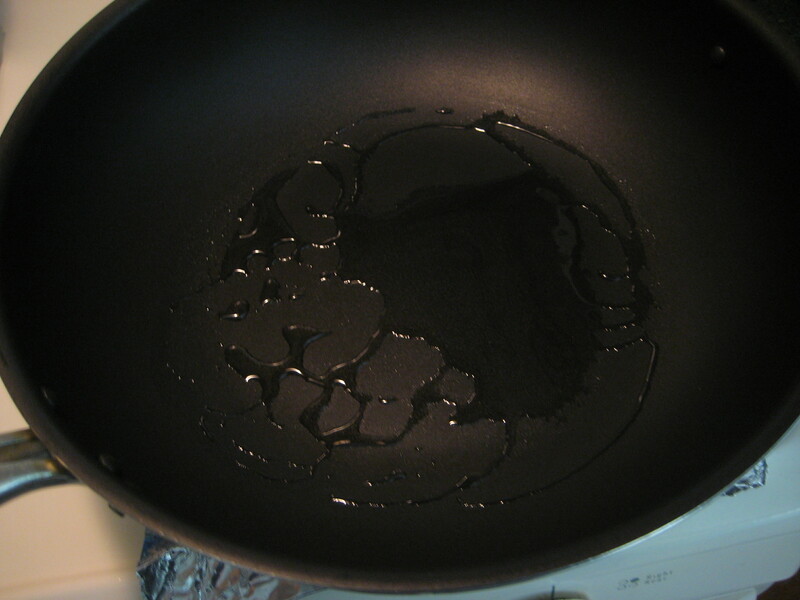 vegetable oil over high heat. 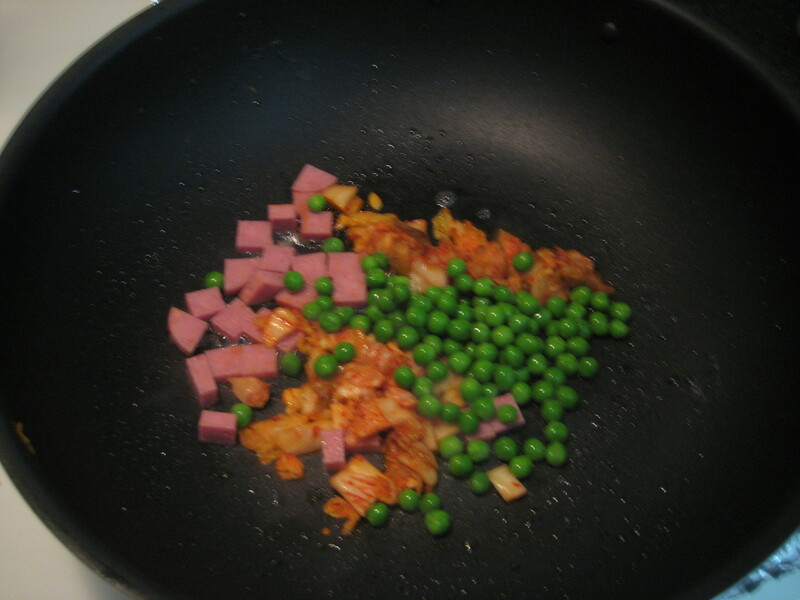 Step 6: In the same pan, add in the defrosted sweet peas, Spam, and kimchi and cook until heated through. 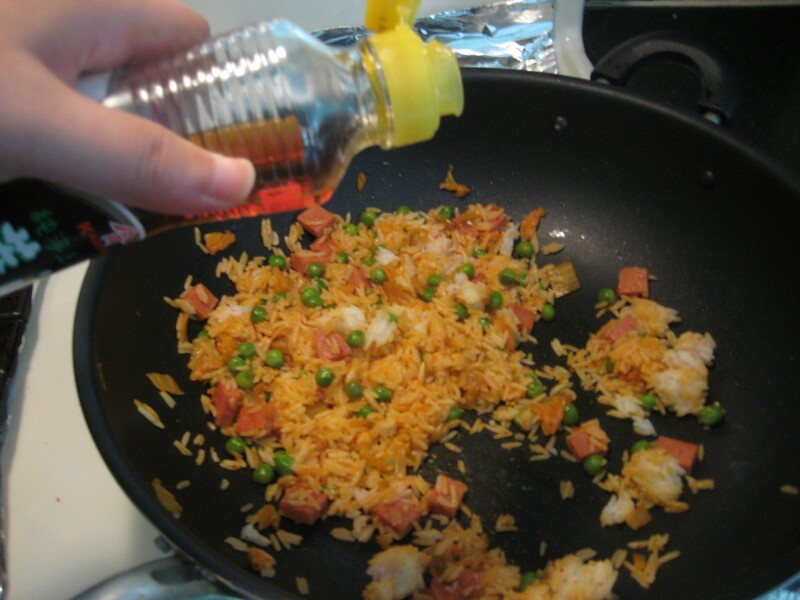 Step 7: Add 1/4 cup of water and the rice. 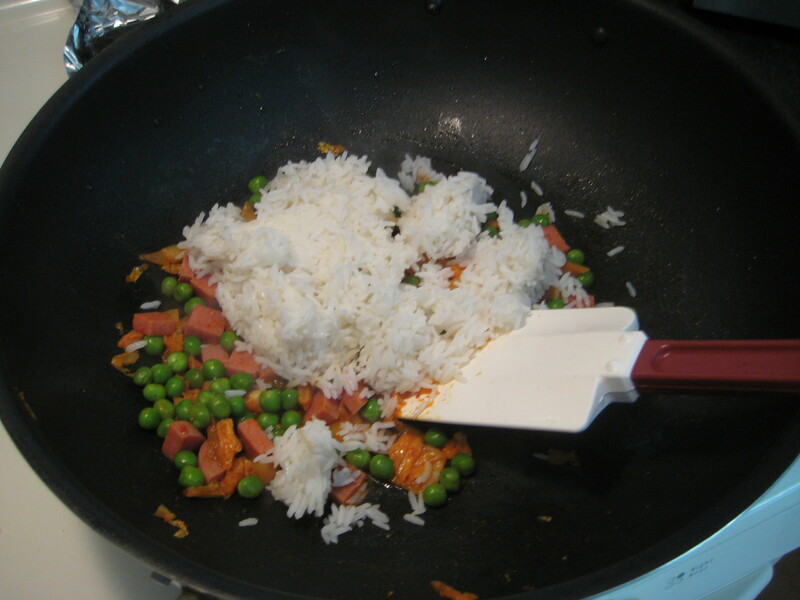 Step 8: Break the rice up with a spatula and again cook until heated through. 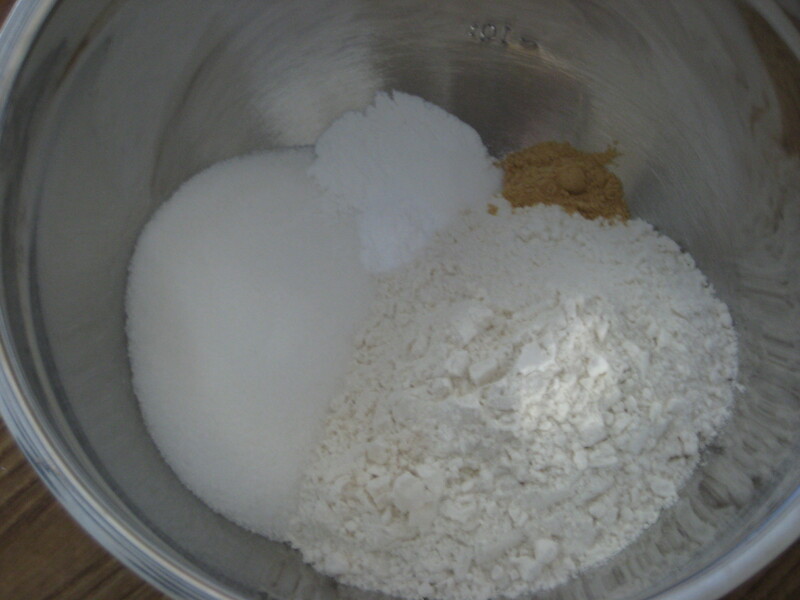 Step 9: Add in 3-4 Tbsp. 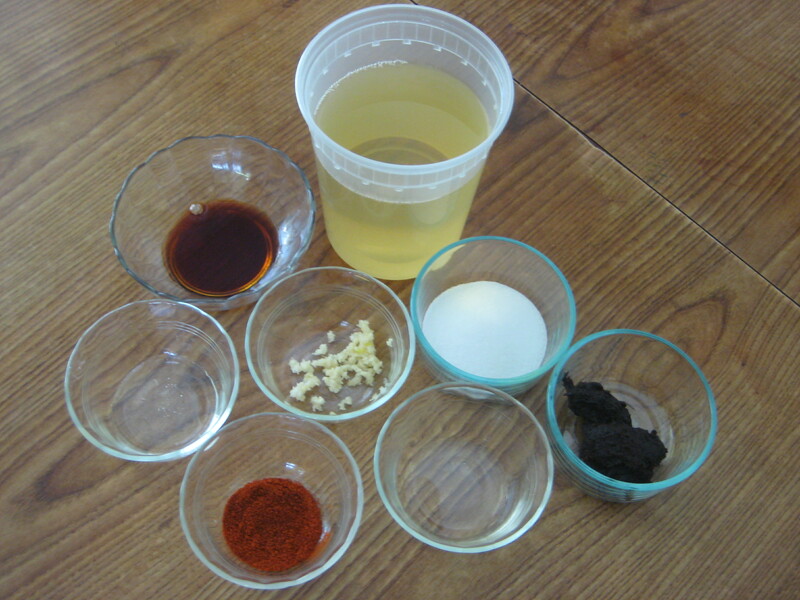 kimchi juice and stir to combine. 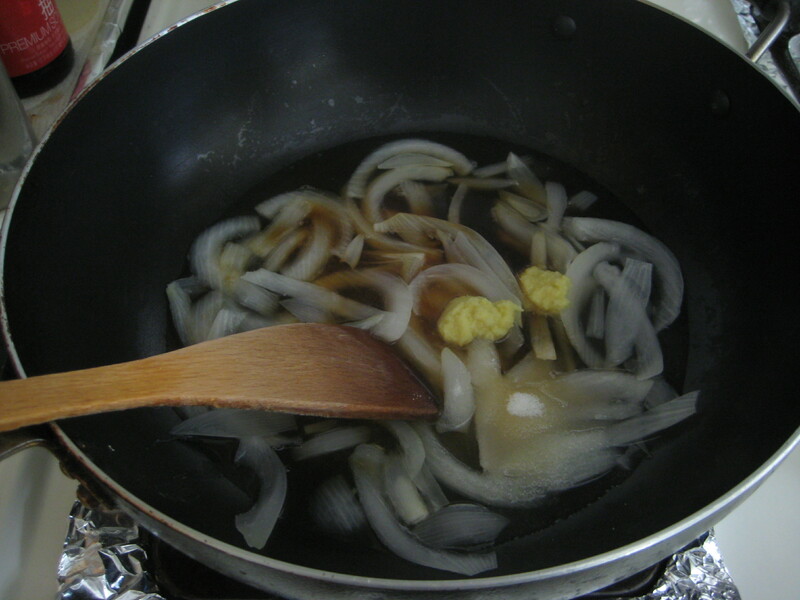 Step 10: Add in the sesame oil and toss to combine. 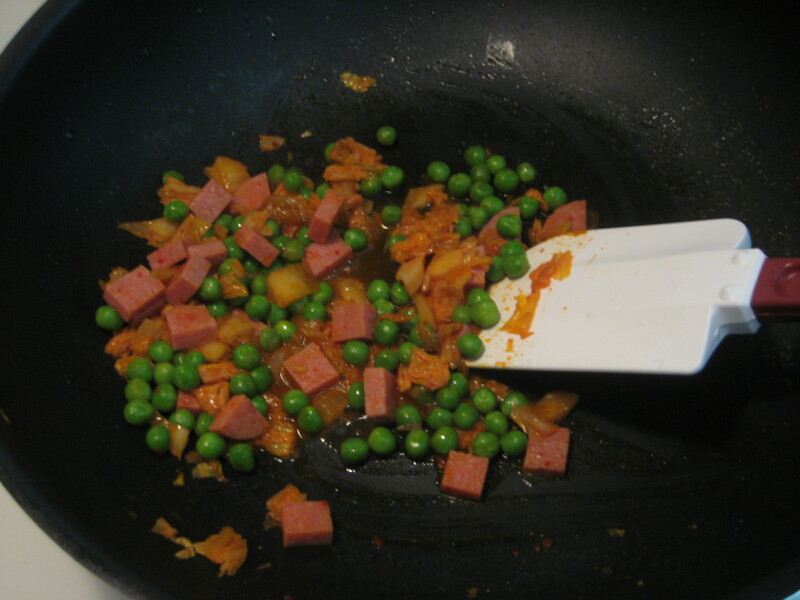 Step 11: Turn off the heat and add in the plum sauce and stir until well mixed. 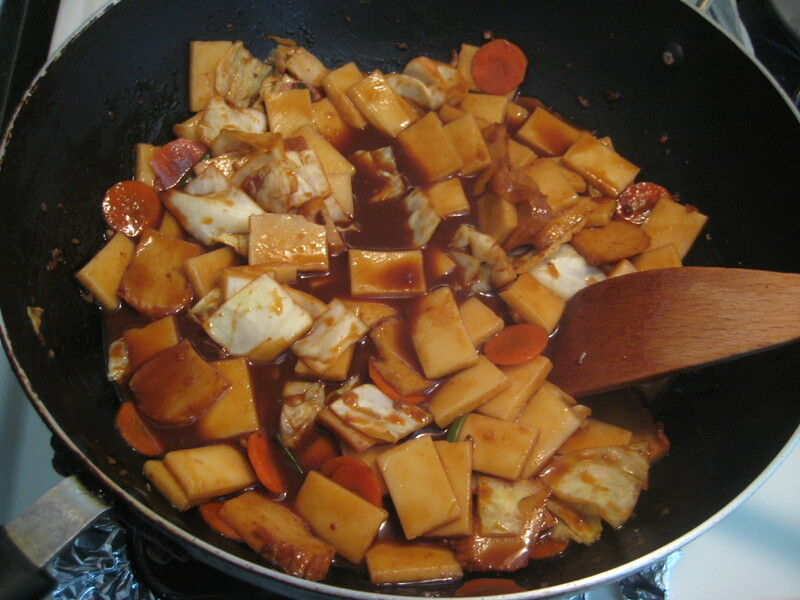 Tteokbokki, also known as ddeokbokki or topokki,is a popular Korean snack food which is commonly purchased from street vendors or Pojangmacha. 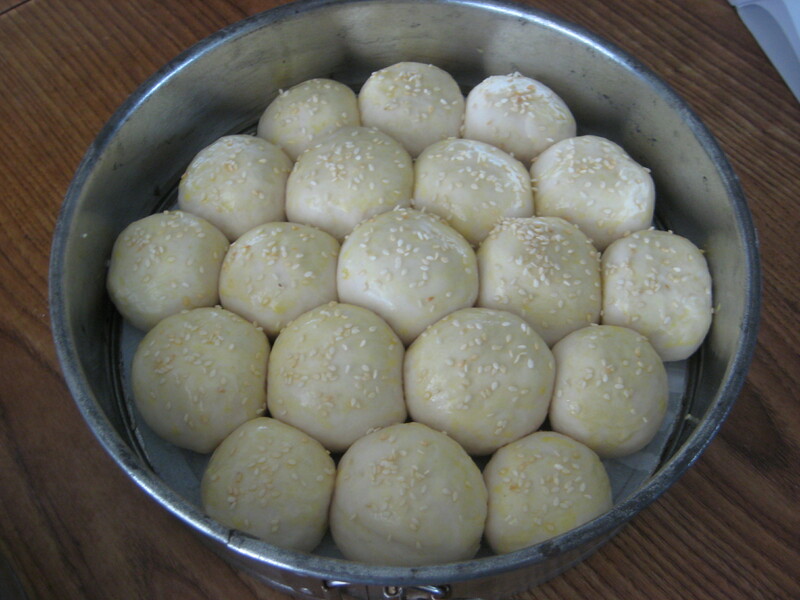 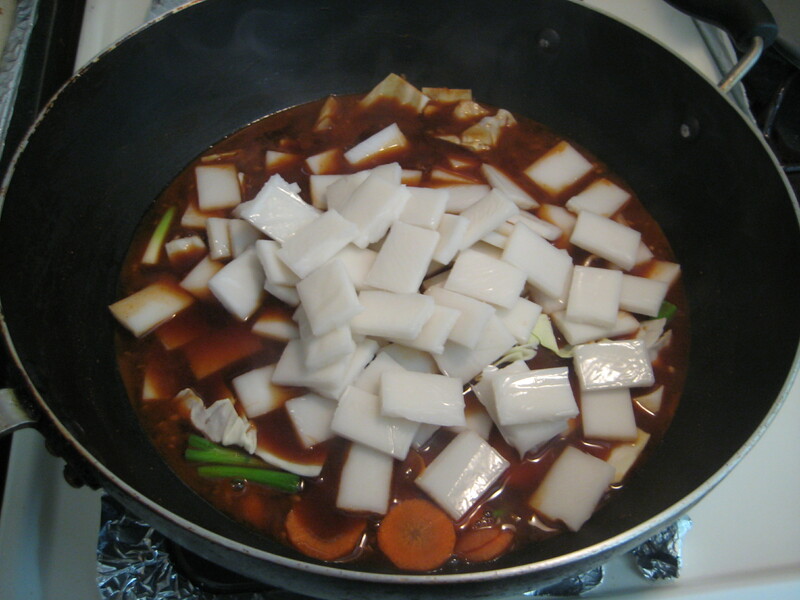 Originally it was called tteok jjim (떡찜), and was a braised dish of sliced rice cake, meat, eggs, and seasoning. 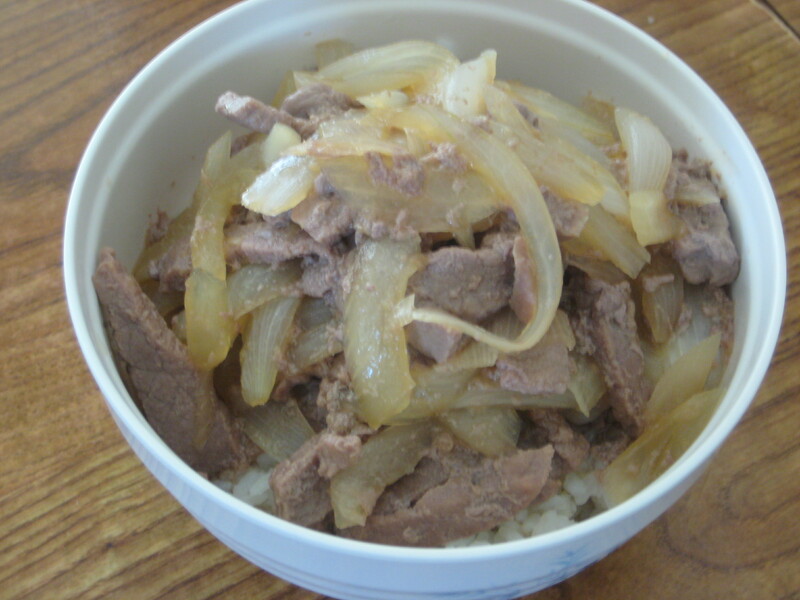 So while I was completely and utterly sick from a head cold for a good week I ended up watching some Korean dramas online and I stumbled upon one called Gourmet. 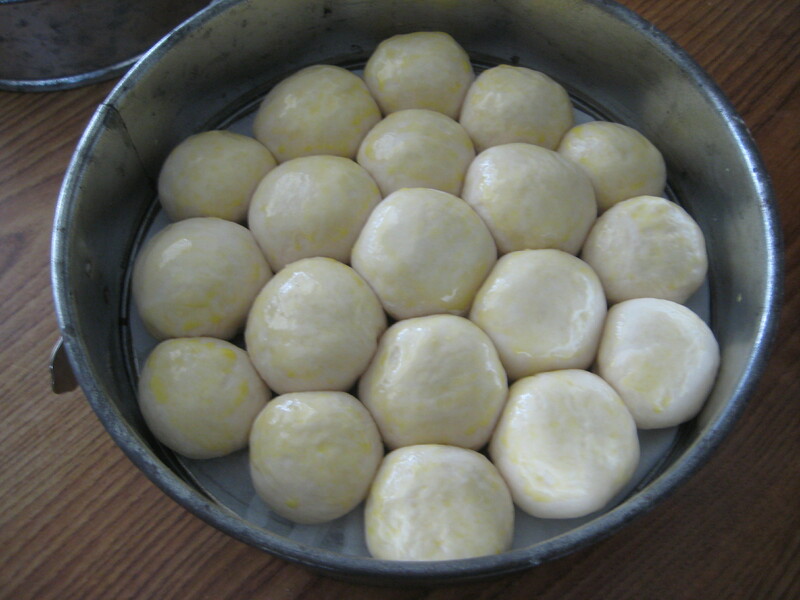 This drama was all about the traditional foods of Korea and of course the drama of the characters’ lives, but anyways I got really into the food shown on it. 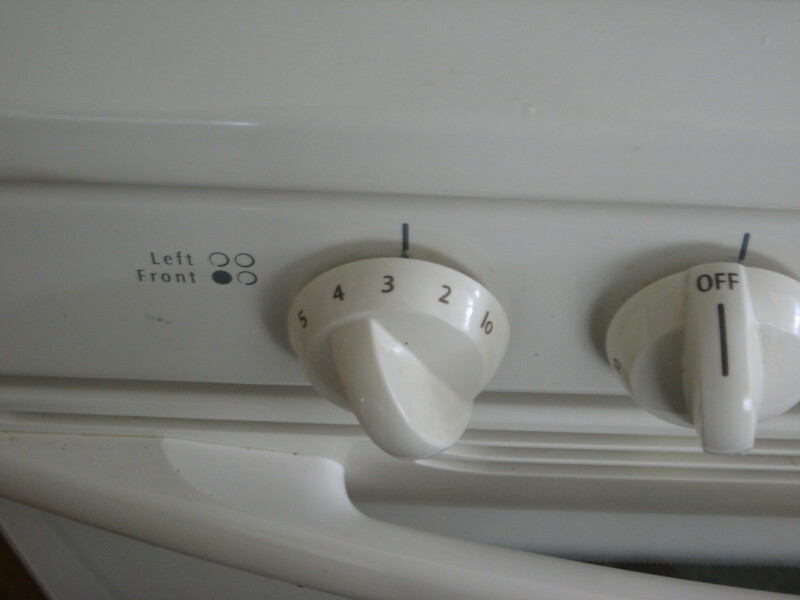 This has led me to wanting to make some of the dishes. 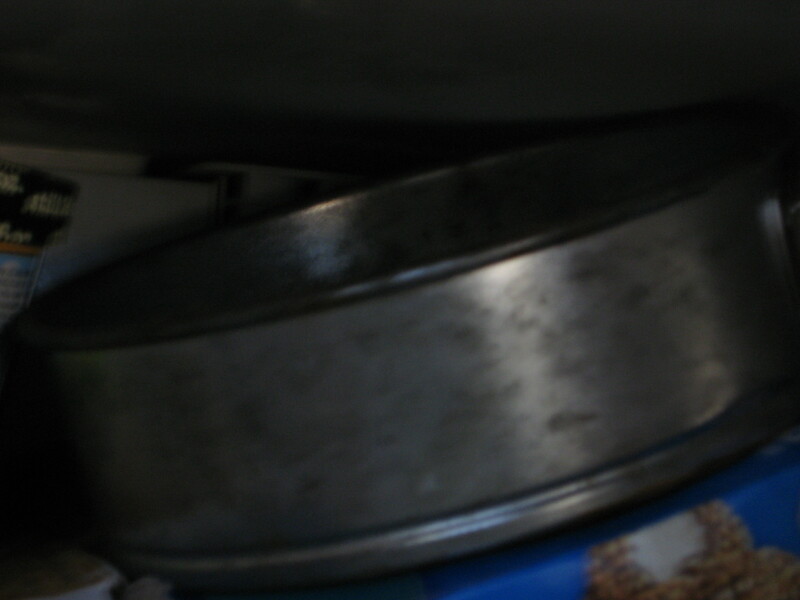 Well at least the ones that I can kind of manage with the limited supplies on hand in my town. 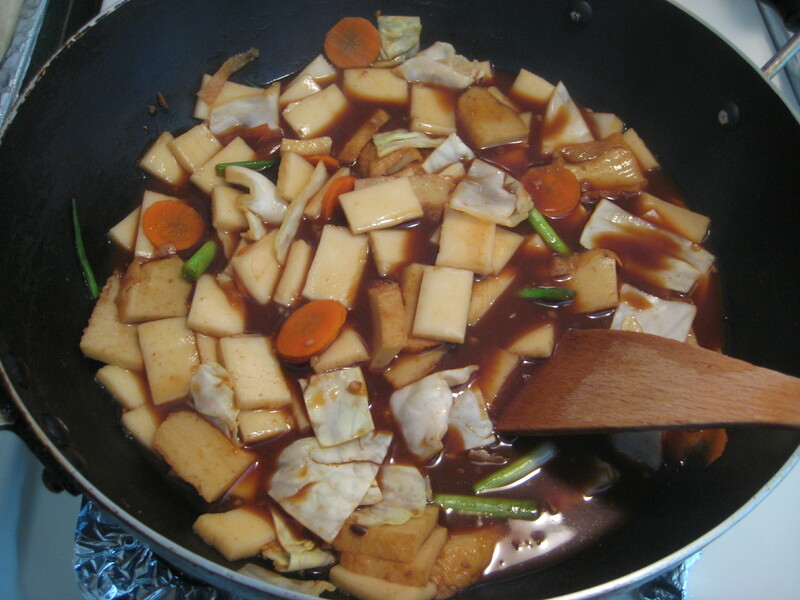 So today, finally after getting over the nasty cold, I will show you how to make topokki. 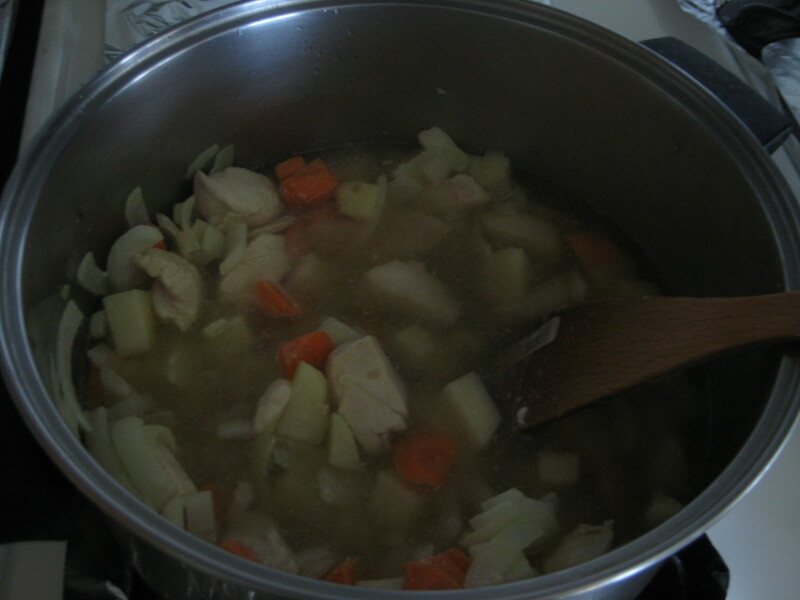 Well a version that I am able to make right now. 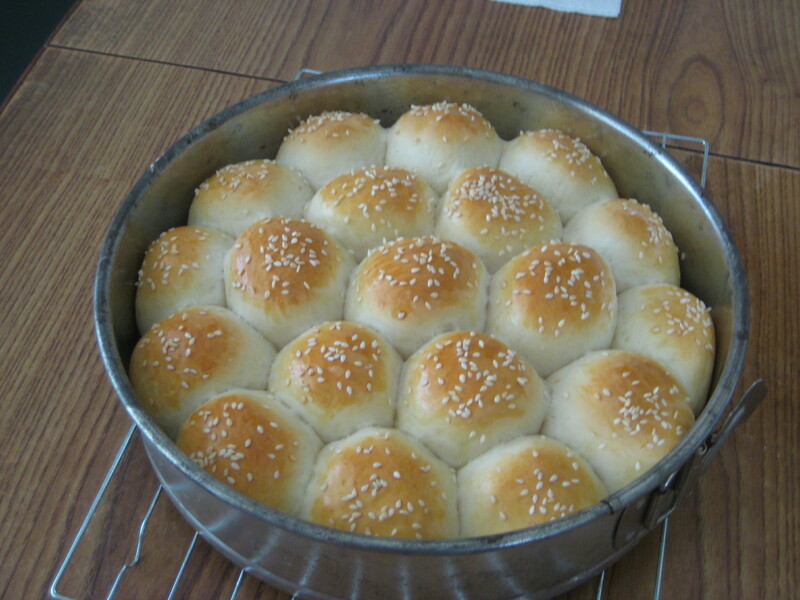 After looking over dozens of food blogs and videos I have come up with my own version. 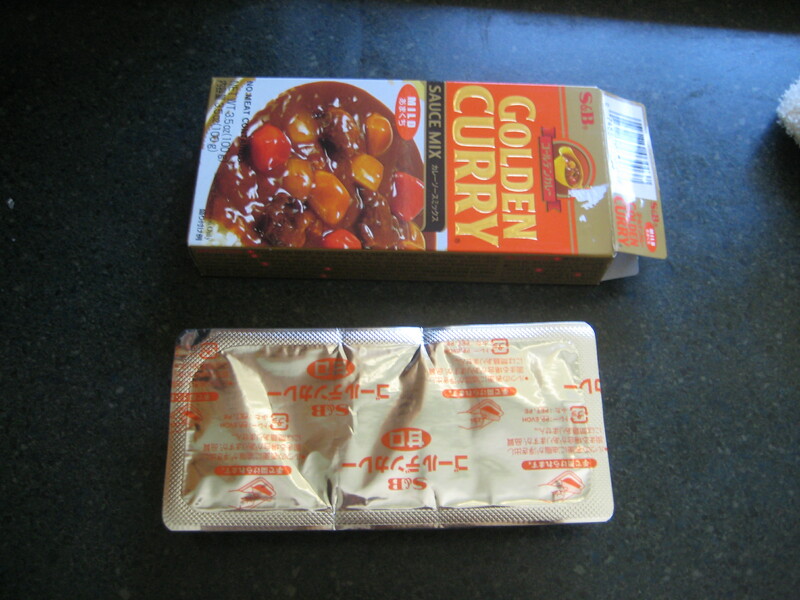 Let’s hope it’s not too spicy to eat. 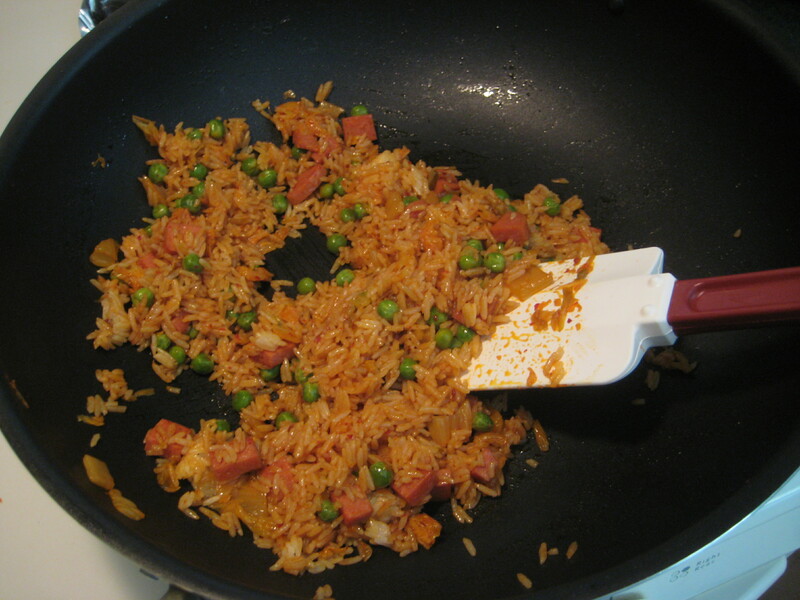 As an added bonus you can add instant ramen to the mix as well and it’s really tasty. 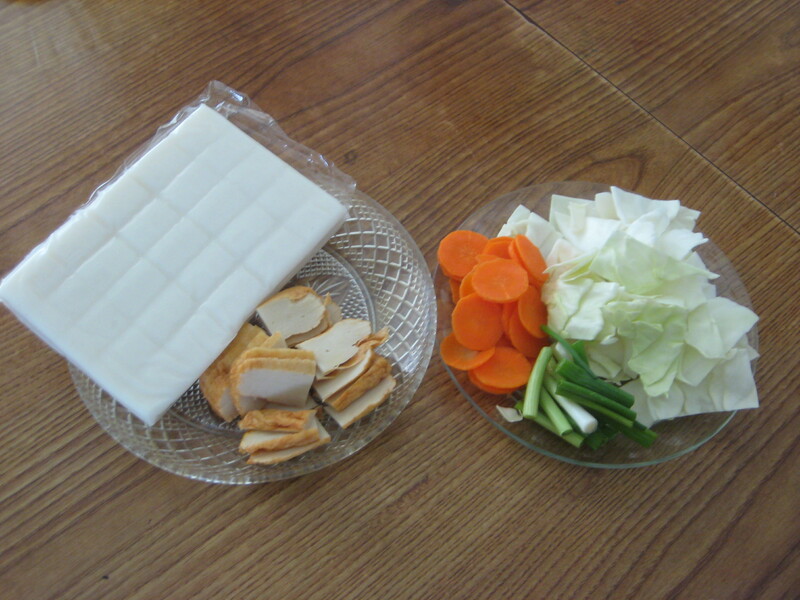 Step 1: Prepare the rice cakes as indicated by the packaging. 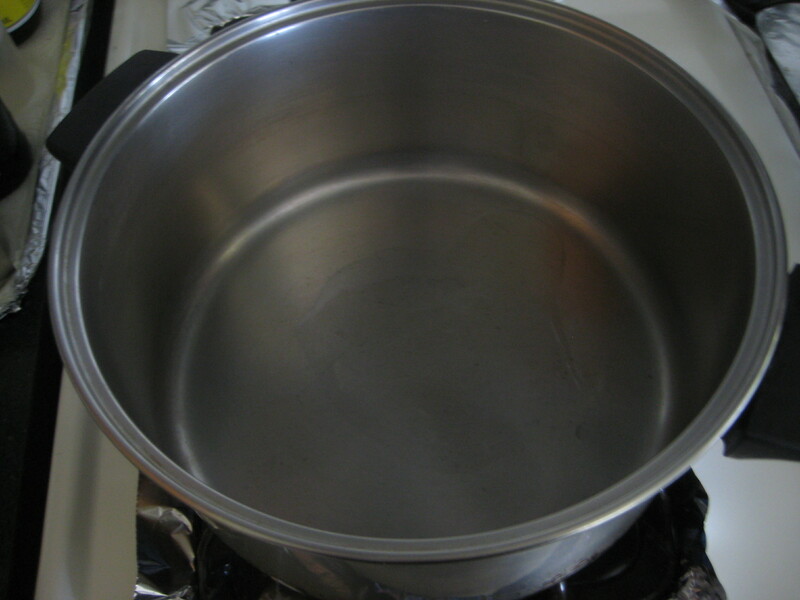 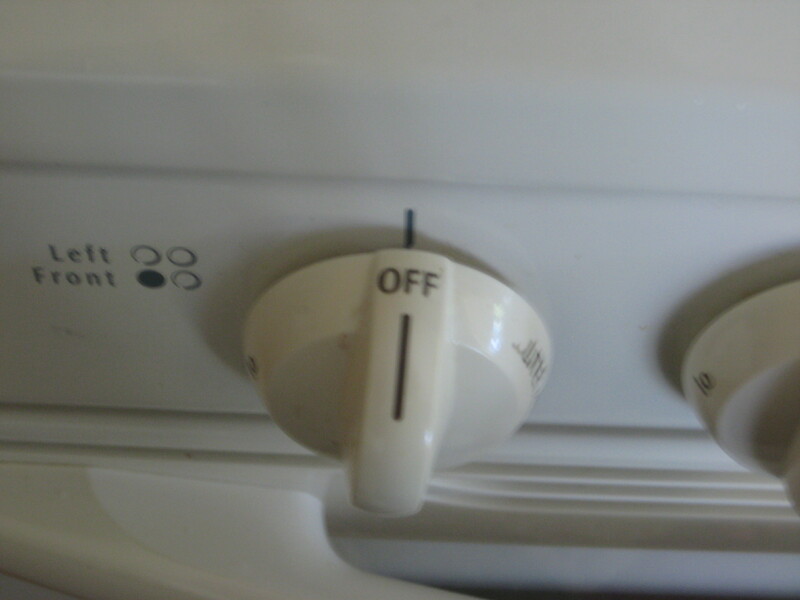 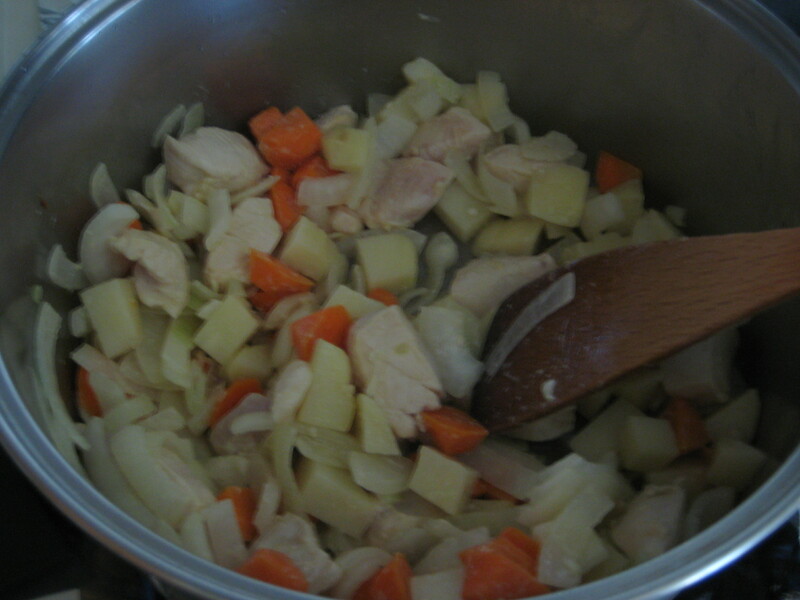 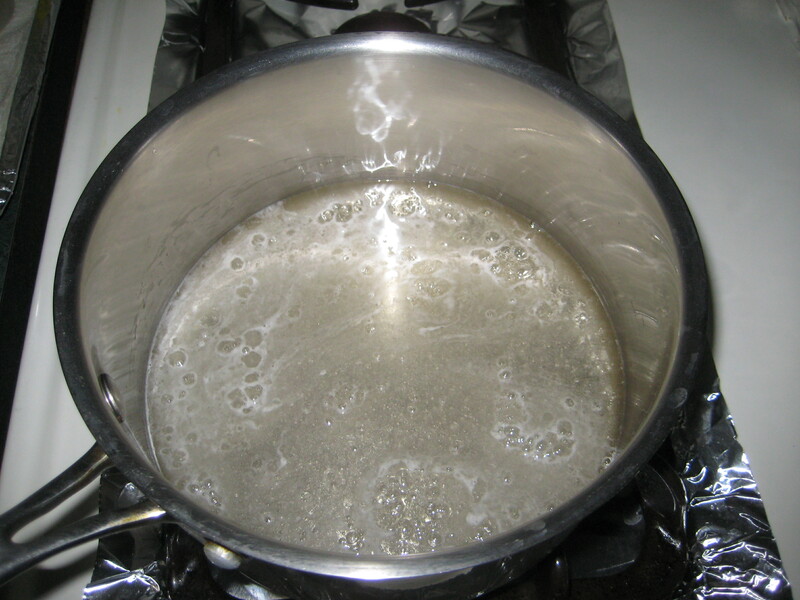 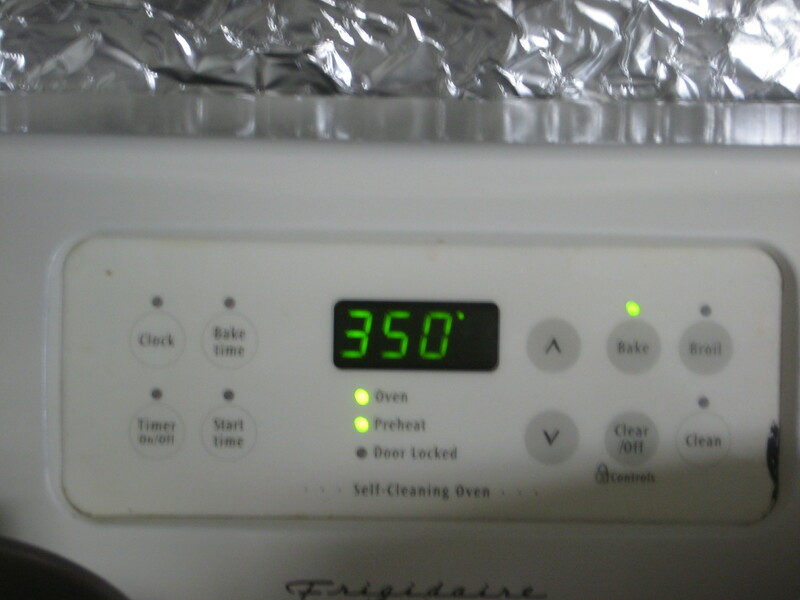 Step 4: Turn heat down to low and simmer for 5 minutes, stirring occasionally. 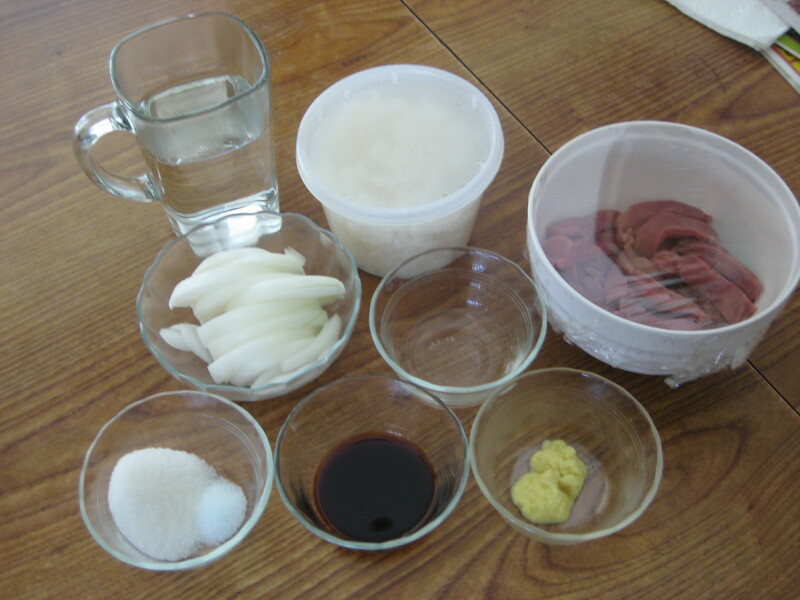 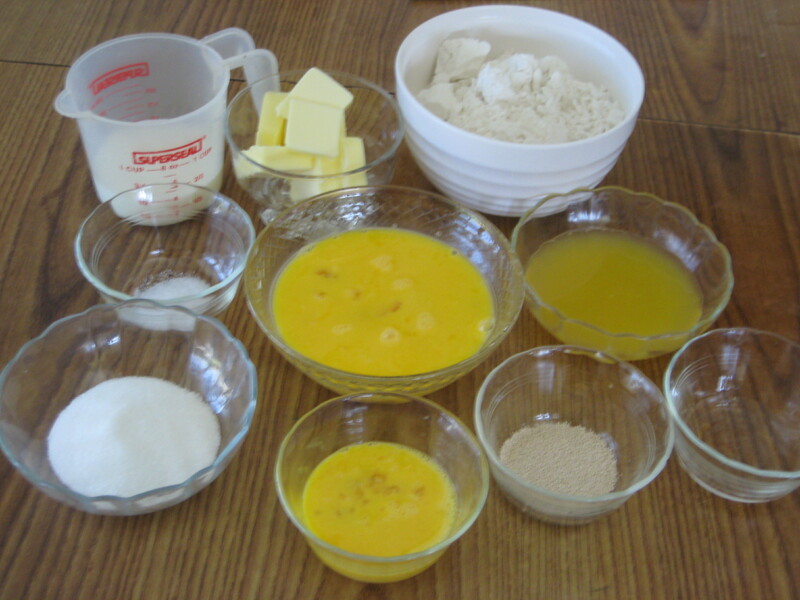 Step 5: Add in remaining ingredients. 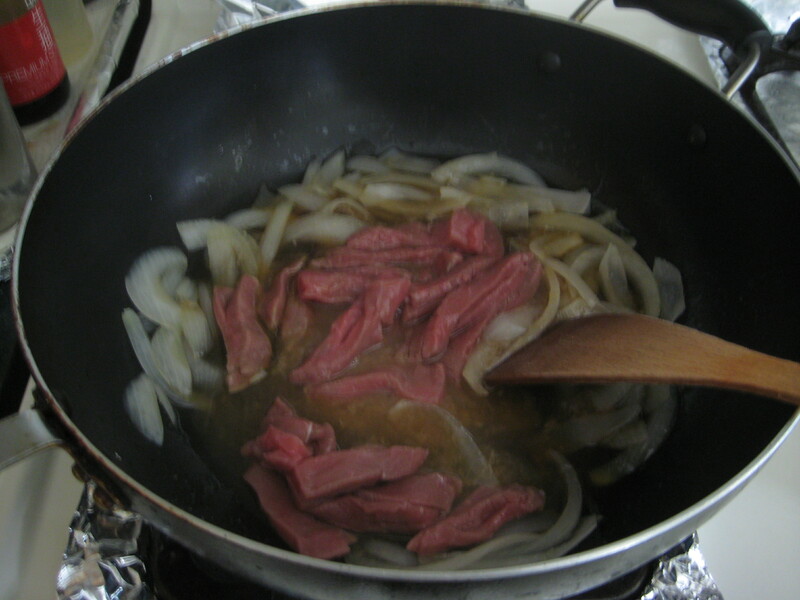 Step 7: Serve hot and garnish if desired with sesame seeds and sliced green onion. 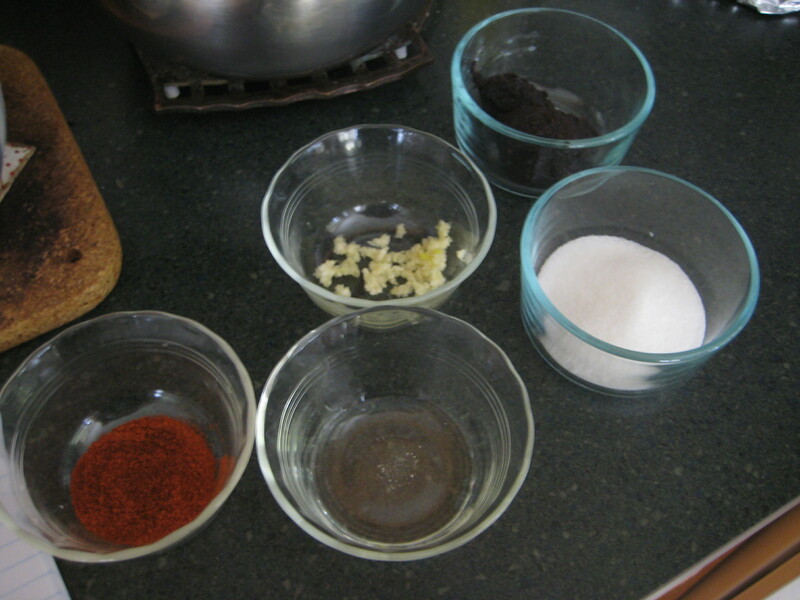 After the holidays there seems to be a surplus of sweet potatoes in the house and I can’t seem to figure out what to do with them all. 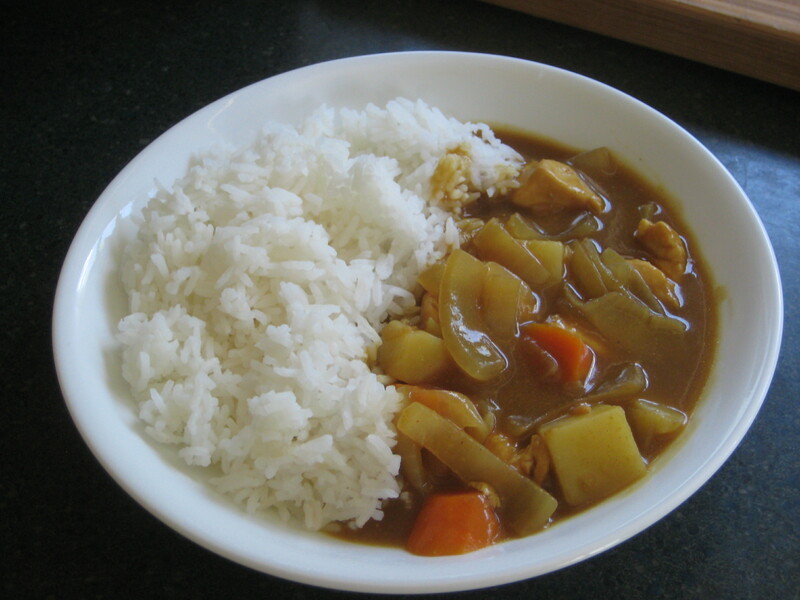 Well other than to make desserts and such for the most part, but I found a recipe that used sweet potato in a different way, it’s called Sweet potato rice (Gogumabap). 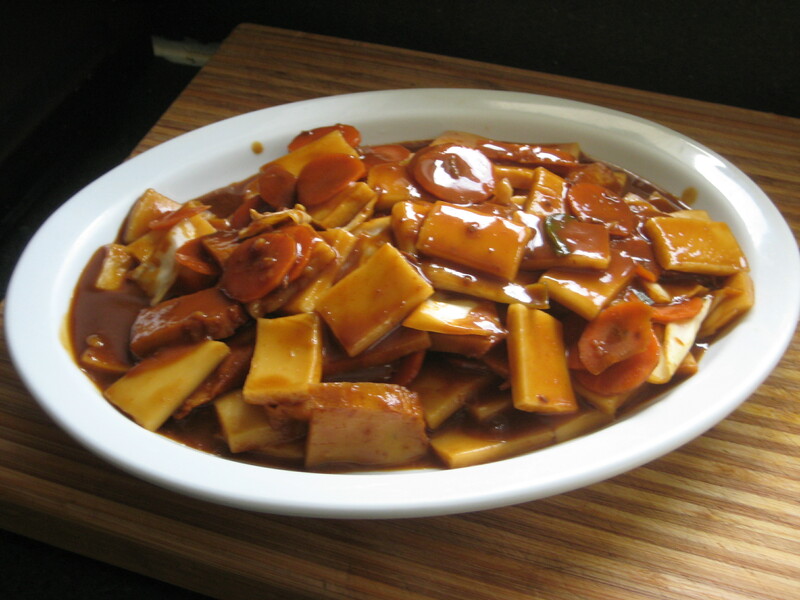 It is a healthy and filling dish. 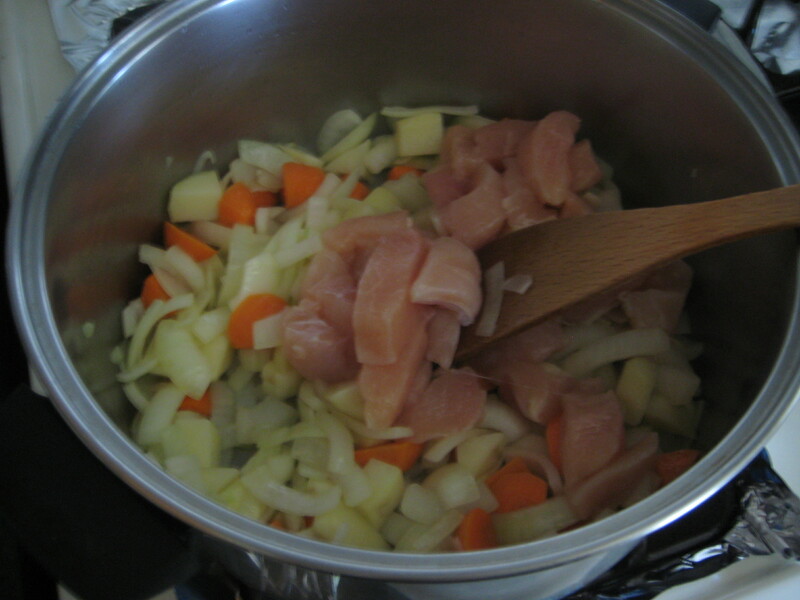 Besides simple starches, sweet potatoes are rich in complex carbohydrates, dietary fiber, beta-carotene (a provitamin A carotenoid), vitamin C, vitamin B6, manganese and potassium. 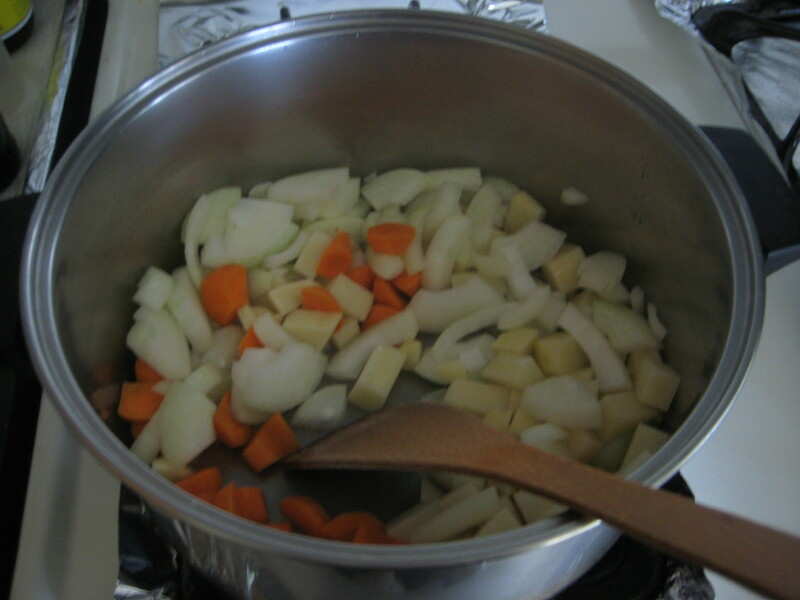 Pink, yellow and green varieties are also high in beta-carotene. 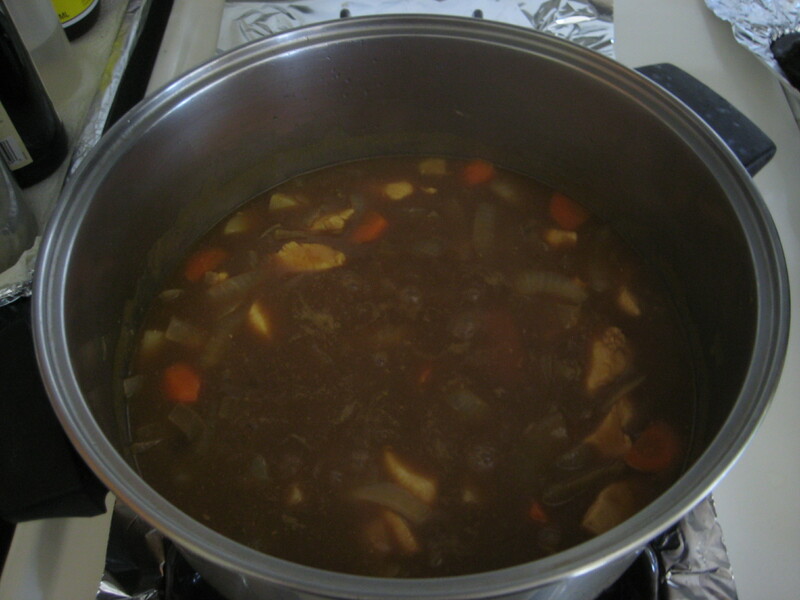 Perfect for the cold winters and tiring nights. 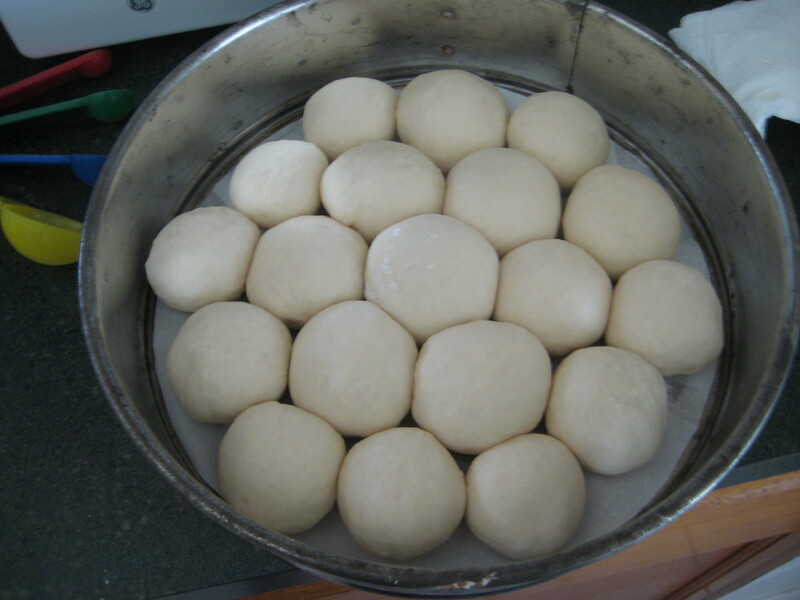 Simple to make and inexpensive. 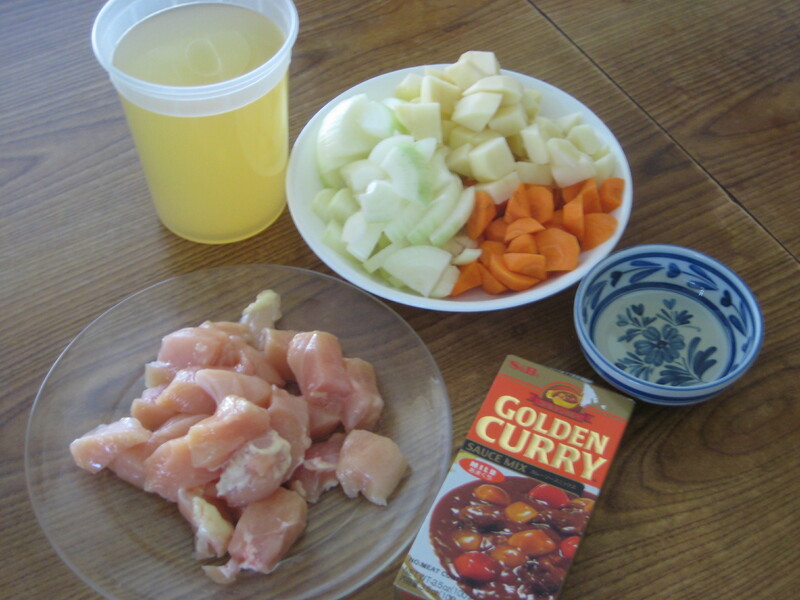 I will be combining two different recipes to make it as simple as possible. 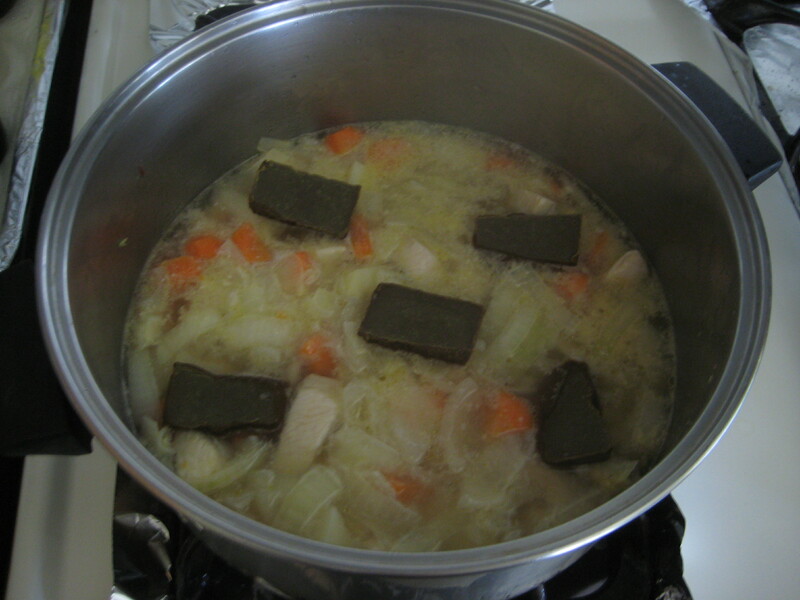 Gogumabap requires a pot or stone pot to cook the dish. 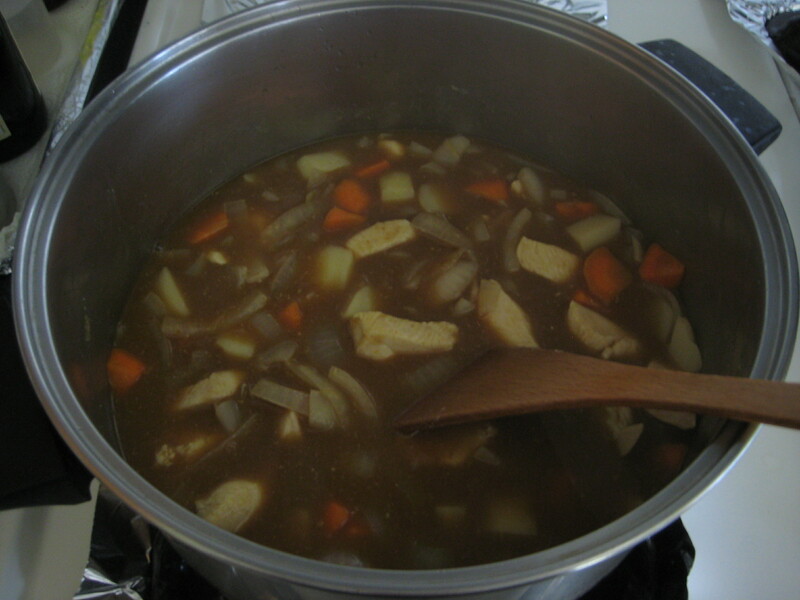 Instead I will be using a rice cooker, like in Sweet Potatoes Rice (地瓜飯). 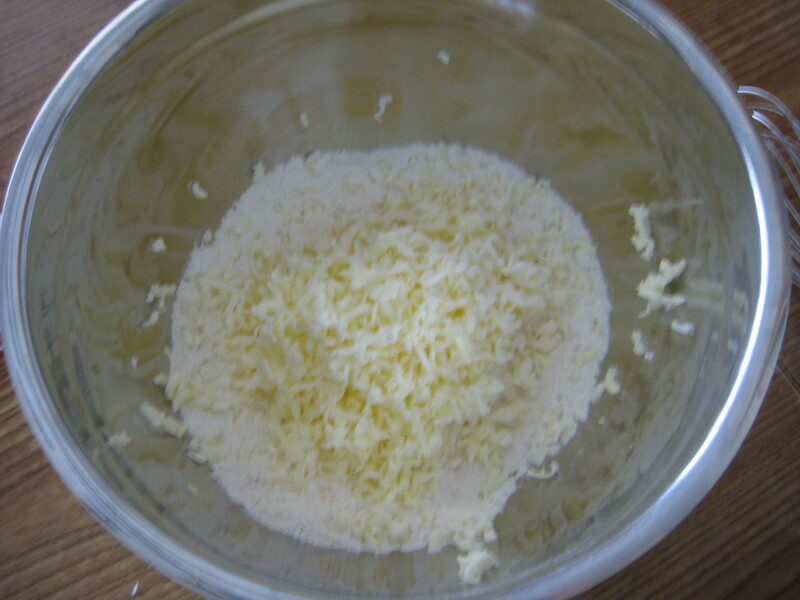 Step 1: Wash the rice and rinse 2-3 times. 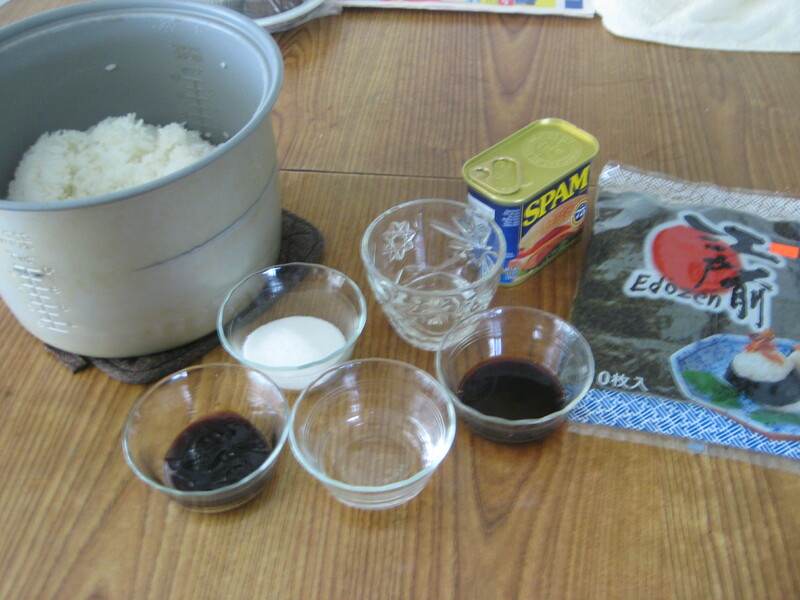 Step 2: Fill the rice cooker according to the instructions of the model with water/broth combination. 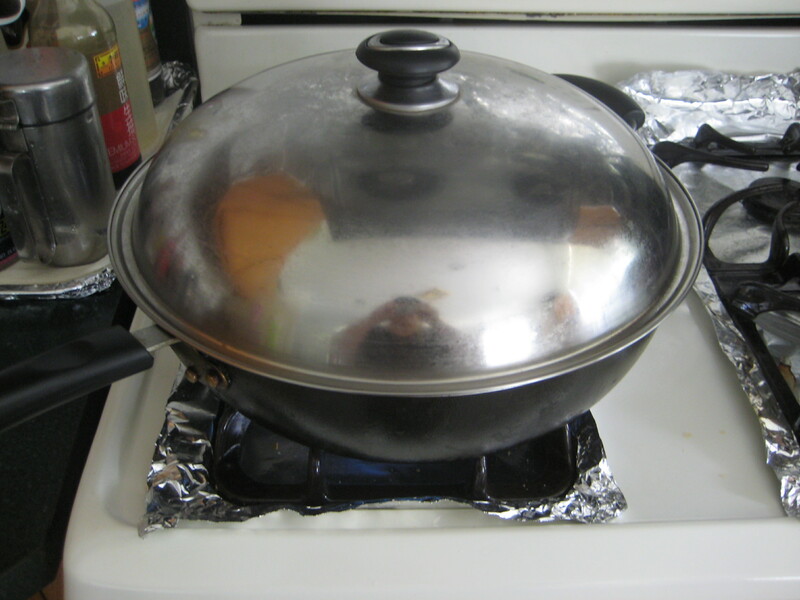 Step 3: Add sweet potatoes to the rice and begin rice cooker. 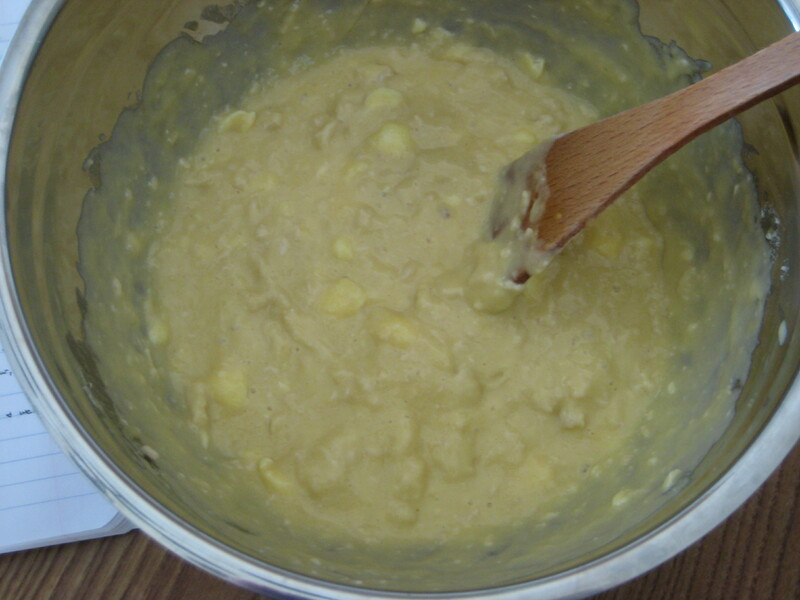 Step 4: Meanwhile, in a small bowl combine the sauce ingredients until well mixed. 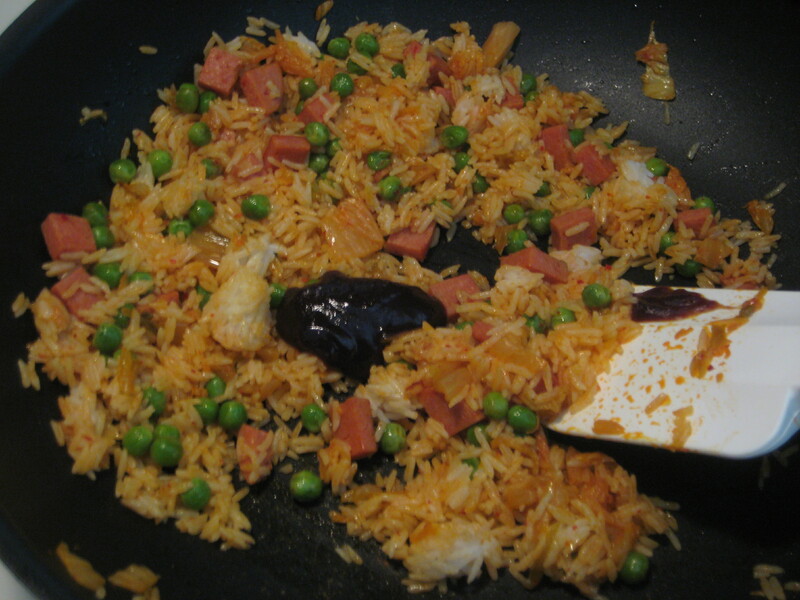 Step 5: Serve sweet potato rice in a serving bowl and spoon the sauce on top. 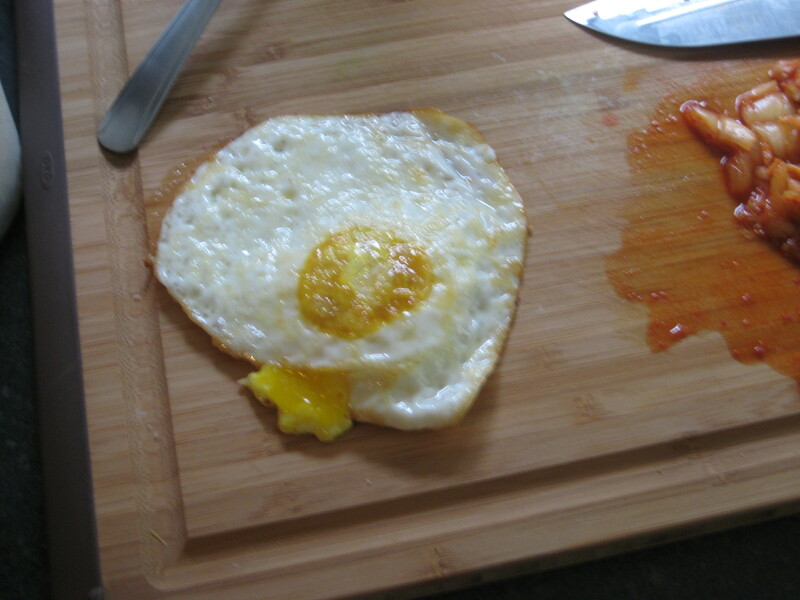 Notes: You can add a fried egg to add a protein to the dish. 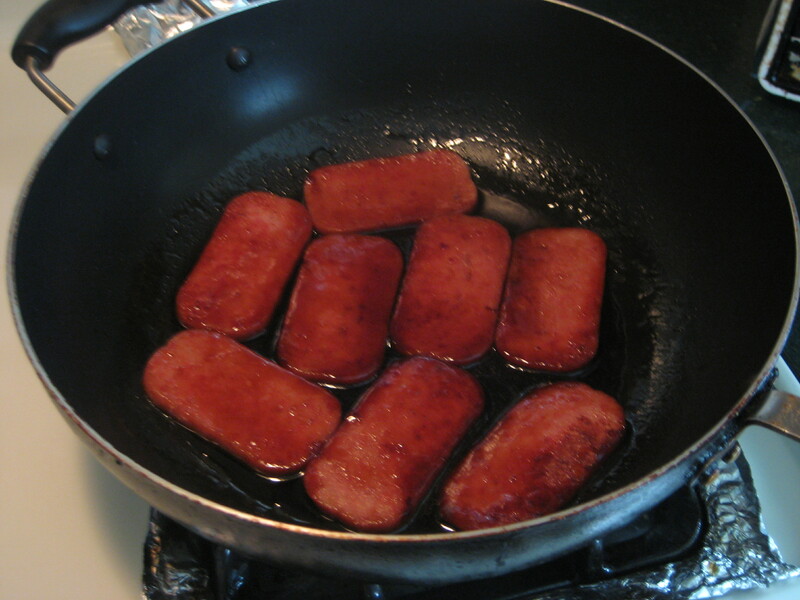 While watching the show “The Best Thing I Ever Ate” I came across Spam Musubi from Mana Bu’s. 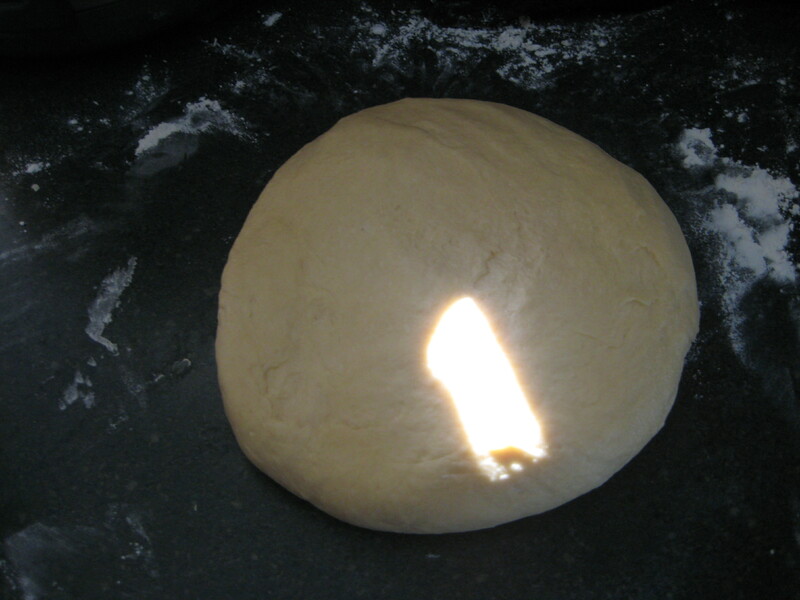 I just had to recreate it. 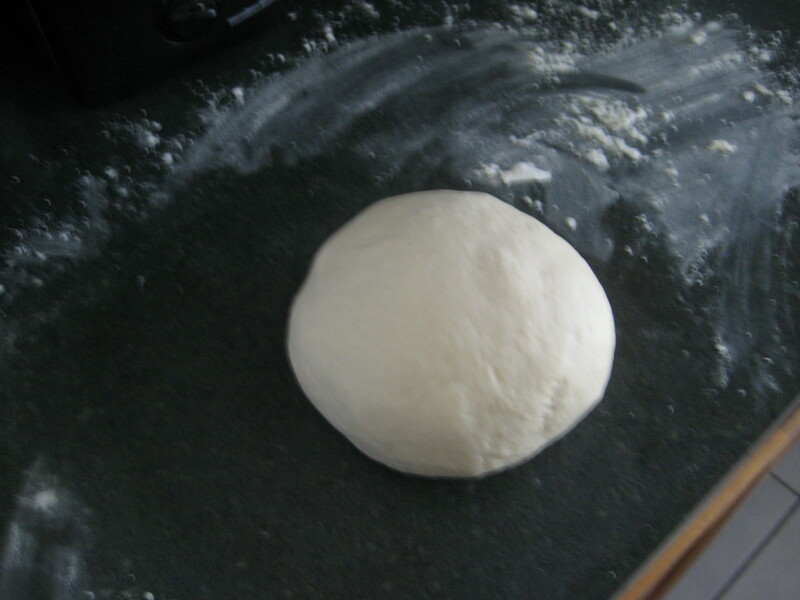 Since I didn’t want to go the conventional route and make it with the traditional mold. 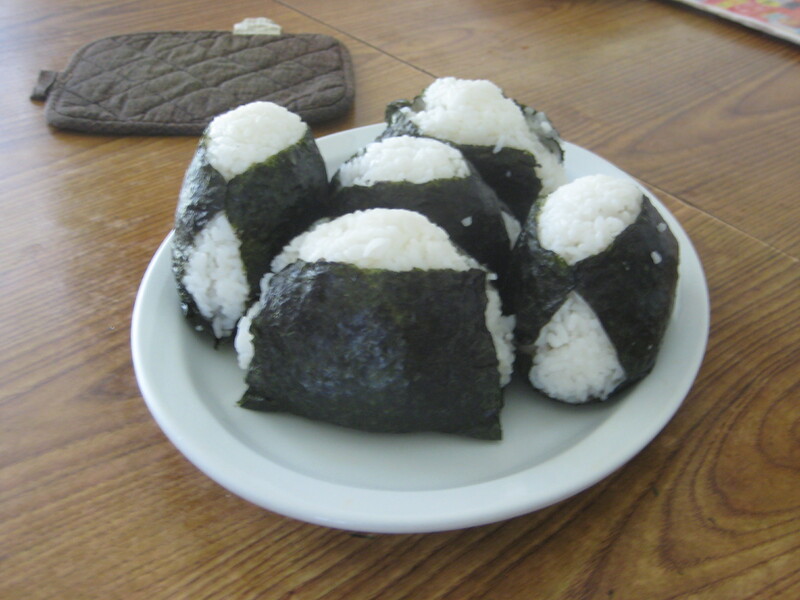 I will be recreating the version on the show, which is similar to an onigiri. 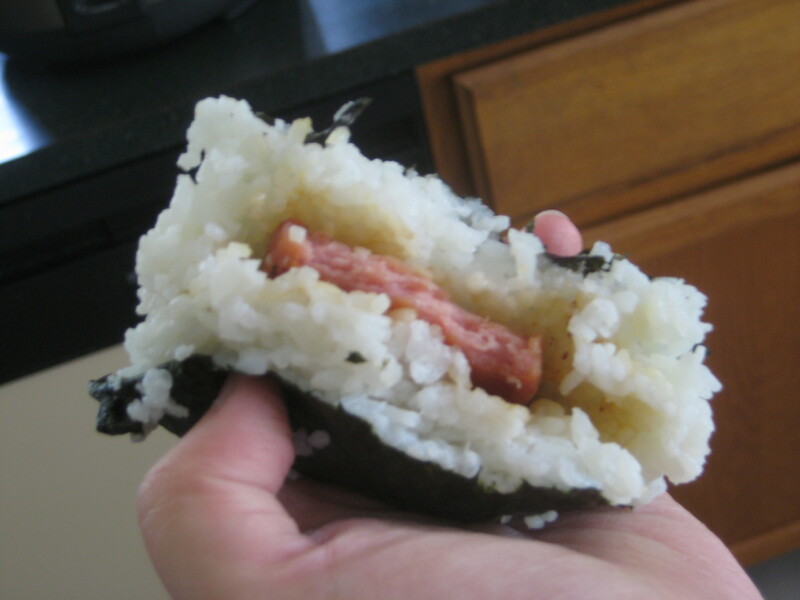 Here is a review of Mana Bu’s Musubi. 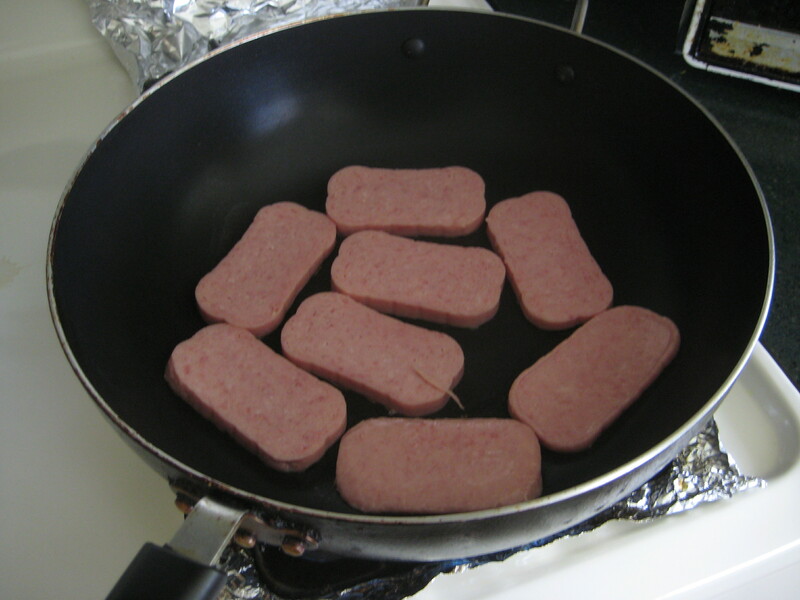 Step 1: Slice the Spam into 1/2 inch slices. 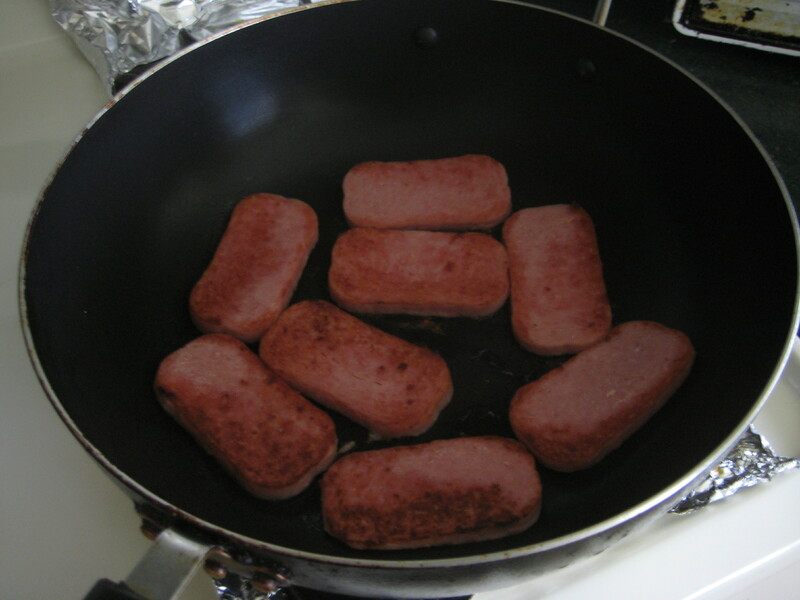 Step 2: Brown the Spam in a skillet over high heat until both sides are browned. 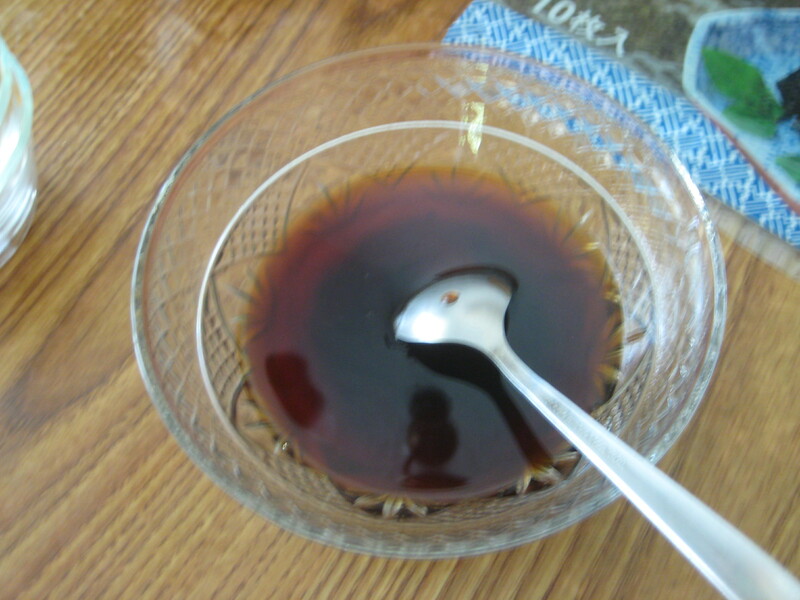 Step 3: In a small bowl, combine the soy sauce, oyster sauce, mirin, water, and sugar until the sugar is dissolved. 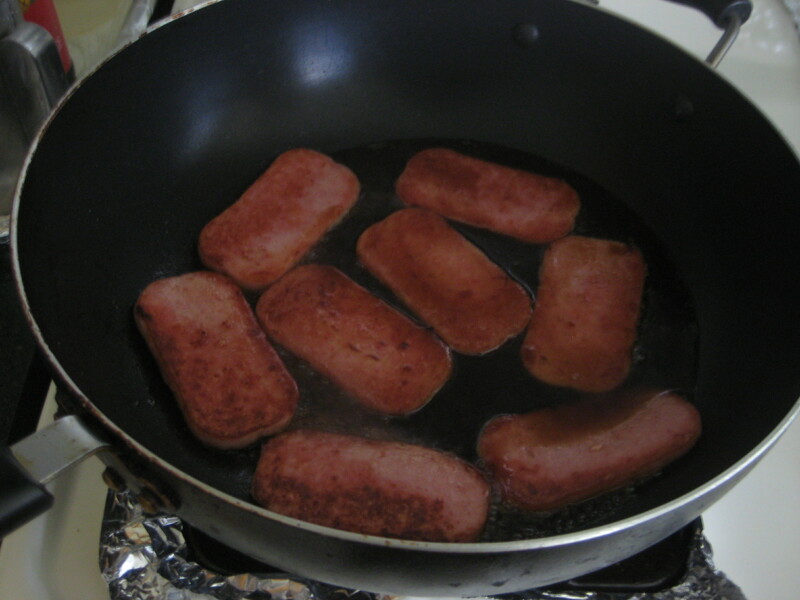 Step 4: Once the Spam is done browning, turn the heat down to low and pour in the sauce mix. 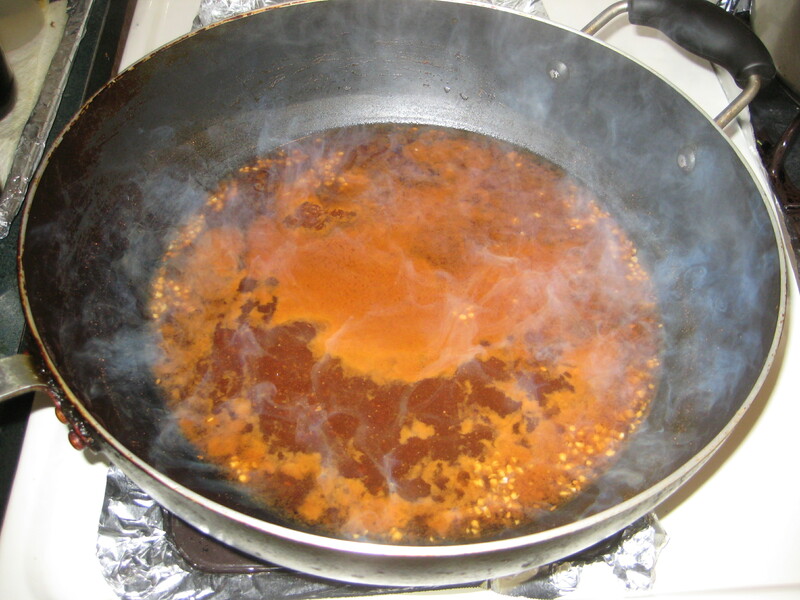 Step 5: Simmer the sauce gently for 20-30 minutes, the sauce will have thicken as well. 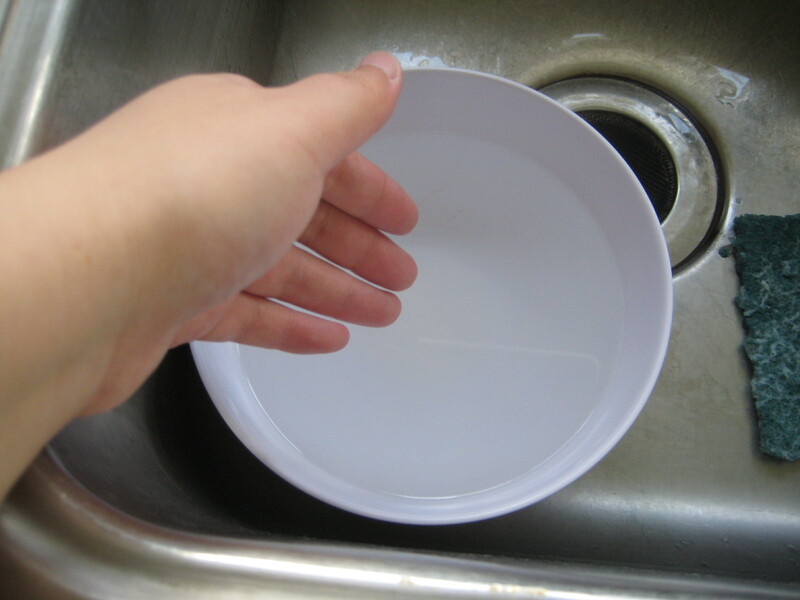 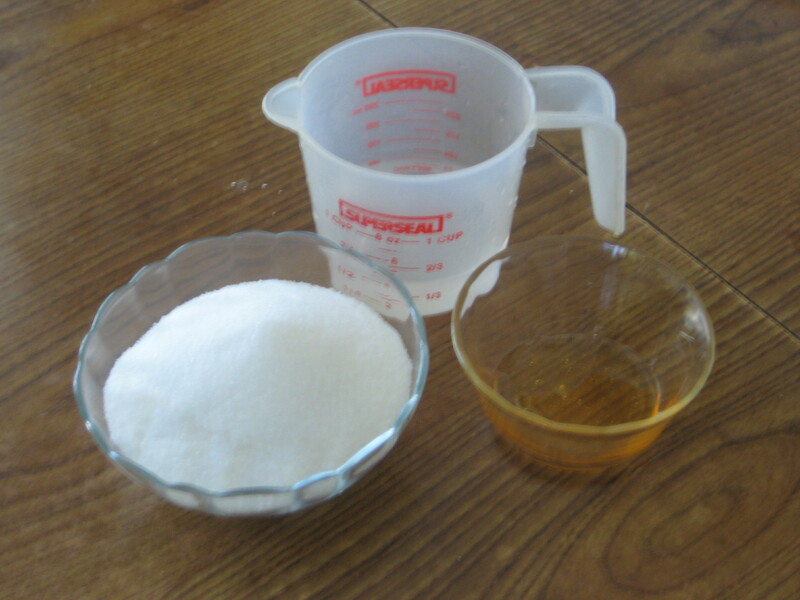 Step 7: Wet your clean hands with cold water sprinkle with salt. 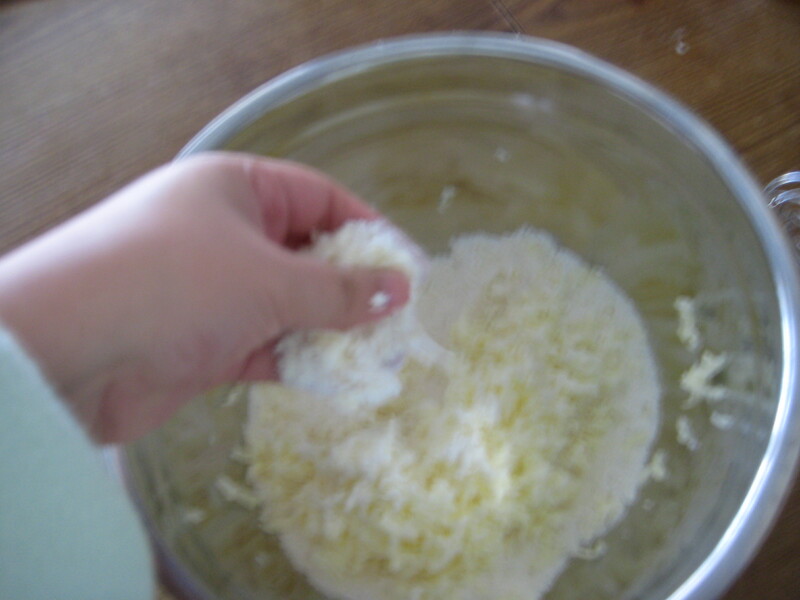 Step 9: Make a dent in the middle of the rice with your other hand. 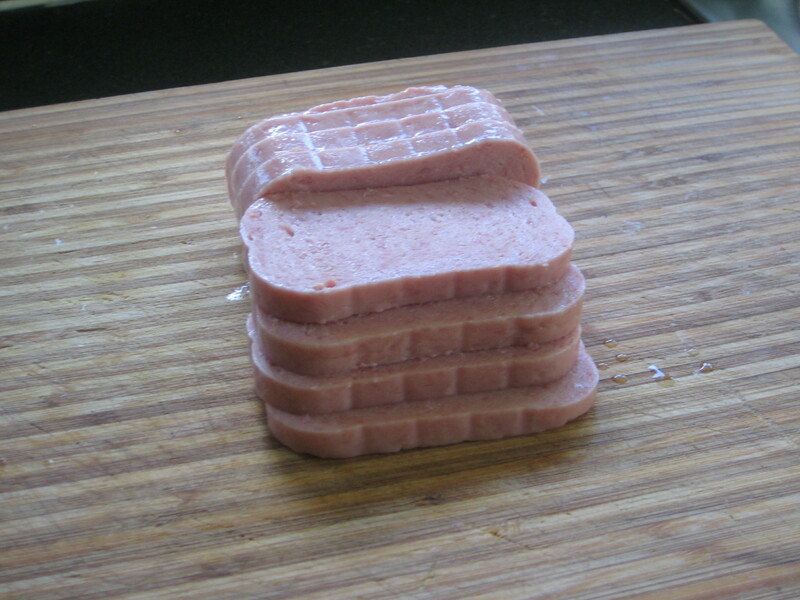 Step 10: Place in 1 piece of the Spam in the dent. 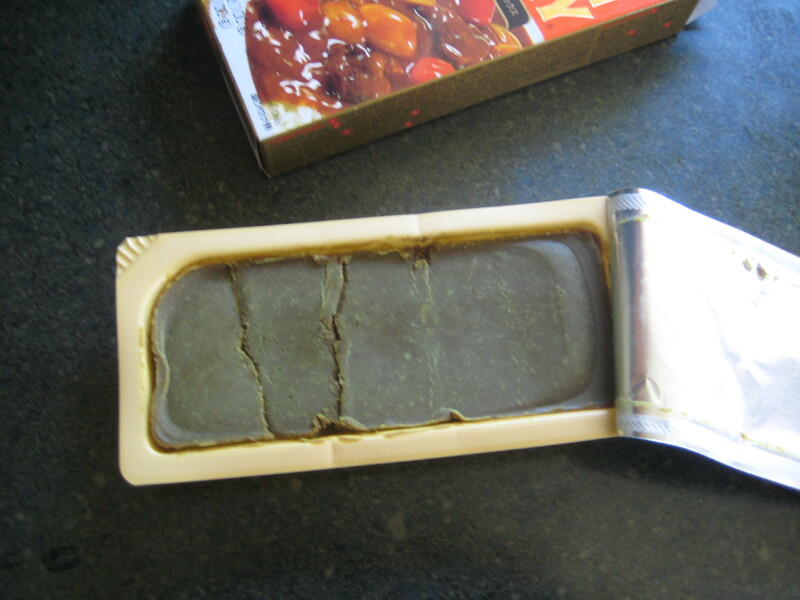 Step 12: Wrap the musubi with 1-2 strips of nori seaweed. 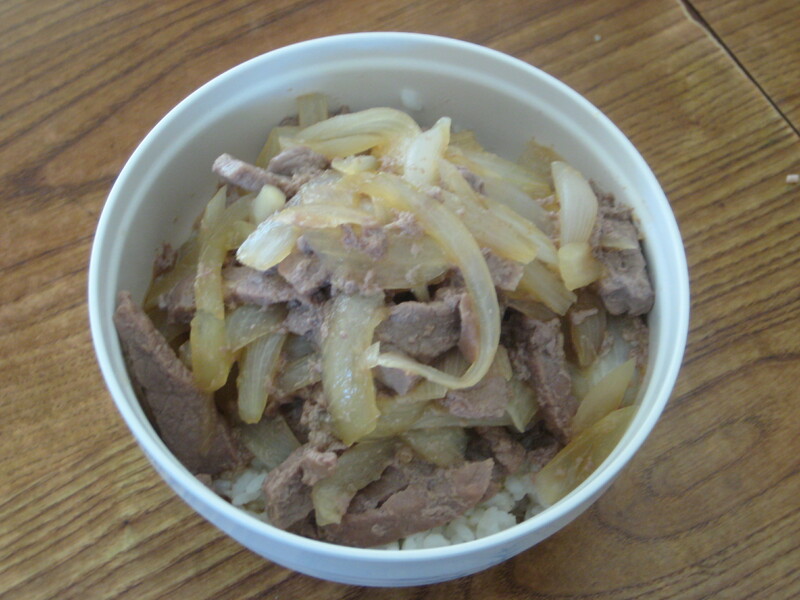 While living in Miami I had tried my very first beef bowl and it blew my mind. 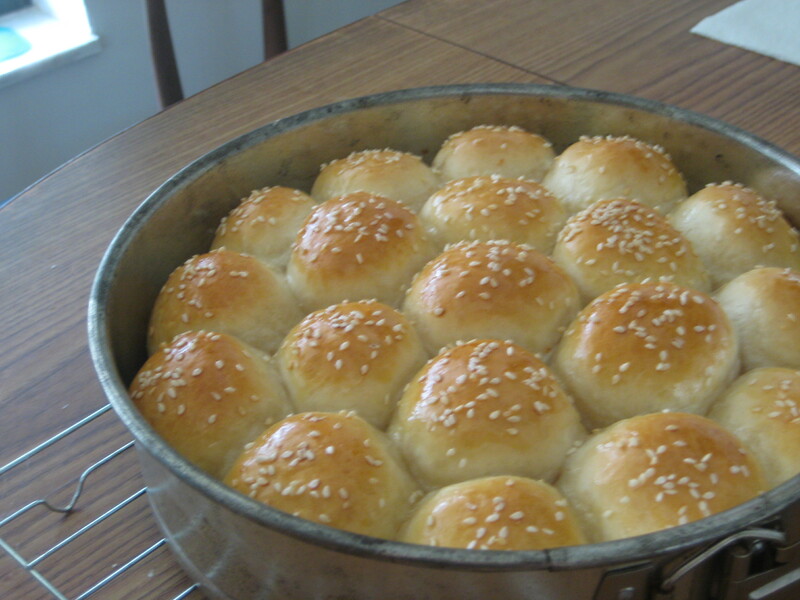 I just had to make some. 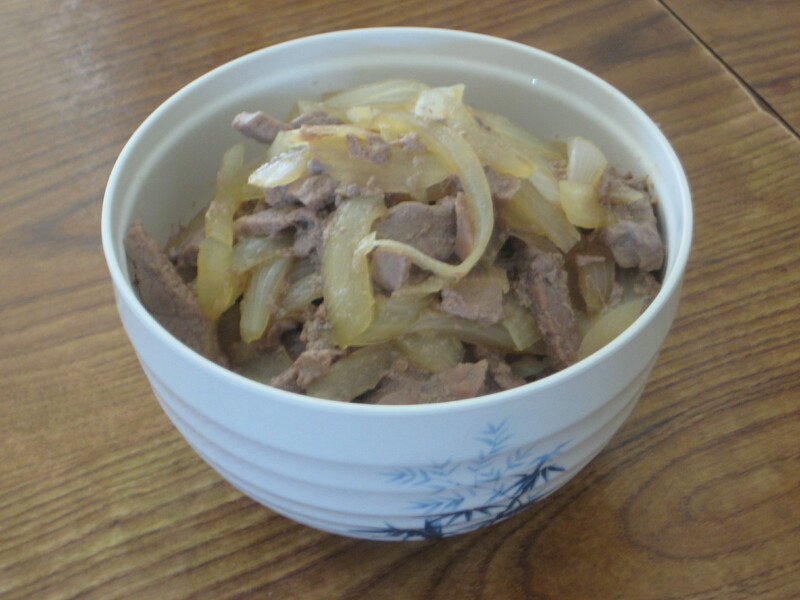 So I will be attempting to recreate a traditional beef bowl today. 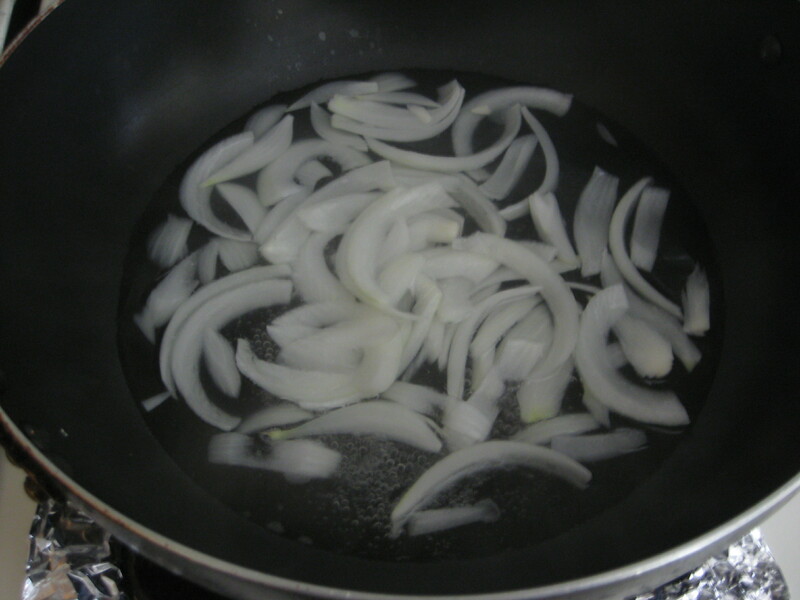 Step 1: In a large pan, add in the onion and hot water and bring to a boil. 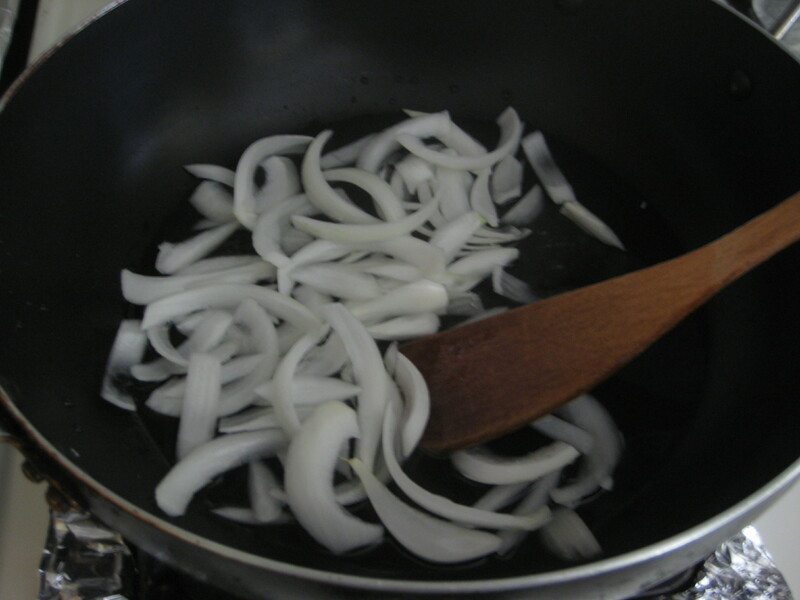 Step 2: Allow to boil for 7 minutes, or until the onion is soft. 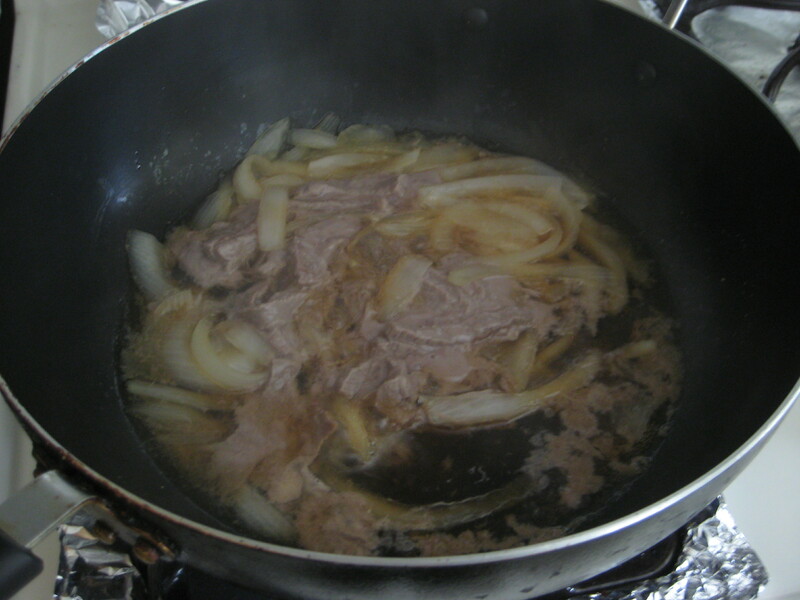 Step 3: Add the sake, sugar, salt, soy sauce, ginger and beef; stir, cover, and boil for 8-10 minutes over medium heat. 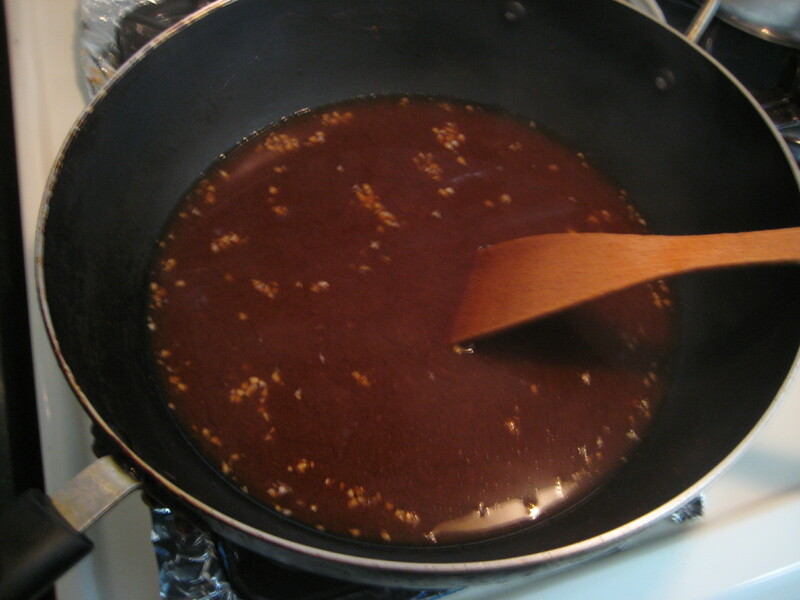 Step 4: Taste and add more sugar and/or soy sauce if needed. 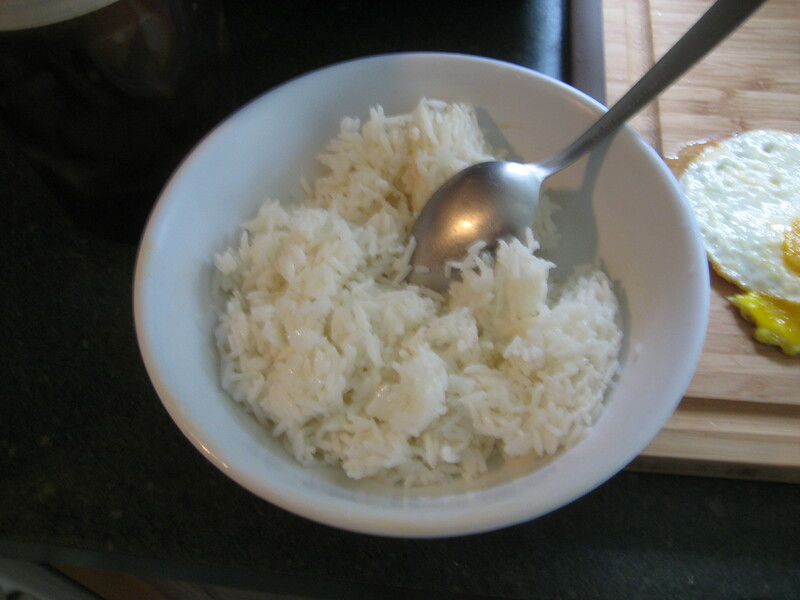 Step 5: Serve over the steamed rice. 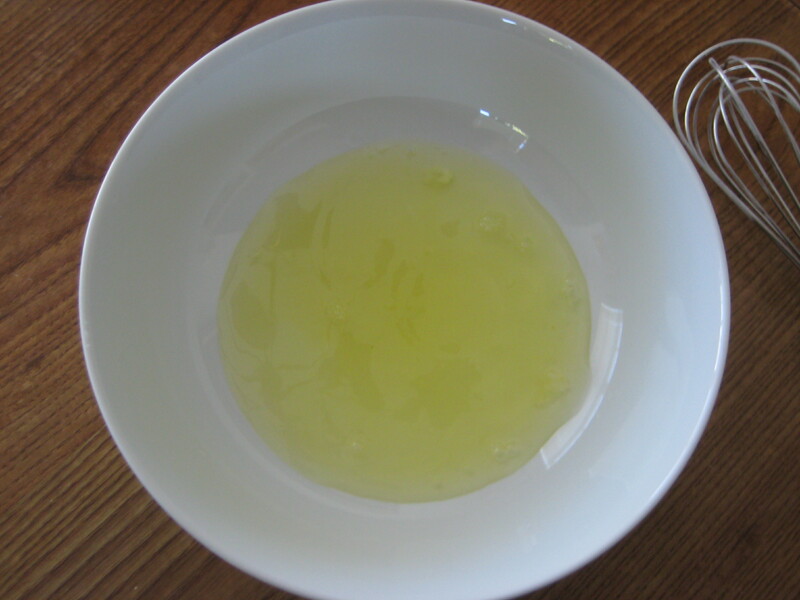 Notes: Leftover broth can be used for dipping. 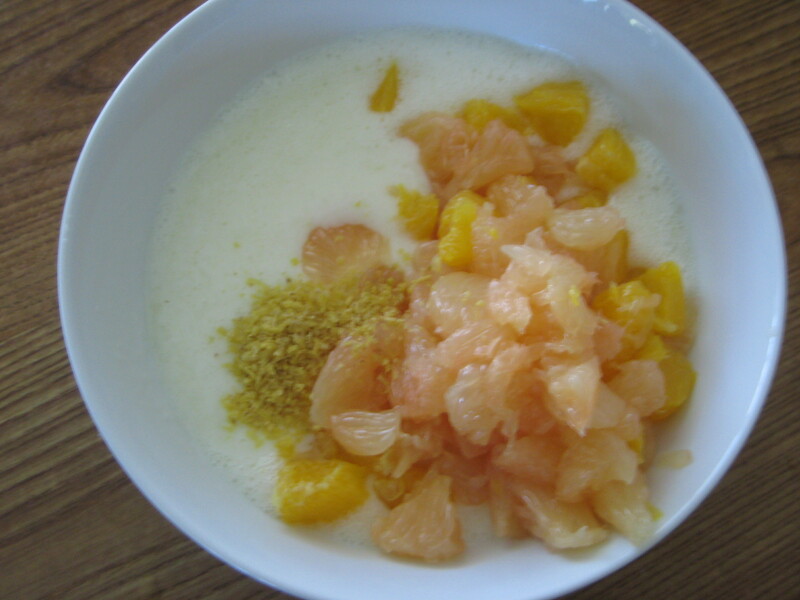 Going through a nostalgic moment this week and bought a few grapefruits for breakfast or to just snack on during the day. 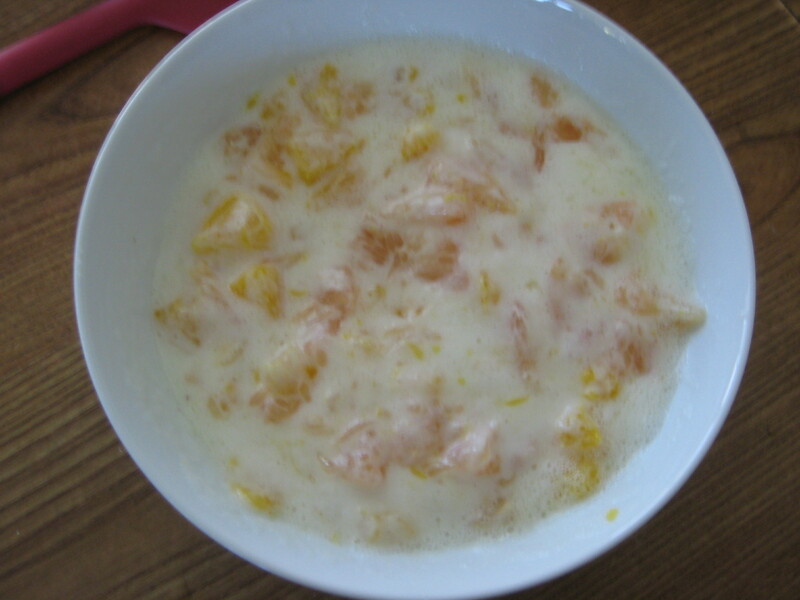 I remember sitting in the kitchen on the weekends as a child and spooning on teaspoons of sugar on top of grapefruit half and sharing it with my mom. 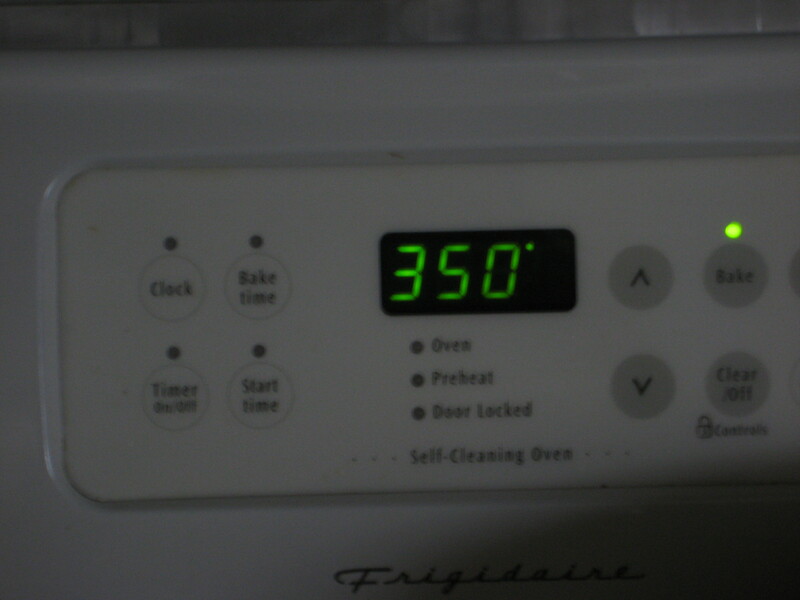 It must have been a warm day with a bit of wind because the kitchen was brightly lit and the windows were wide open. 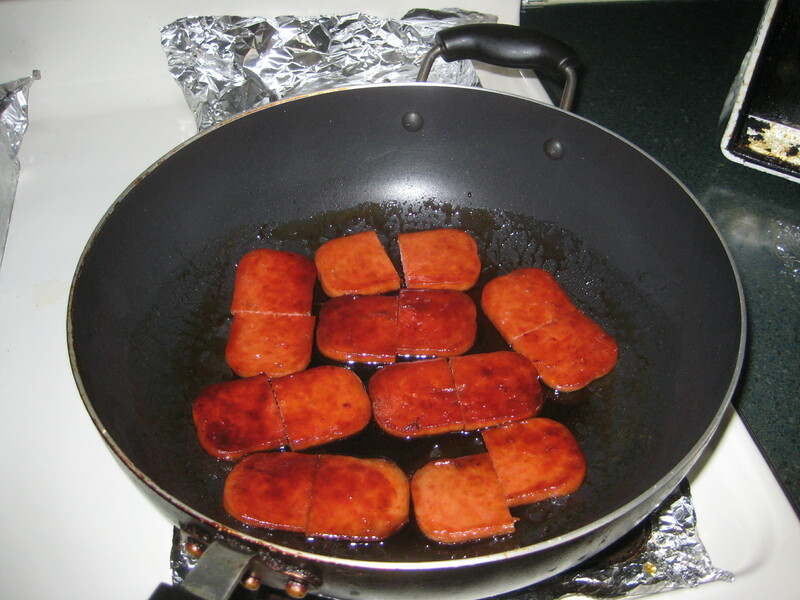 When these memories hit me I just had to buy some grapefruits. 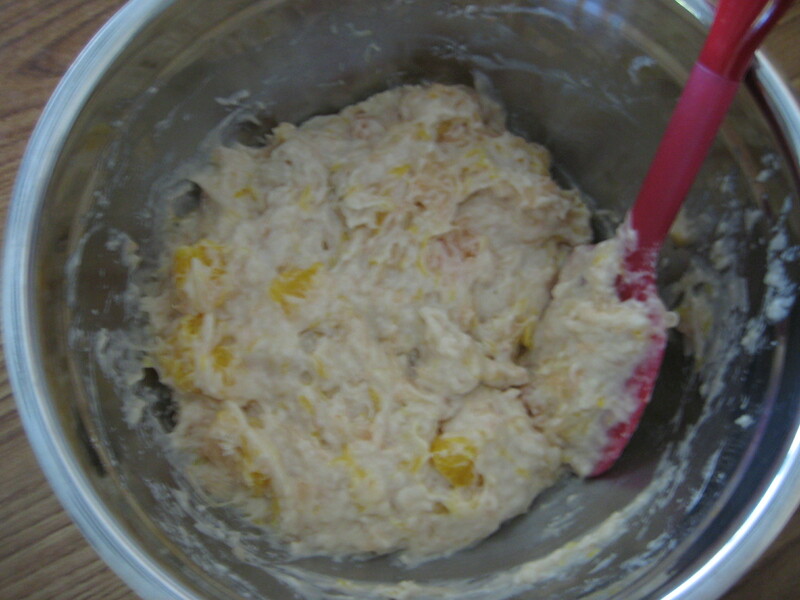 I got some and after about 4 days of eating grapefruit I still had one left and I didn’t feel like eating it with just plain old sugar. 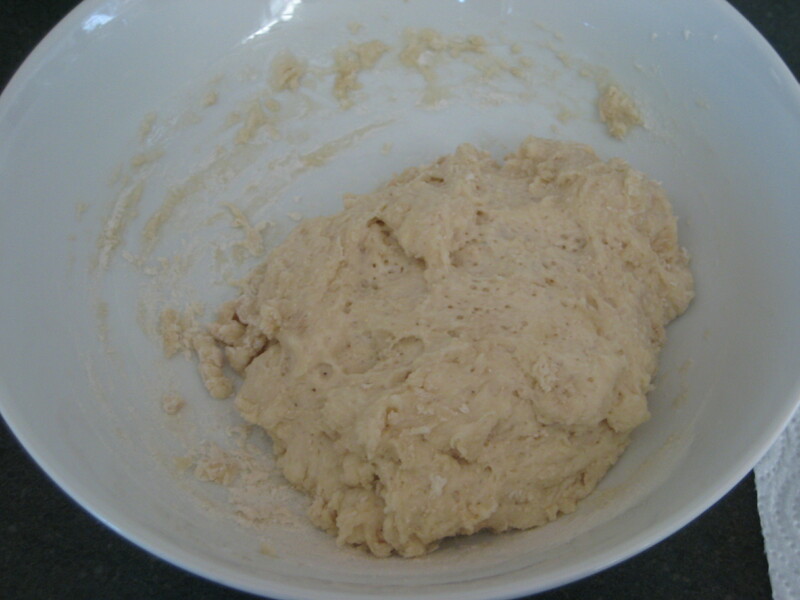 So I figured I could incorporate it into a baked good of some sort. 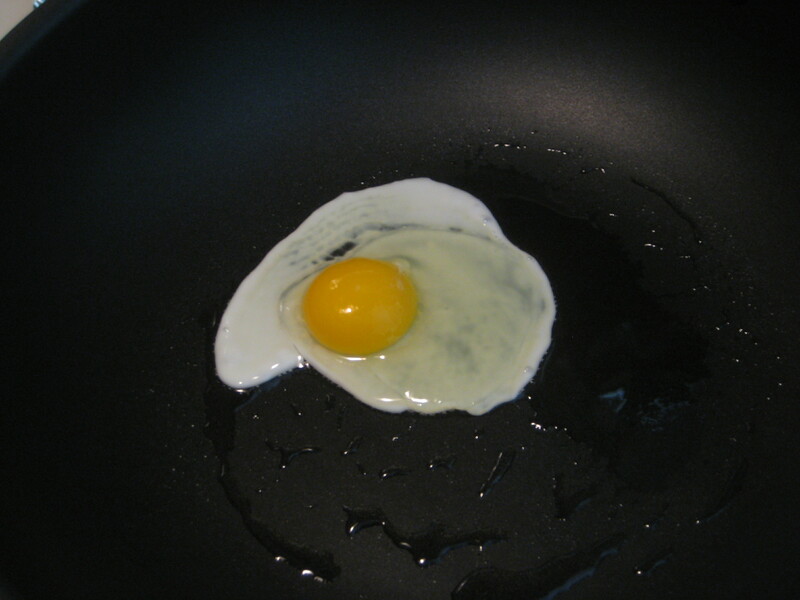 Nothing to fancy or anything. 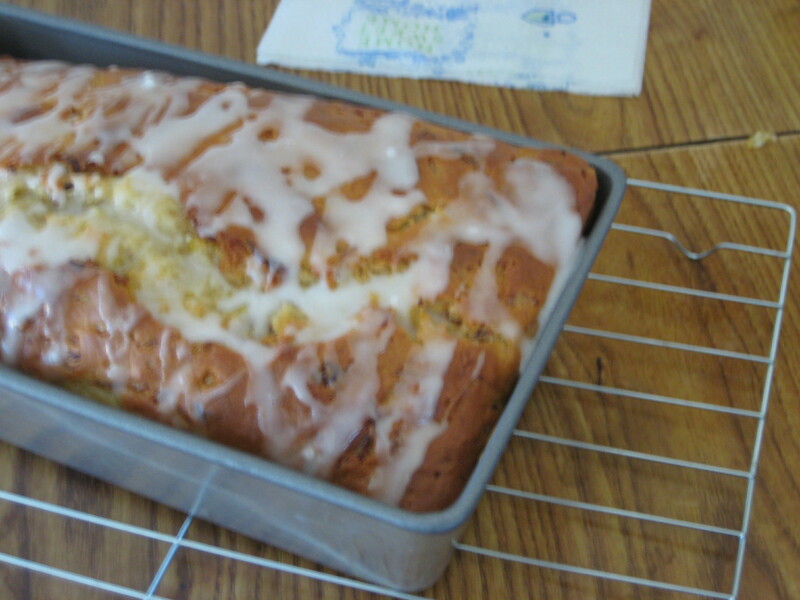 Just something easy to make and will only require 1-2 grapefruits. 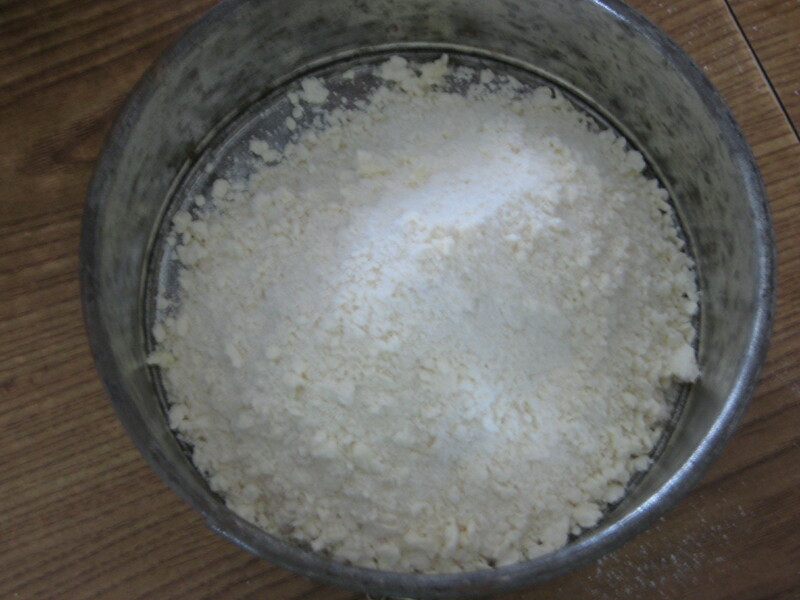 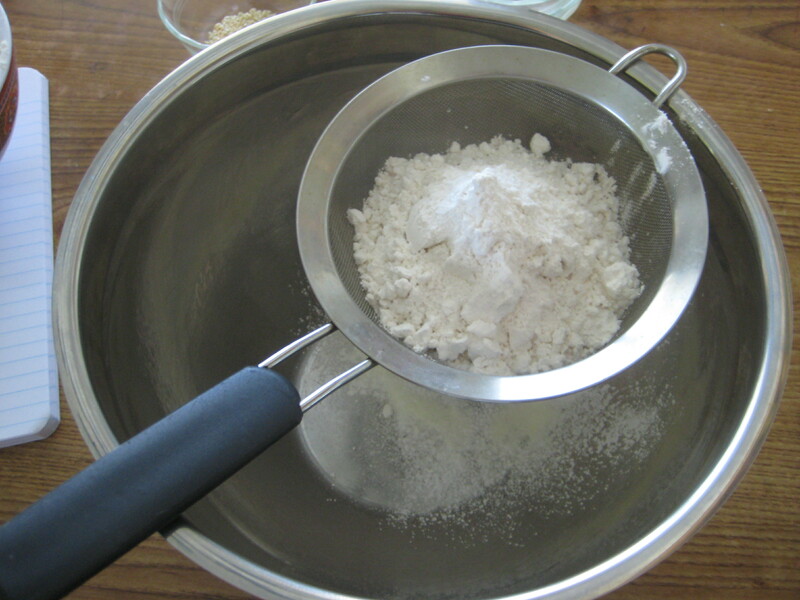 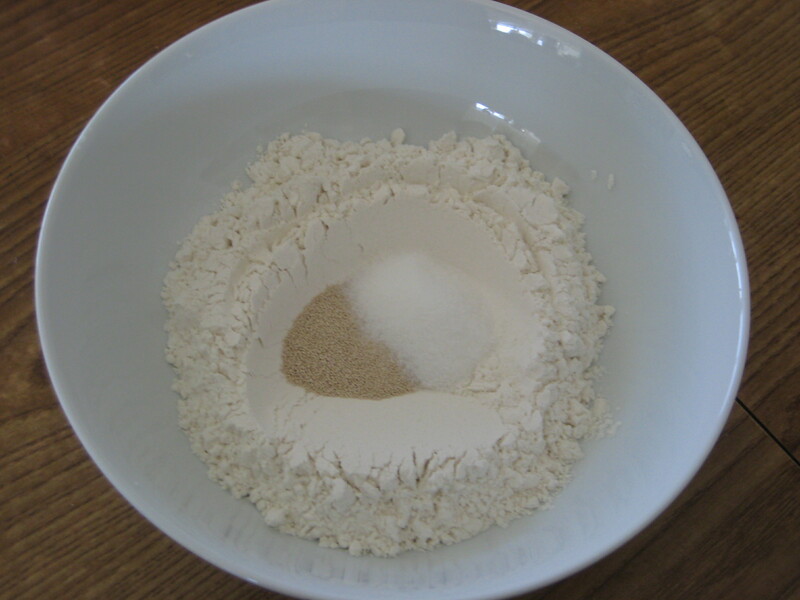 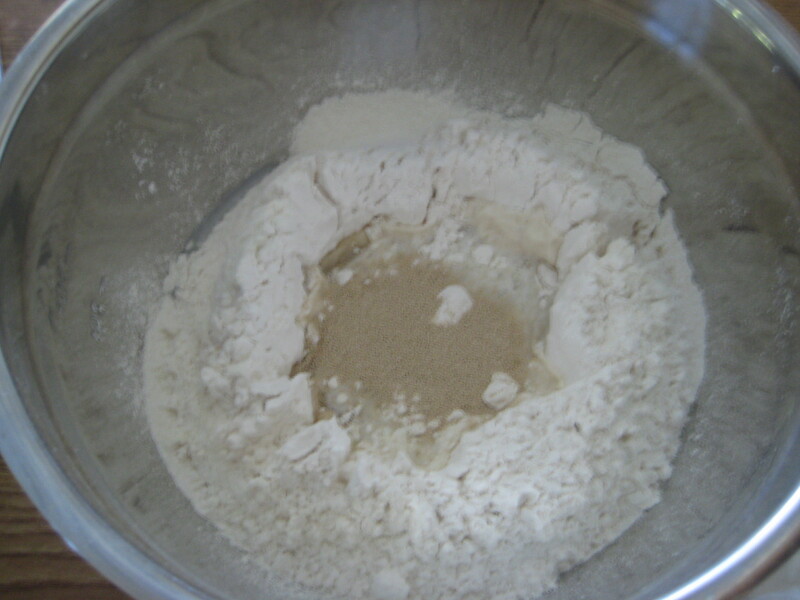 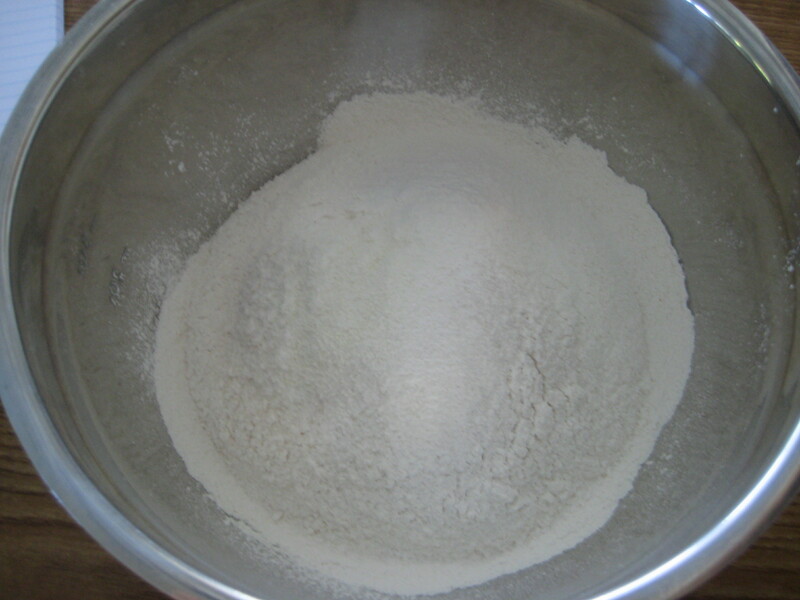 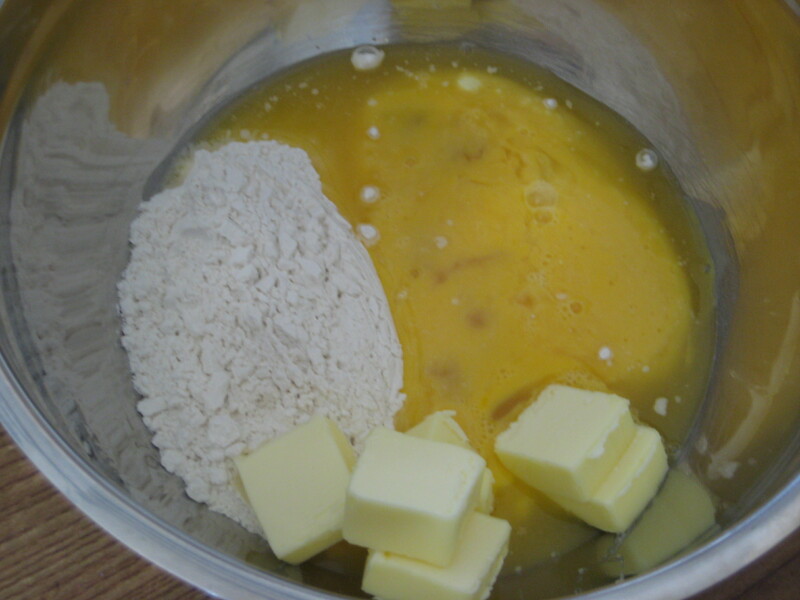 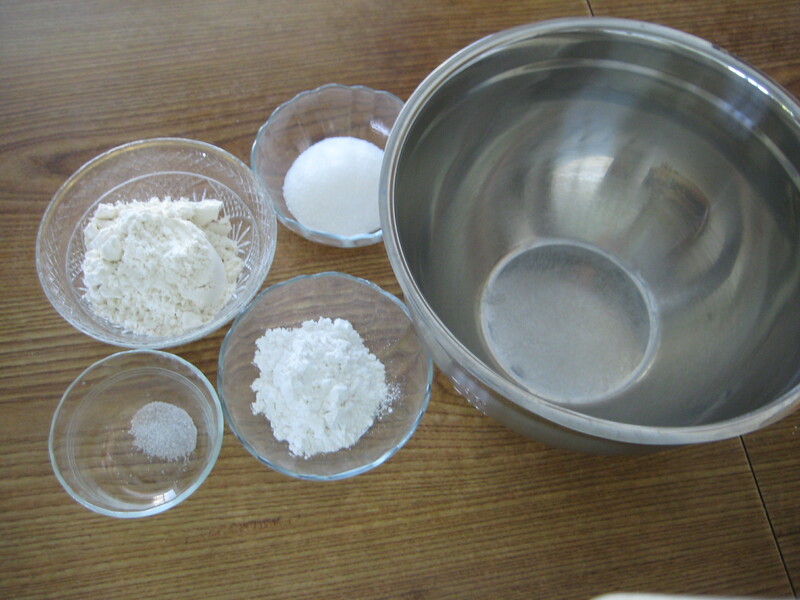 Step 2: In a large bowl, sift together the flour, ginger, sugar, baking powder, baking soda, and salt; set aside. 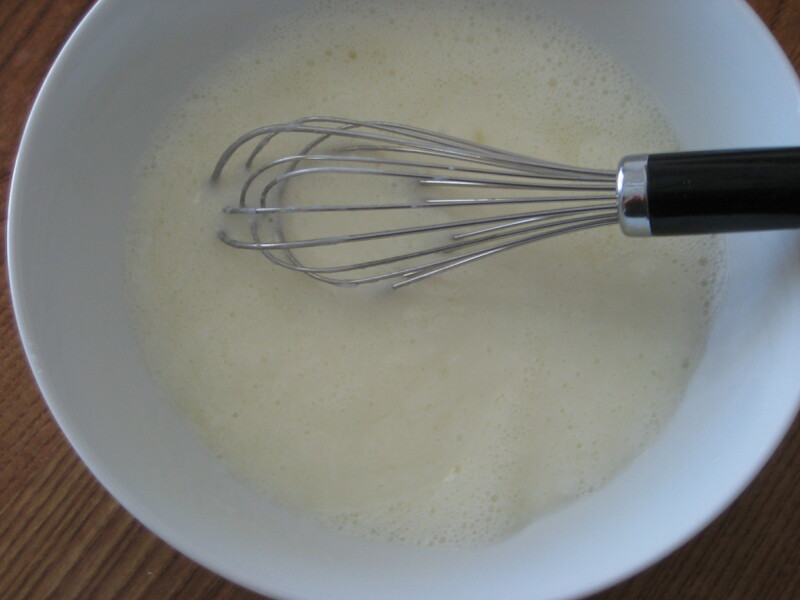 Step 3: In a medium bowl, add the egg whites and whisk them until they become frothy. 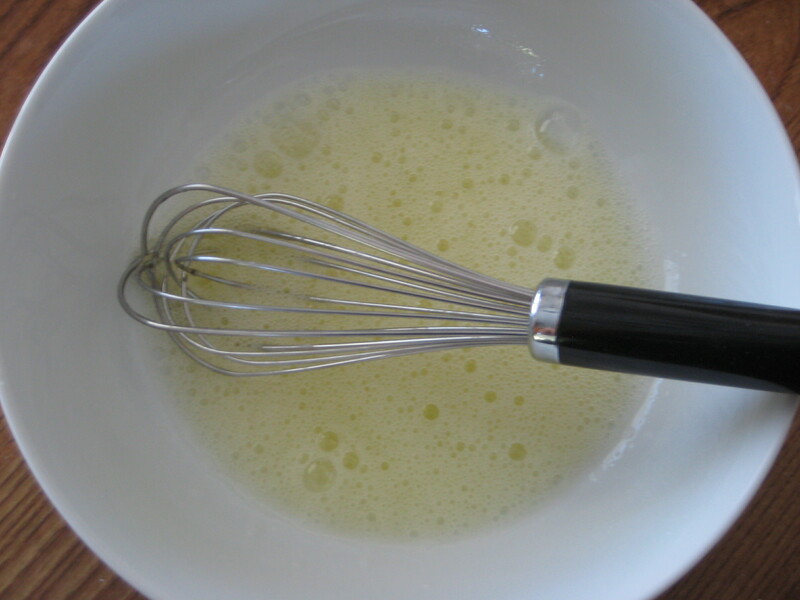 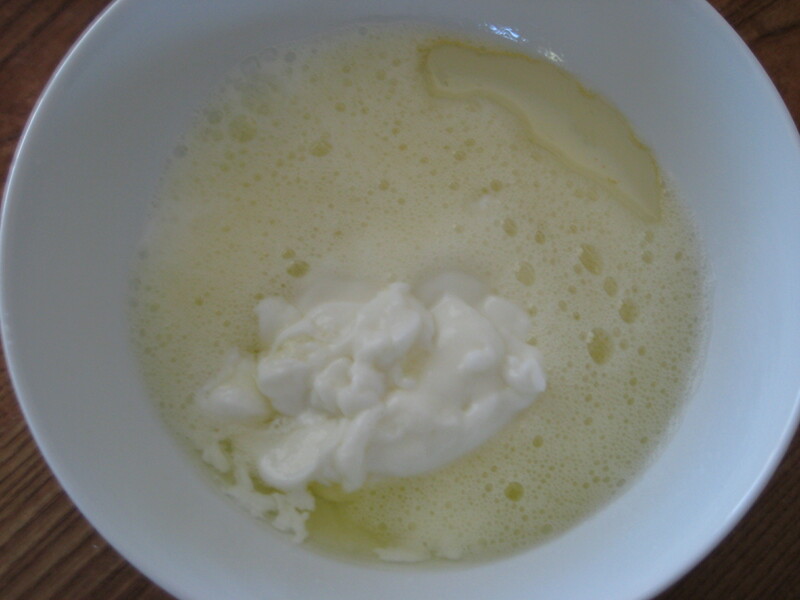 Step 4: Add in the yogurt, milk, and oil; whisk together until combined. 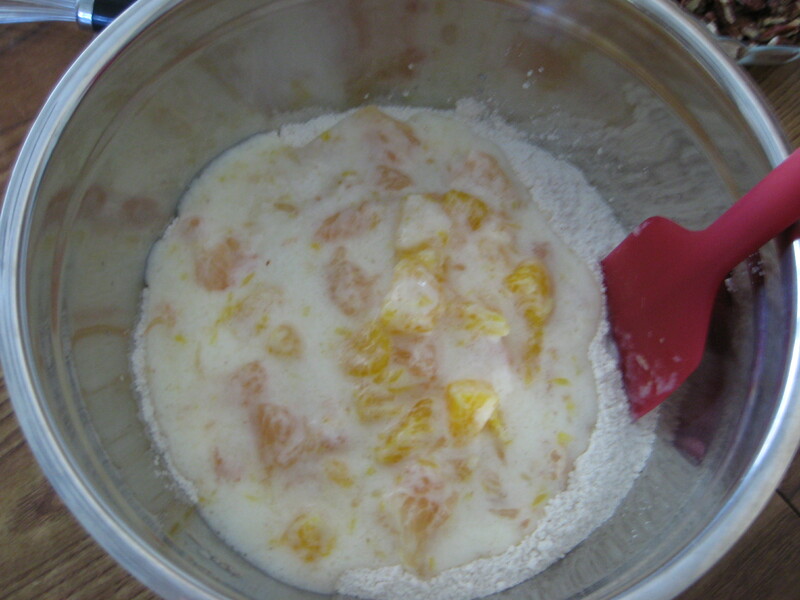 Step 5: Stir in the grapefruit pieces and zest. 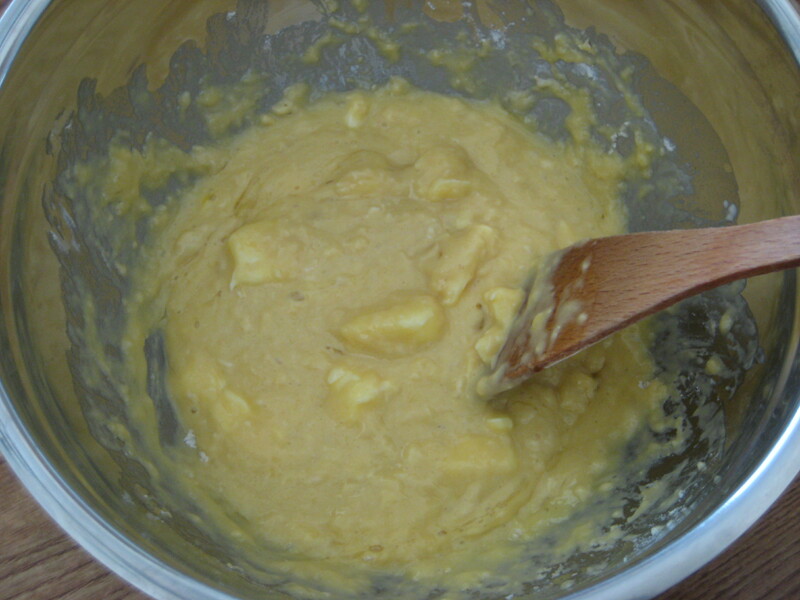 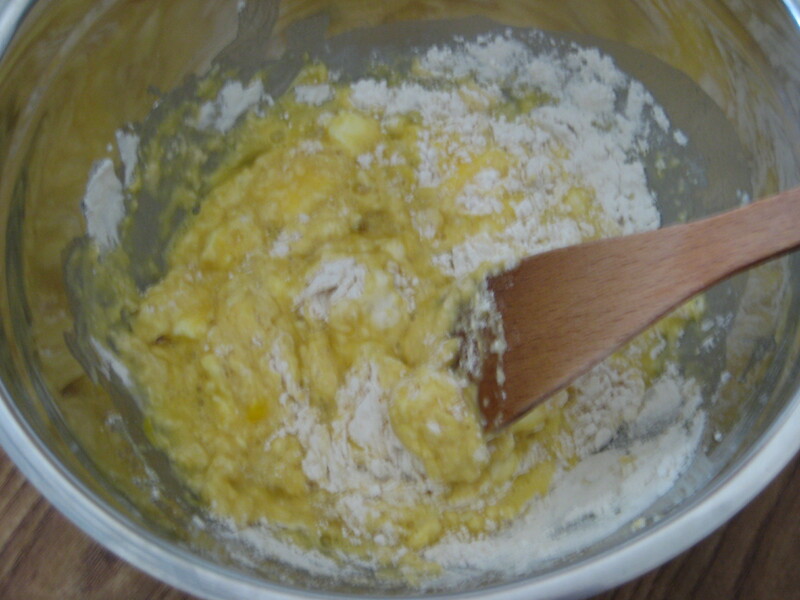 Step 6: Fold the egg mixture into the flour mixture until no lumps. 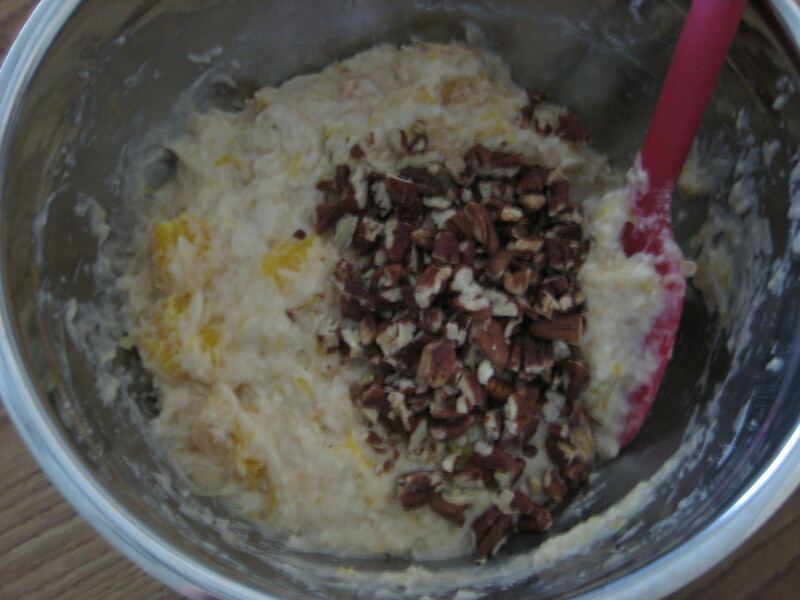 Step 7: Fold in the pecans. 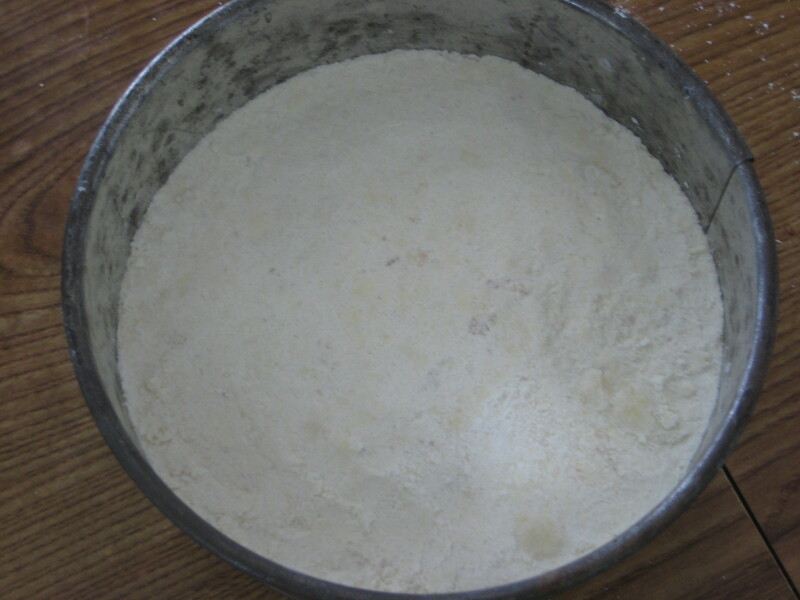 Step 8: Pour into the prepared loaf pan. 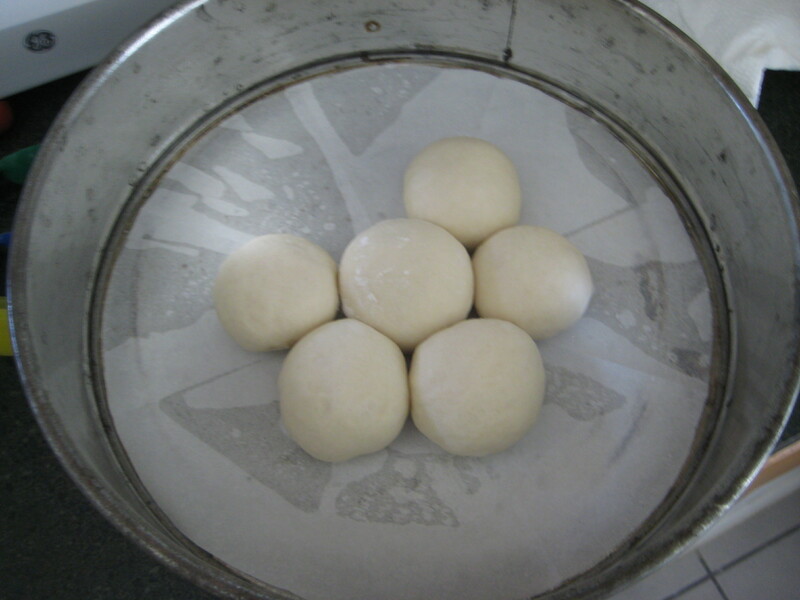 Step 9: Bake for 1 hour 30 minutes, or until a deep golden brown around the edges and a toothpick inserted in the centers comes out clean. 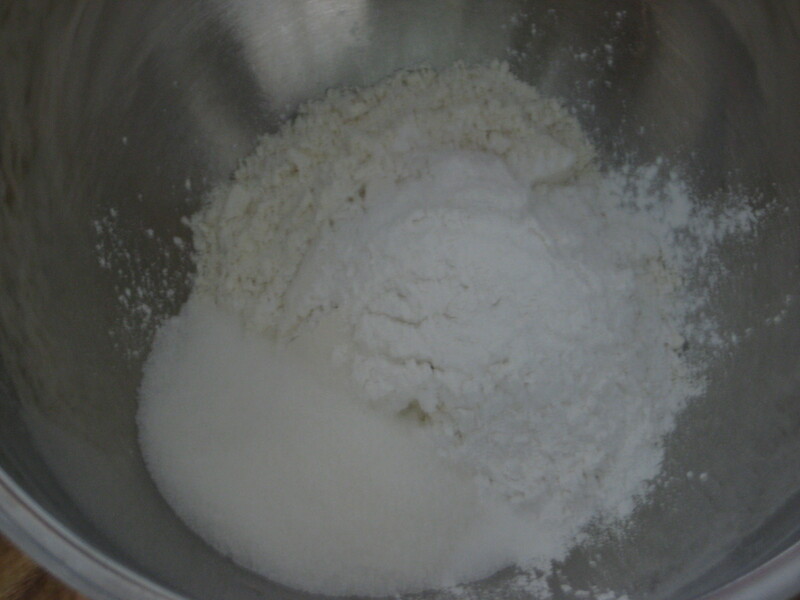 Step 2: Stir in additional 1/2 tsp. 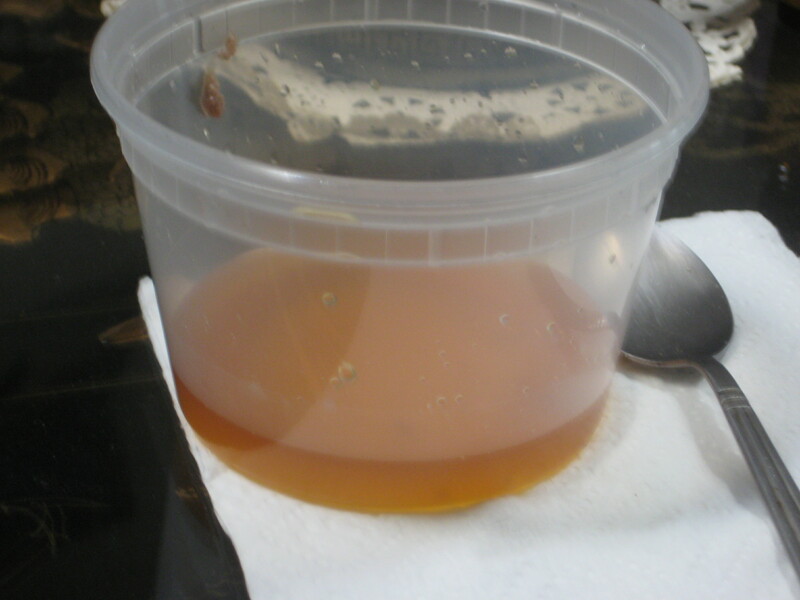 of juice to achieve a thick, but pourable consistency. 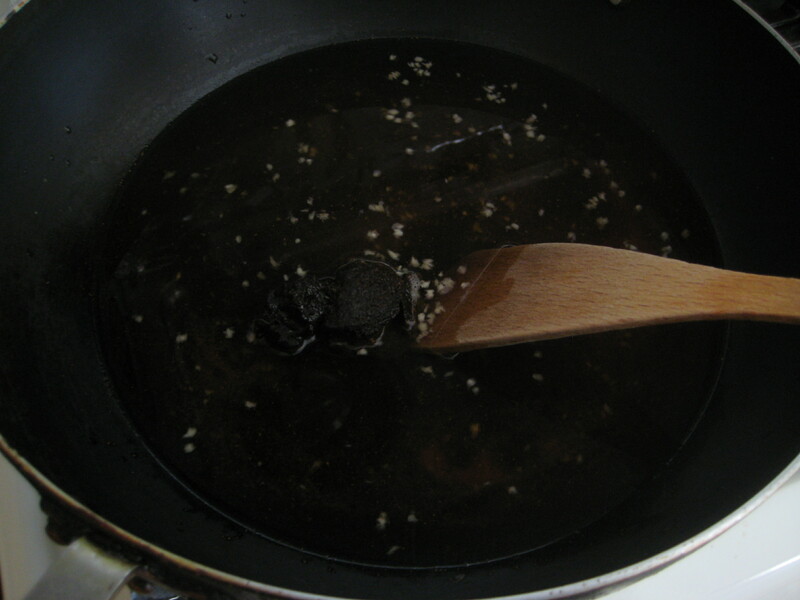 Step 3: Add 1/2 tsp. 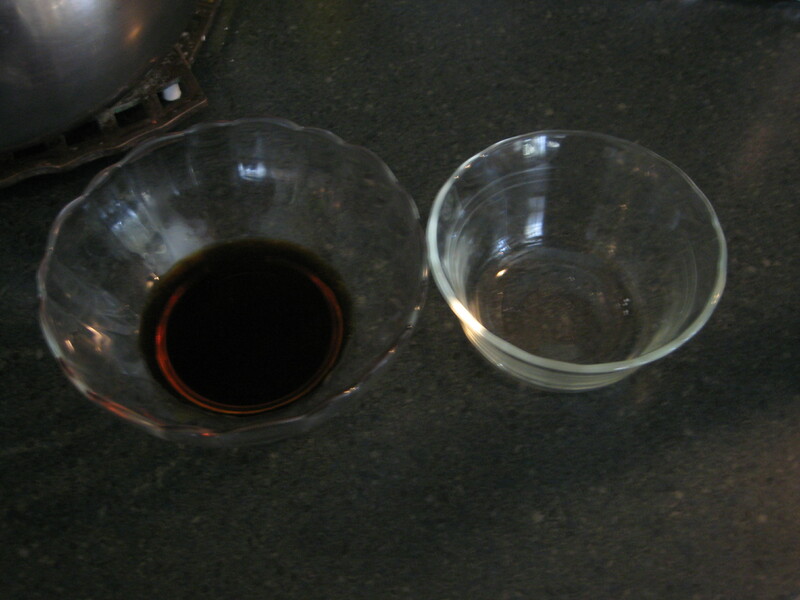 of juice in drops if necessary. 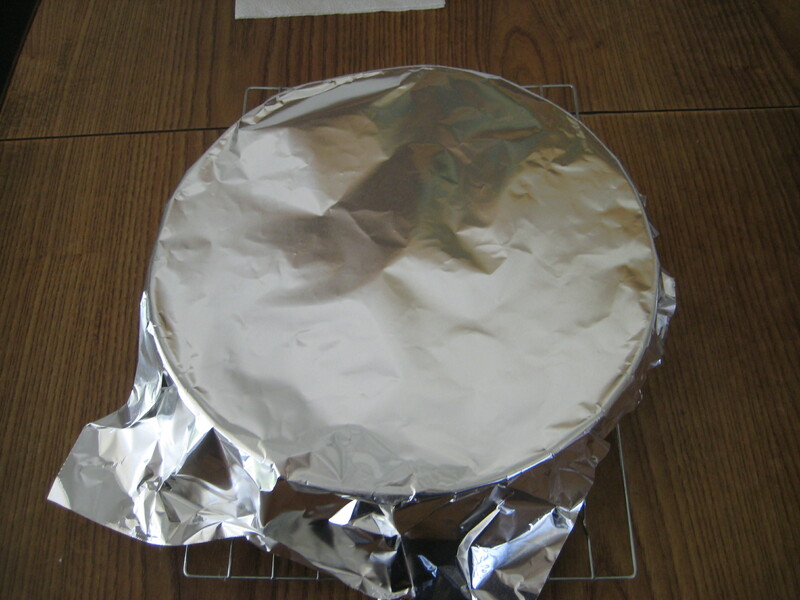 Step 4: Place a piece of foil beneath the wire rack. 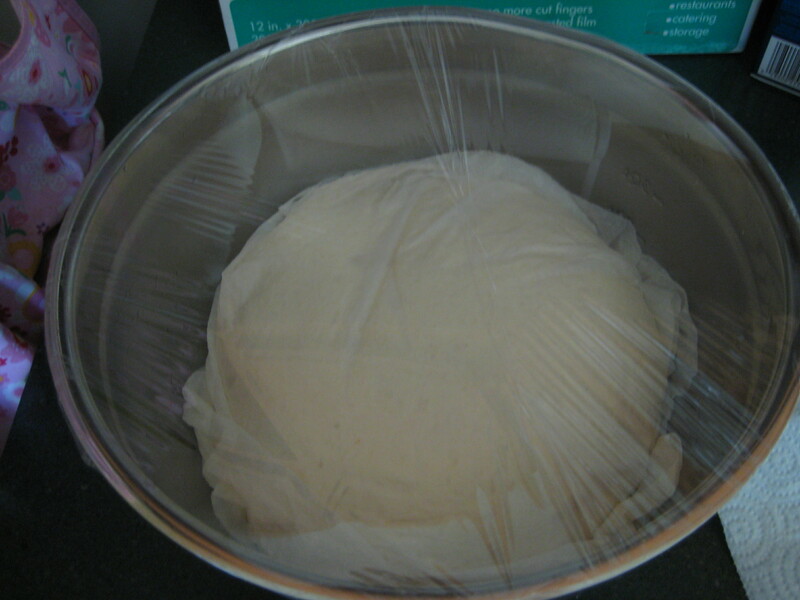 Step 5: Drizzle glaze over the top of the loaf. 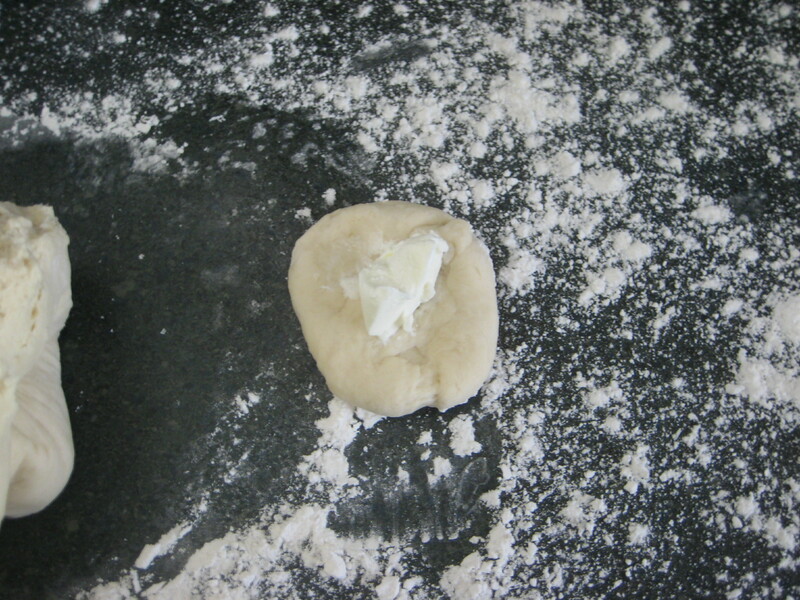 Step 6: Allow the glaze to set before slicing. 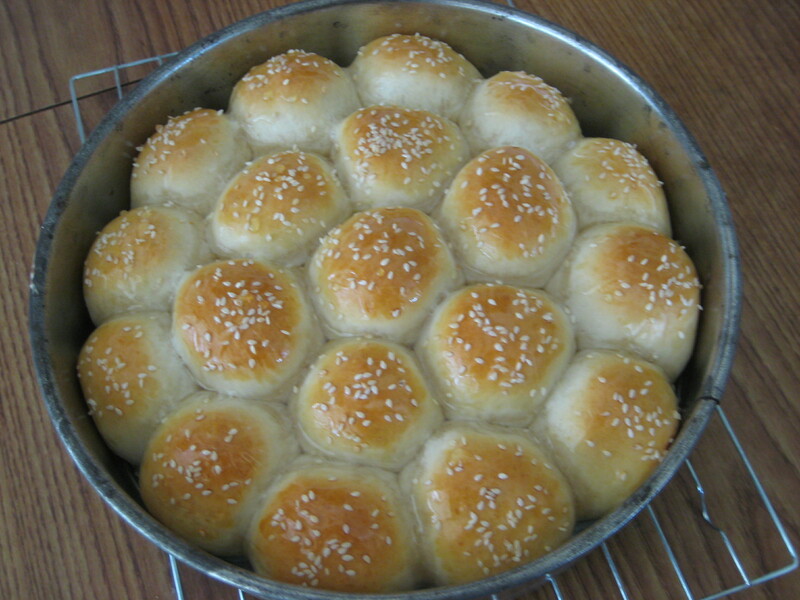 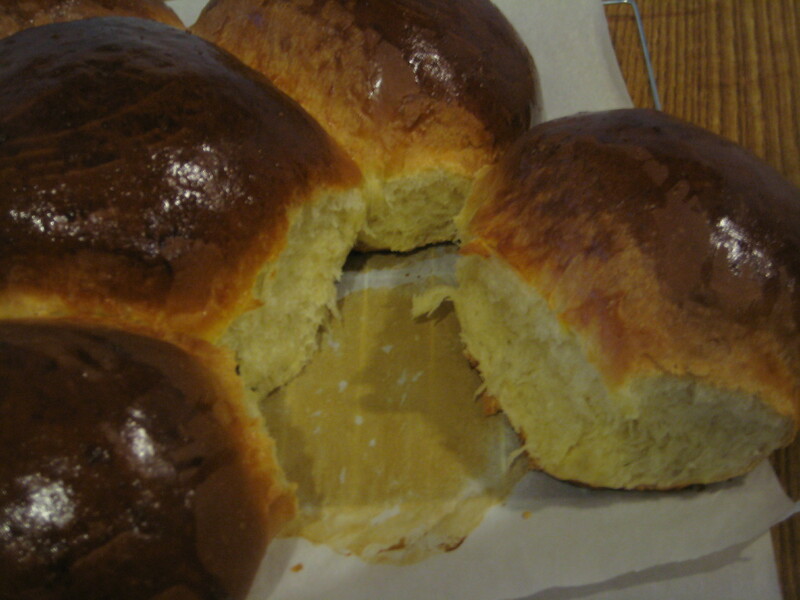 Coming across a brioche recipe that looked really pretty I wanted to make it sometime soon. 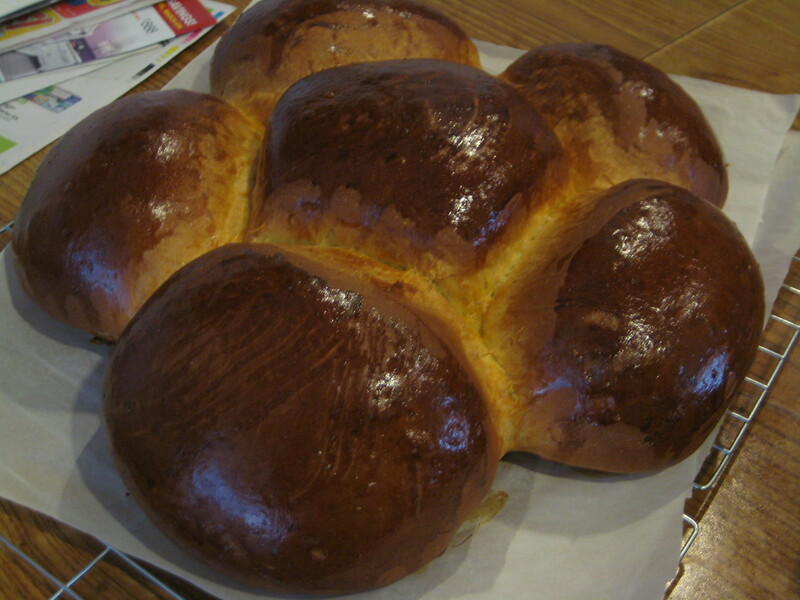 It’s a french brioche made in Nantes, France. 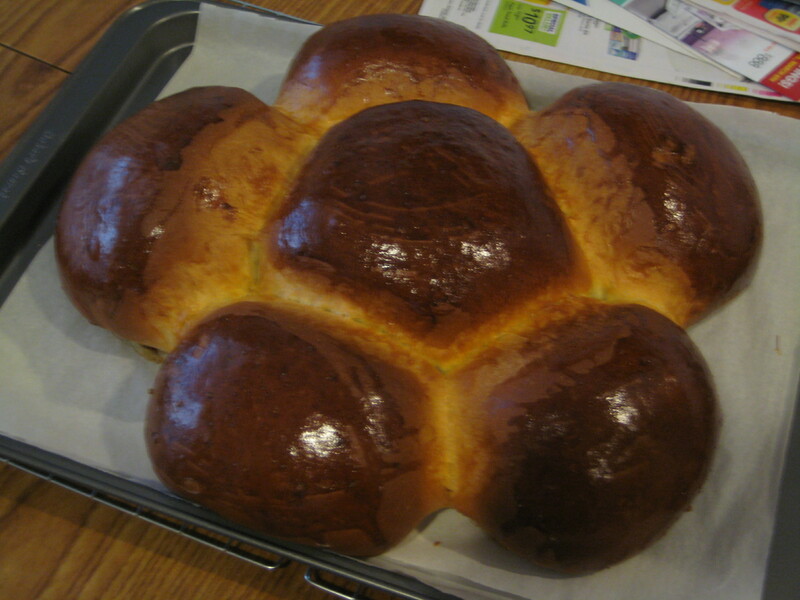 It’s suppose to be in the shape of a star, but seriously I first thought it was a flower. 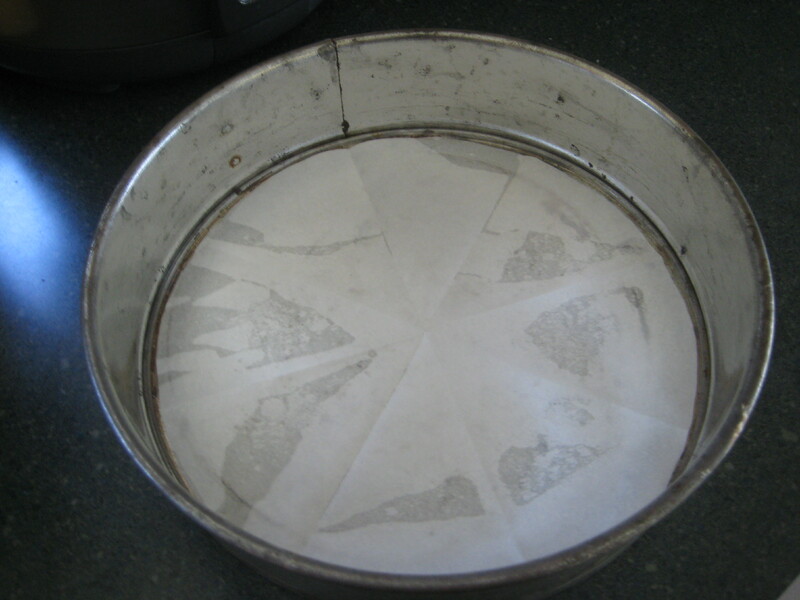 Oh well it’s still quite pretty to look at in any sense. 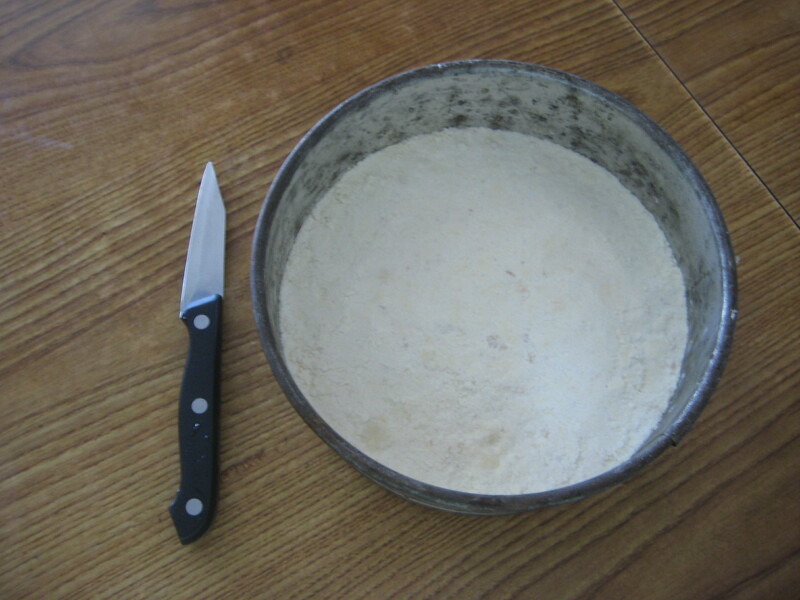 The bread is light and soft on the inside and a hard crust. 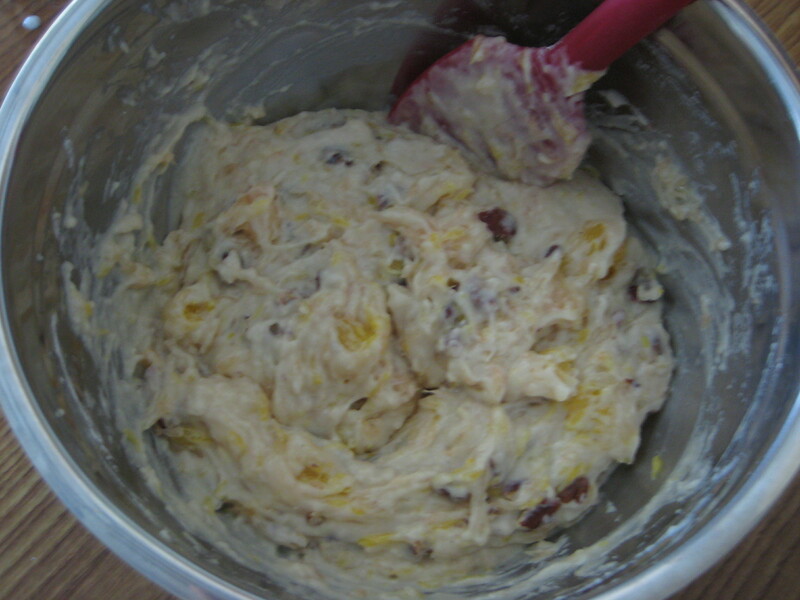 Perfect for some a bread pudding or topped with jam. 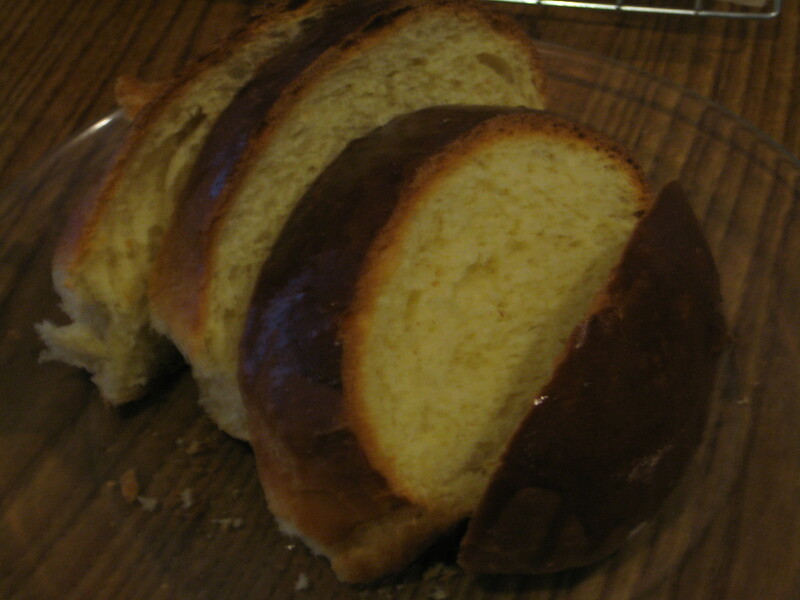 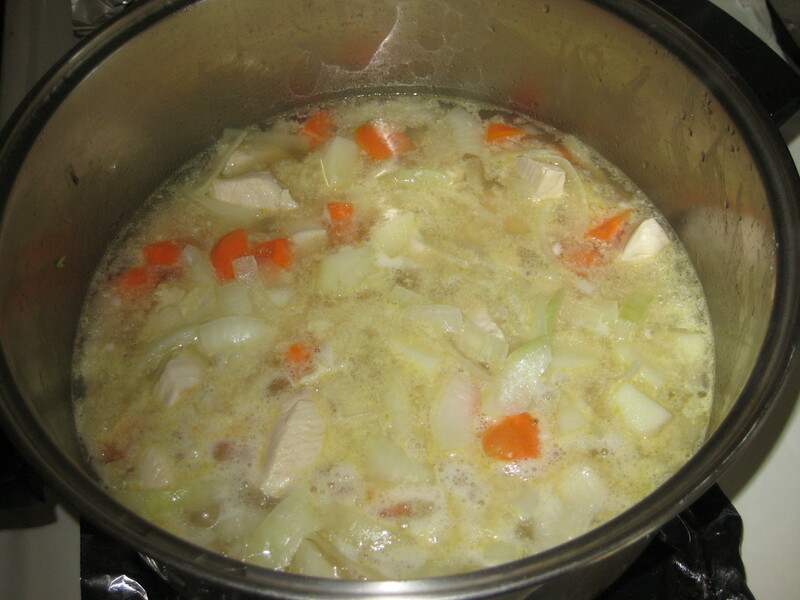 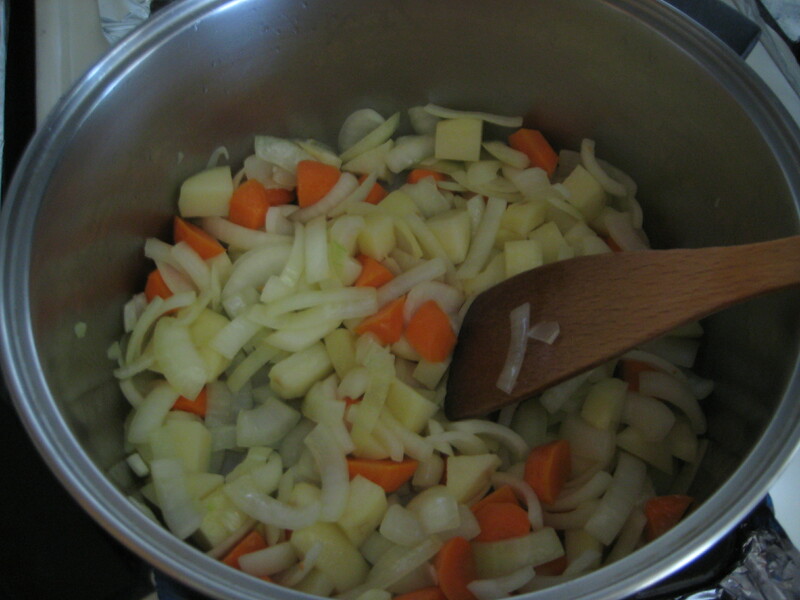 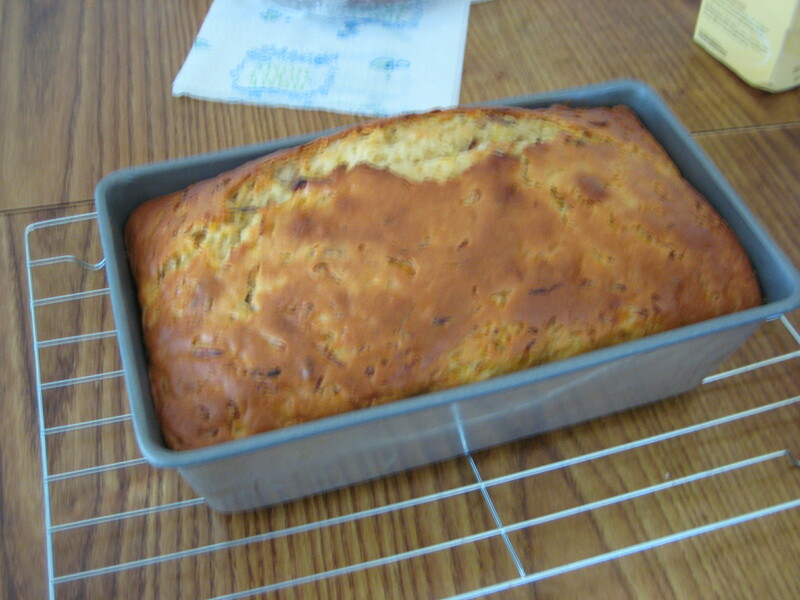 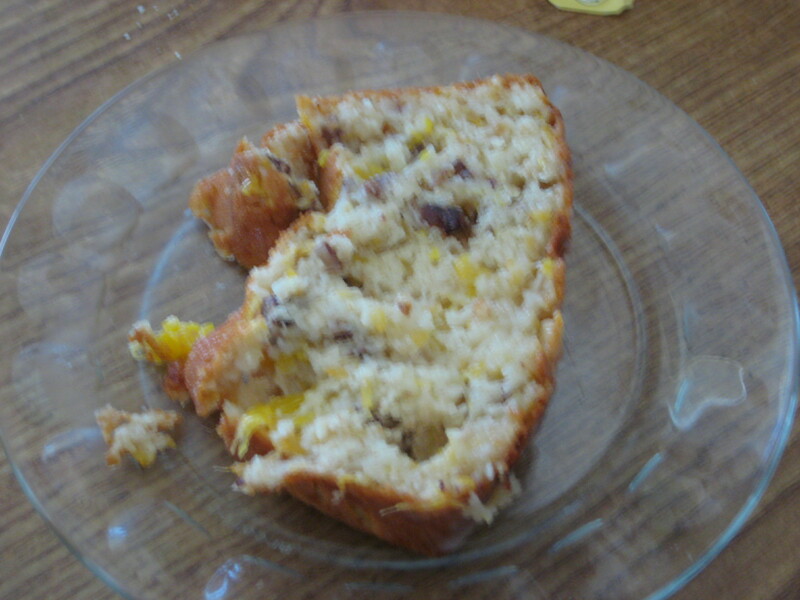 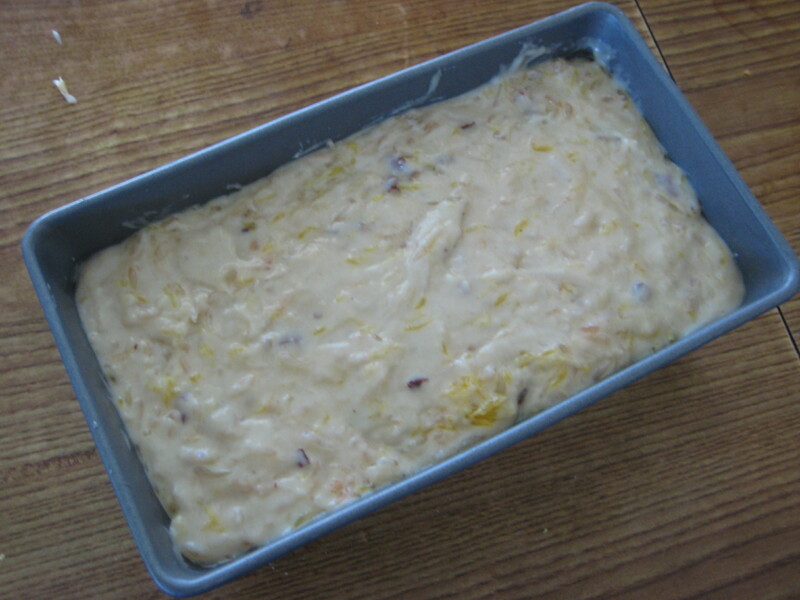 I found the recipe for it at FOUACE NANTAISE – a taste of home. 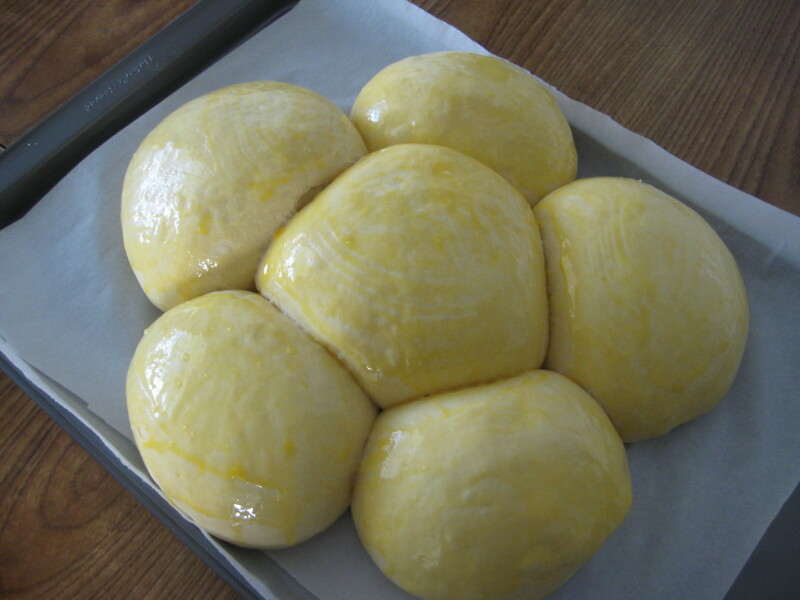 I am going to recreate this bread, but with a few changes to some ingredients. 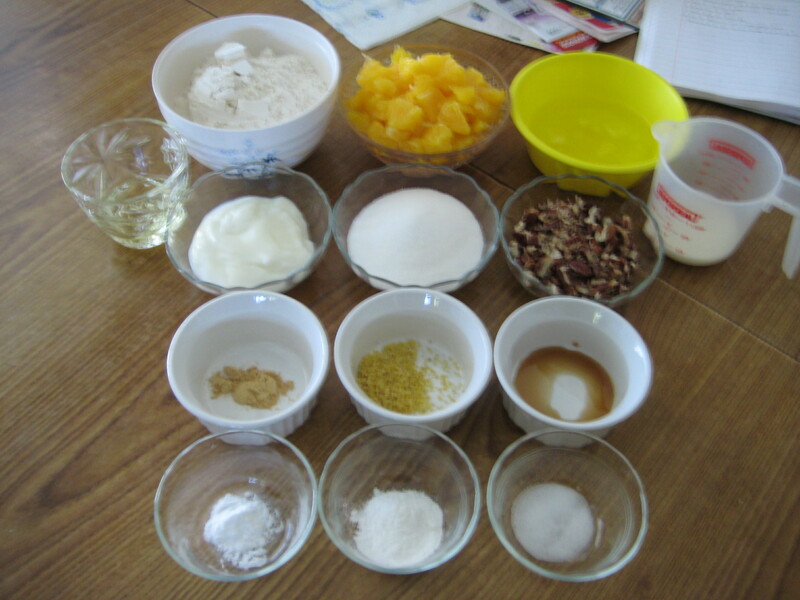 Since some of the ingredients I am unable to find in town. 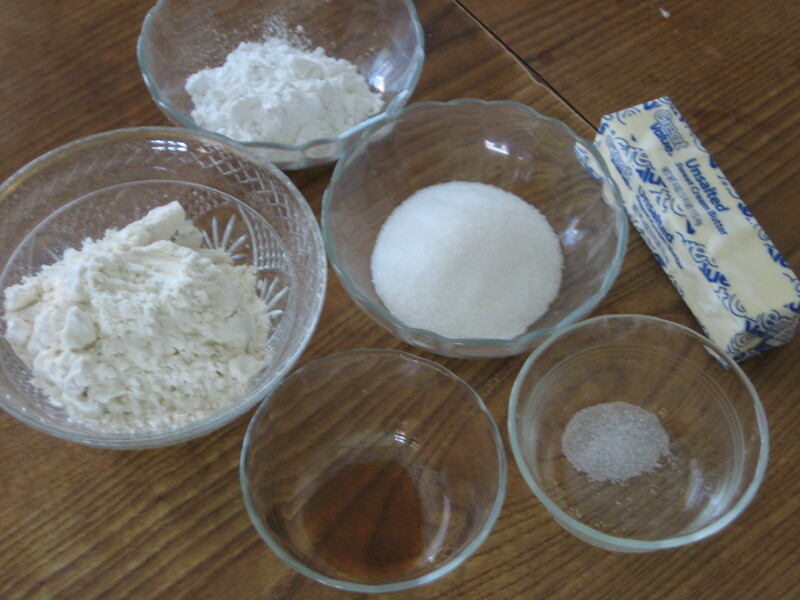 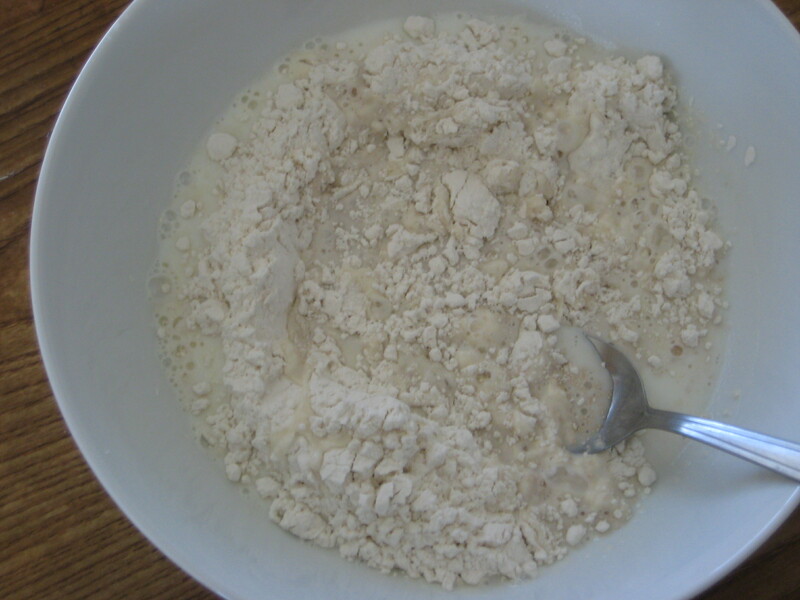 Step 1: In a medium bowl, add 1 cup flour, yeast, and 1 Tbsp sugar. 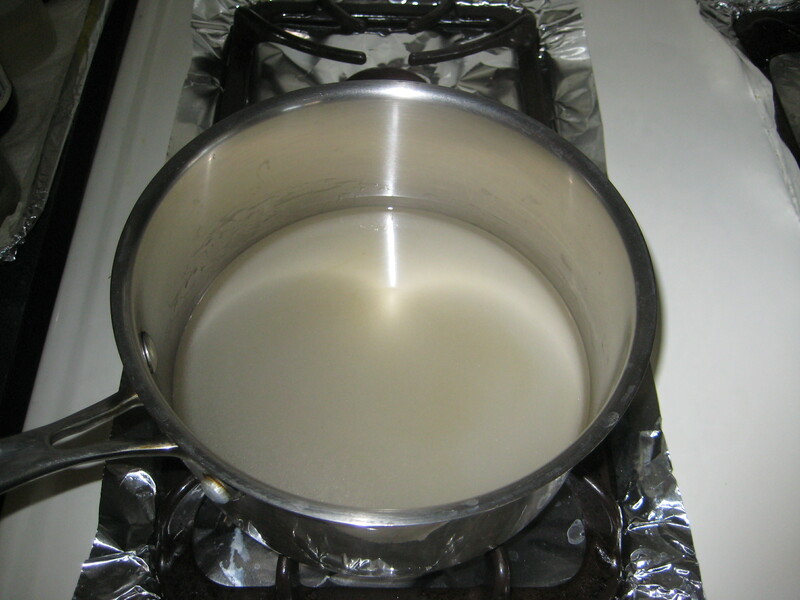 Step 2: Pour in warm milk and stir briefly just to well all ingredients. 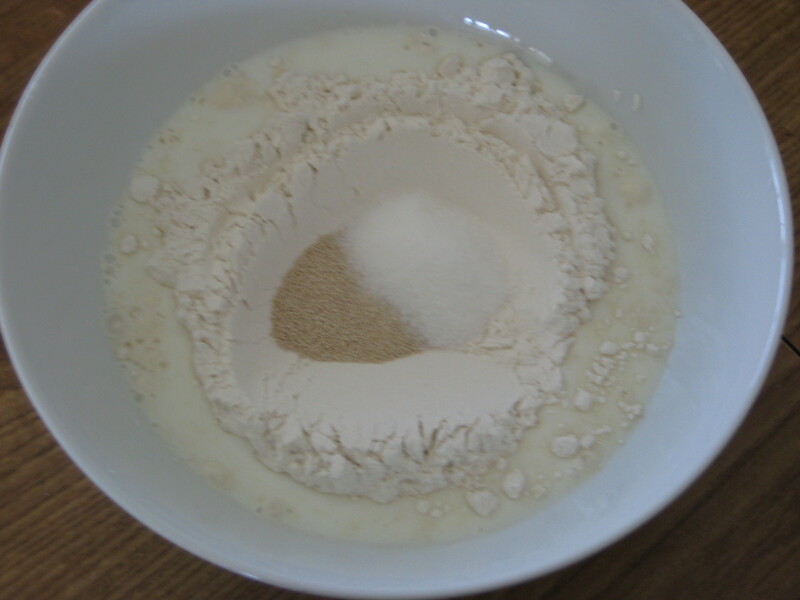 Step 4: While yeast is proofing, in a large bowl, add in the rest of the flour, salt, remaining sugar, butter, water, juice, and 4 eggs. 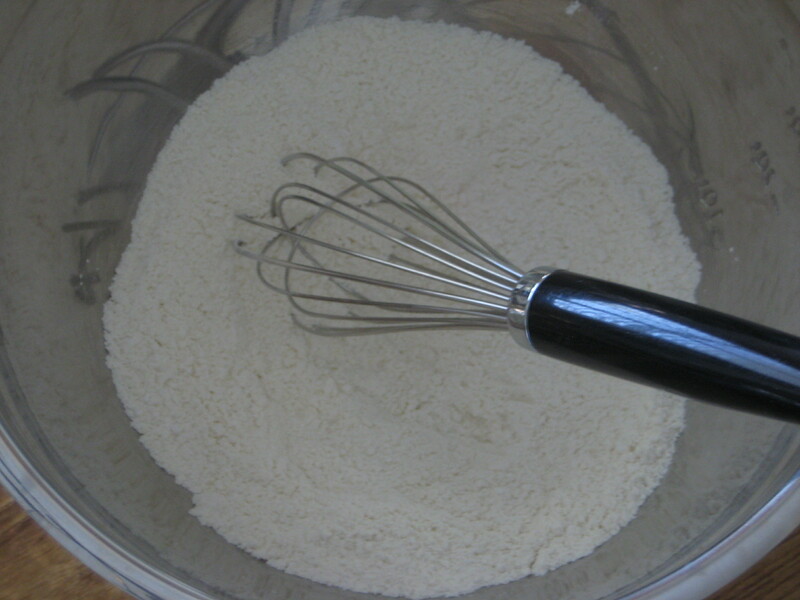 Step 5: Stir with a wooden spoon until all the dry ingredients are moistened and well blended. 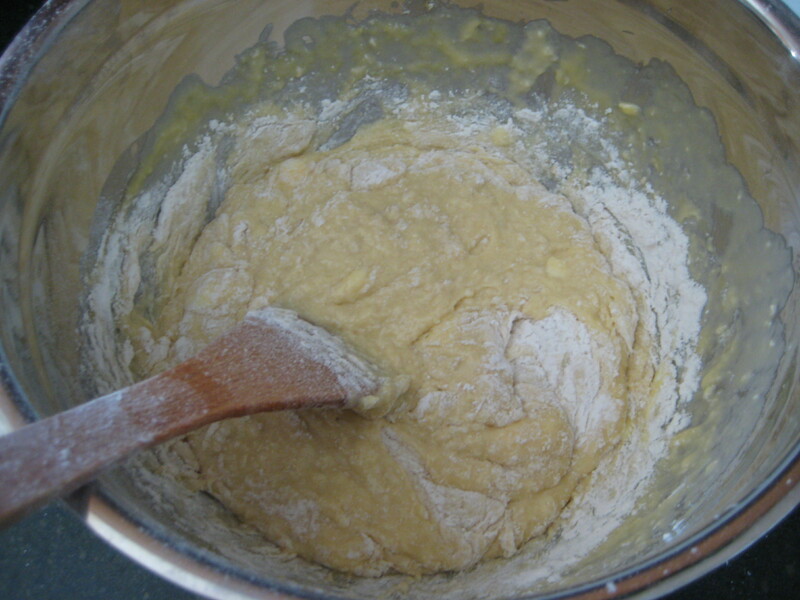 Step 6: Add in the yeast mixture. 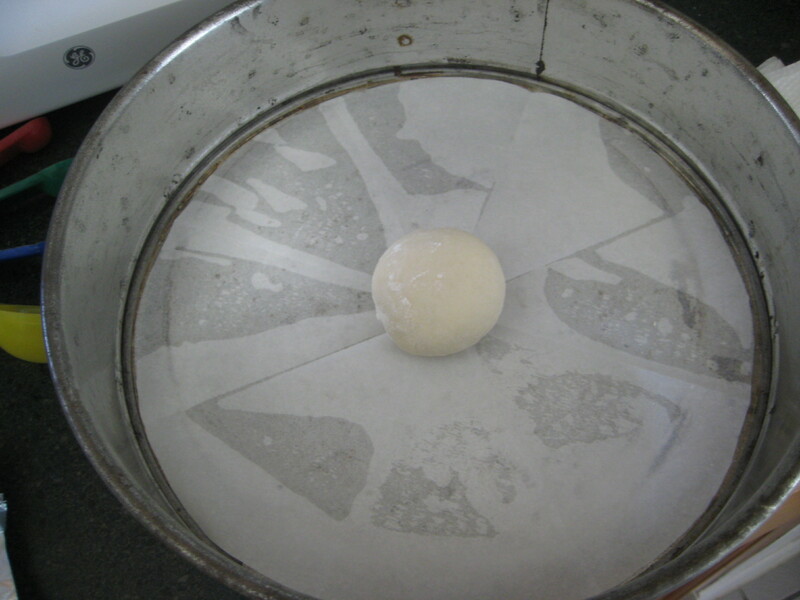 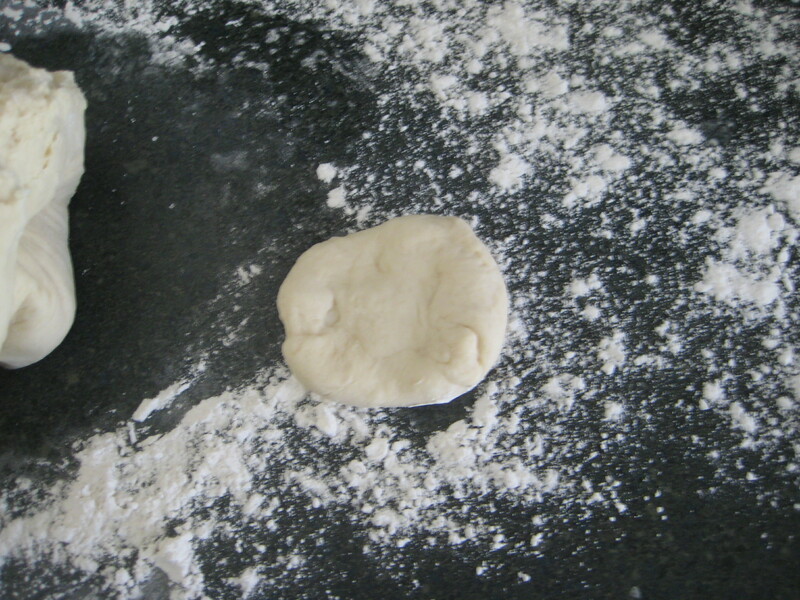 Step 8: Scrape the sticky dough onto a well-floured surface. 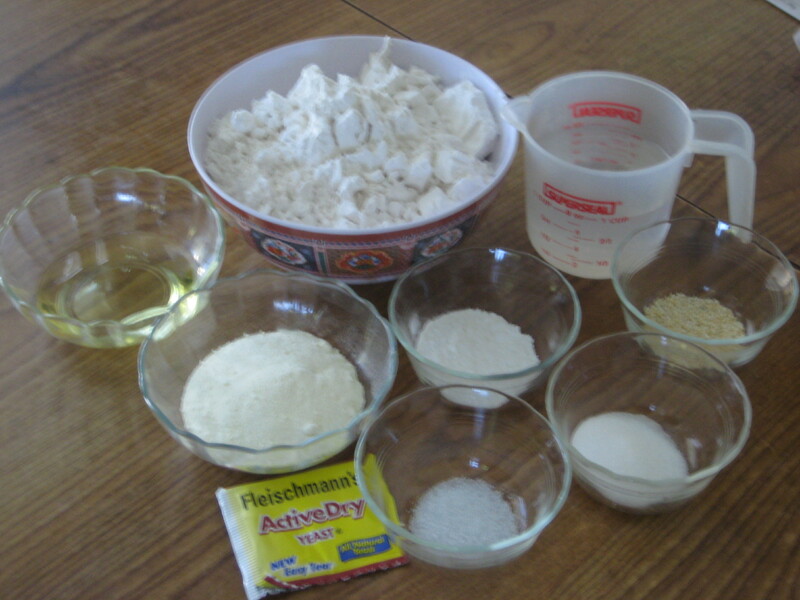 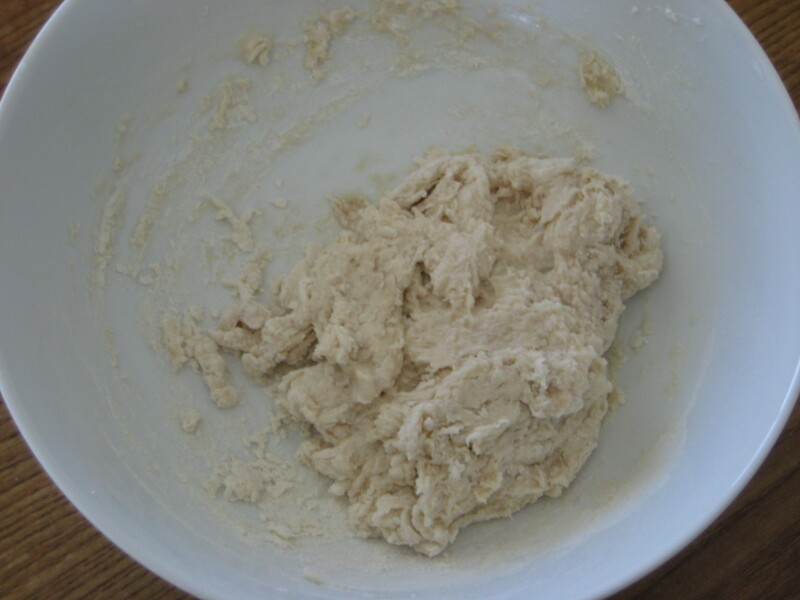 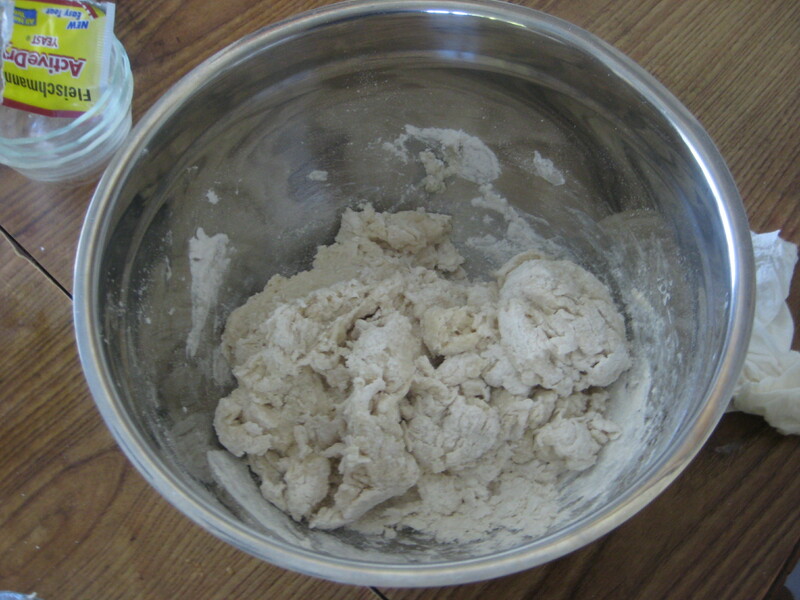 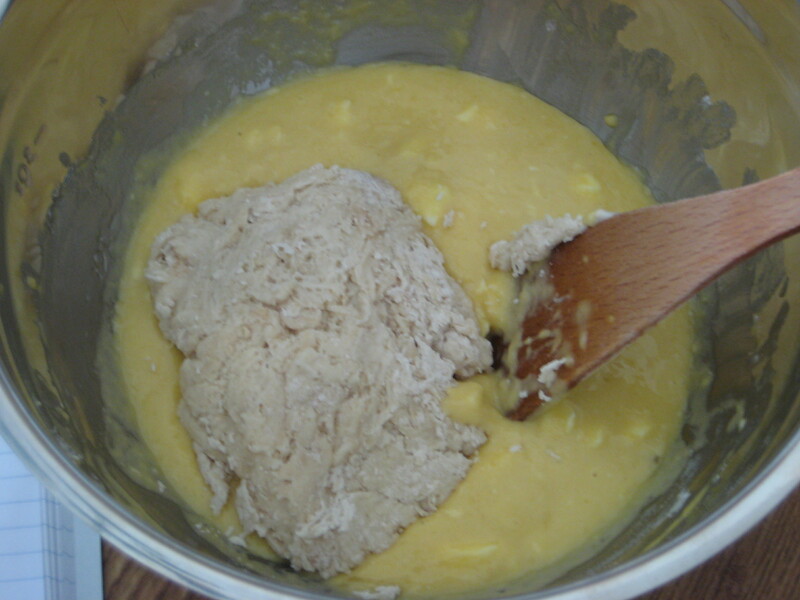 Step 9: Knead the dough, while adding additional flour, until dough is no longer sticky and is soft, smooth, and elastic. 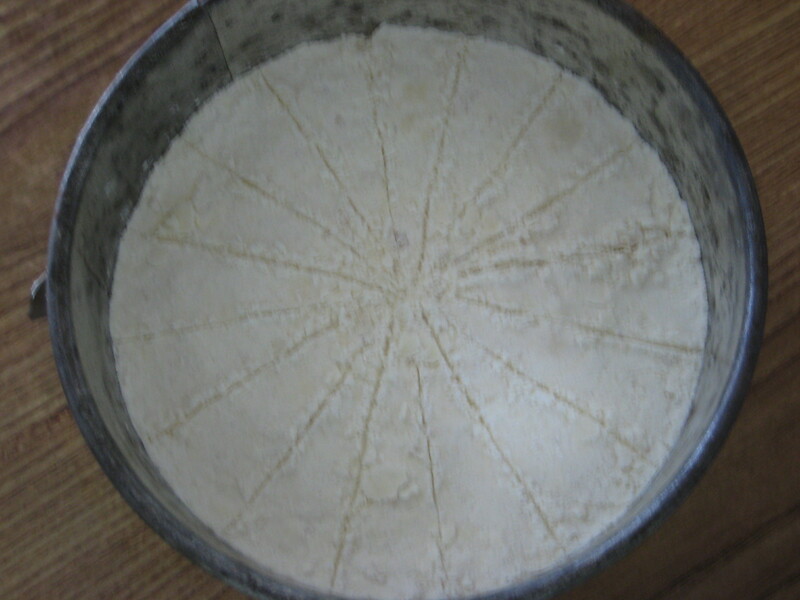 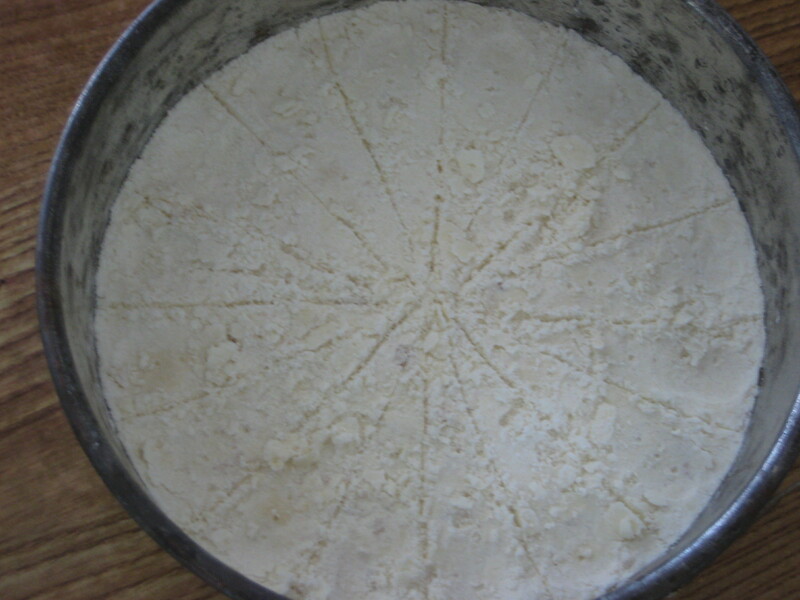 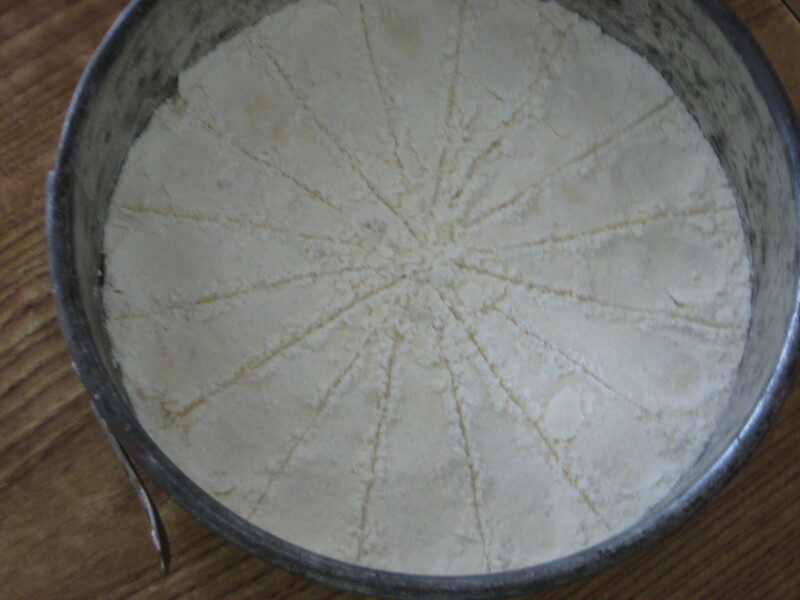 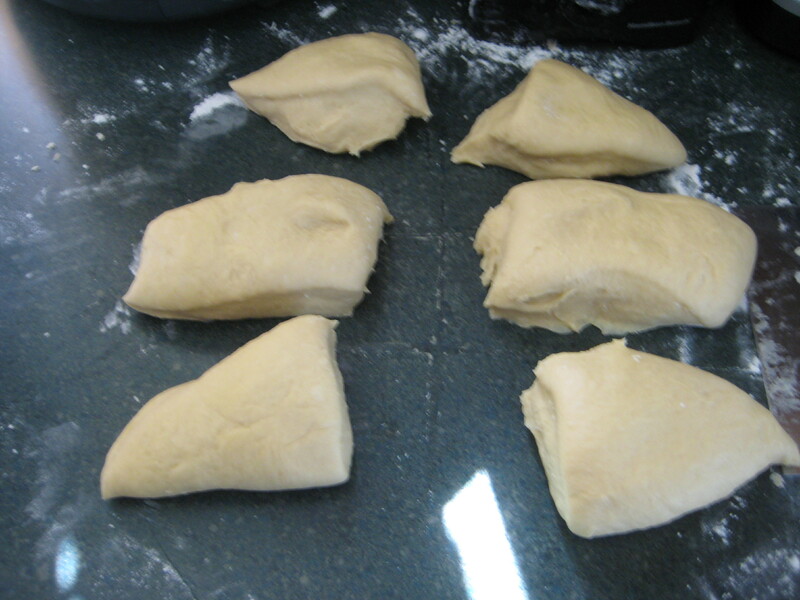 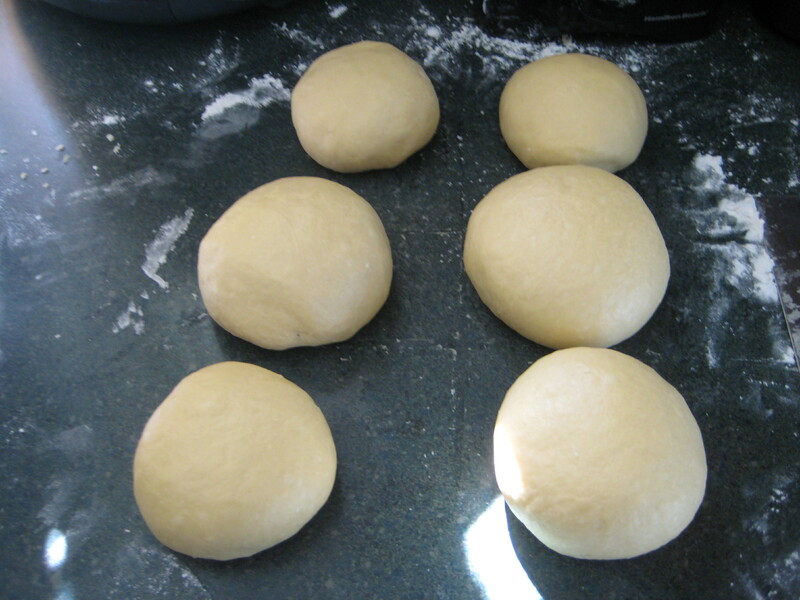 Step 10: Carefully divide dough into 6 equal portions. 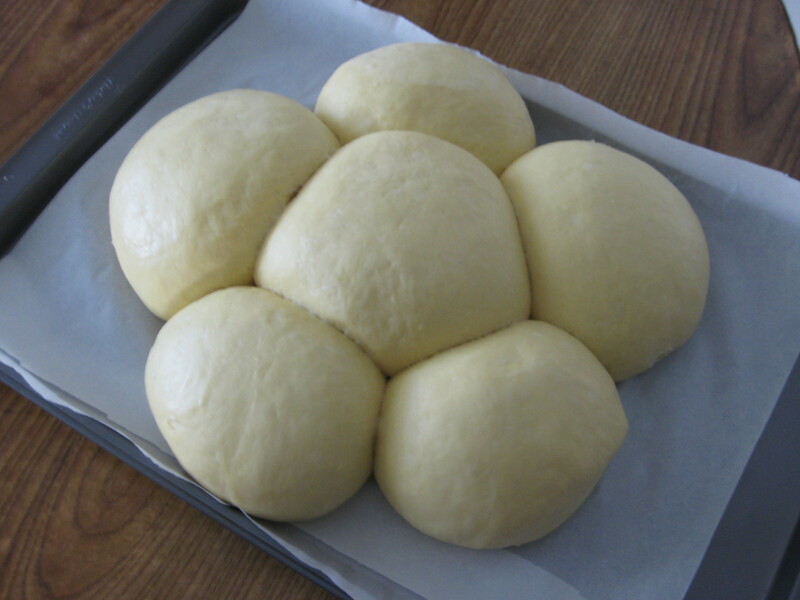 Step 11: Form into balls. 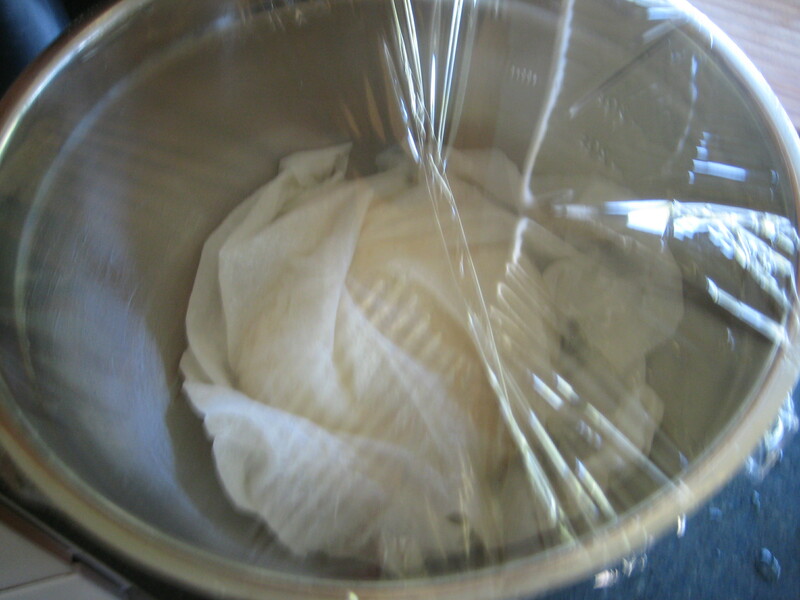 Step 13: Cover lightly with plastic wrap and then a kitchen towel. 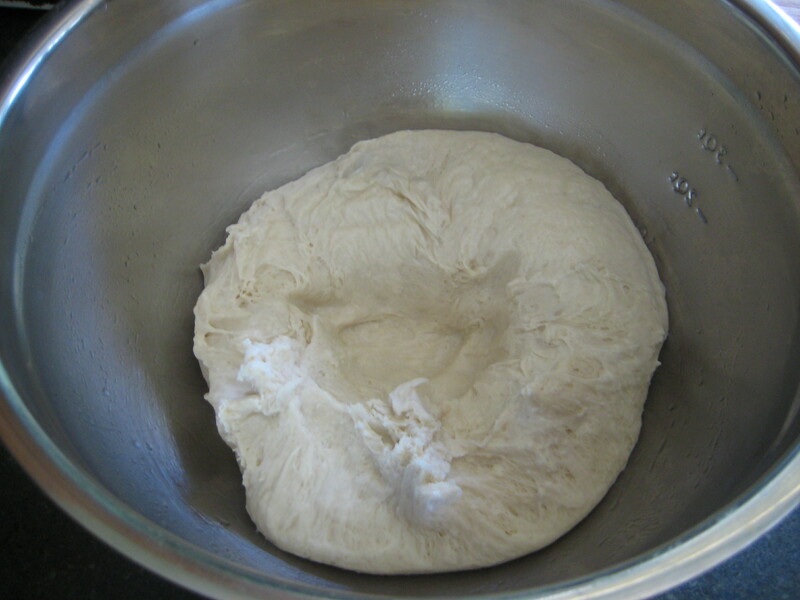 Step 14: Allow to rise until doubled in size, about 1 1/2 – 2 hours. 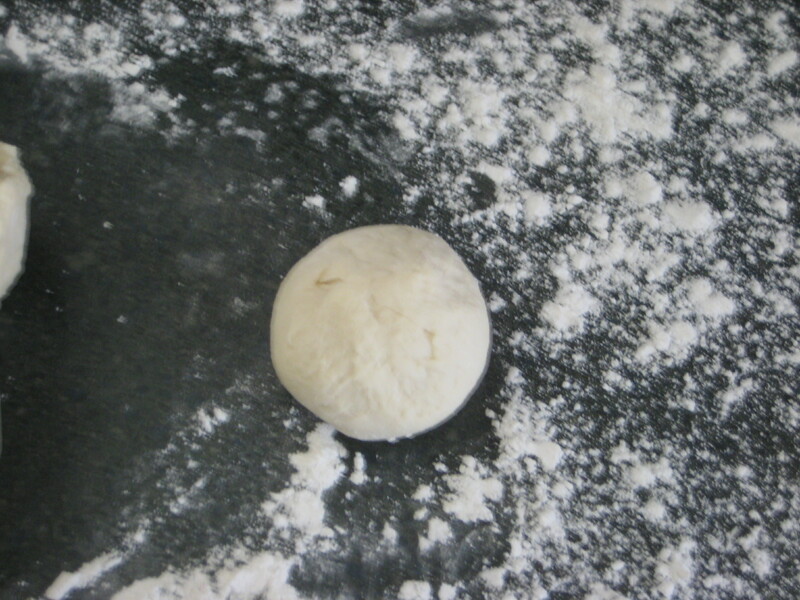 Step 16: Brush the dough with the egg wash. 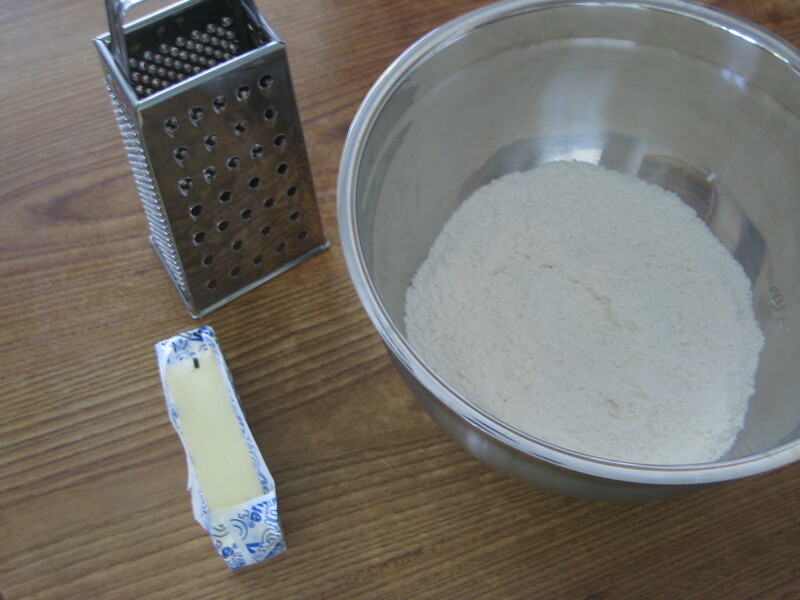 So I was watching Gordon Ramsay’s Ultimate Christmas and saw him make a pretty simple shortbread recipe. 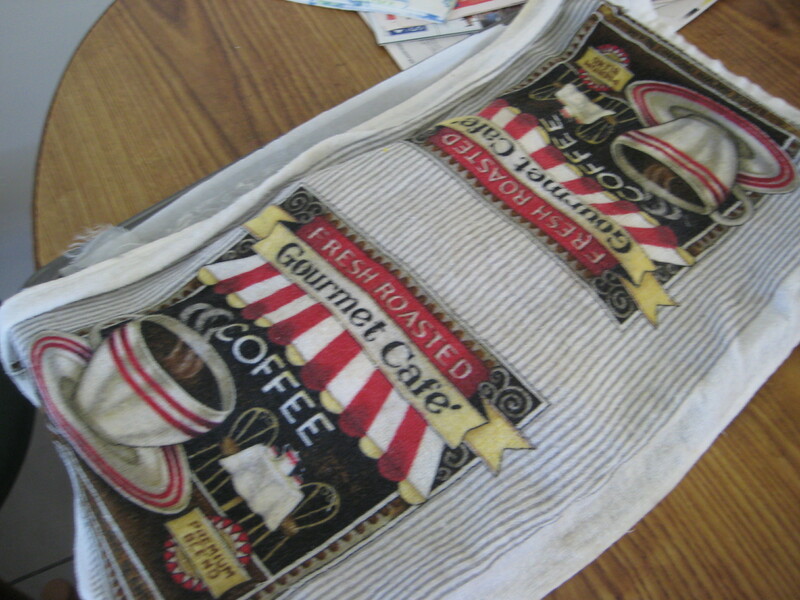 I really wanted to make it, but a less expensive and wasteful version. 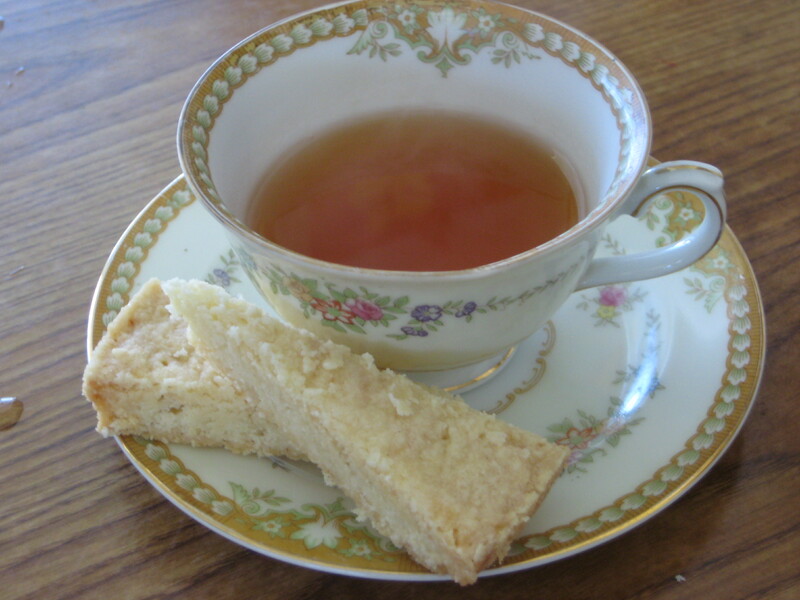 It goes really well with tea or coffee in the winter afternoons. 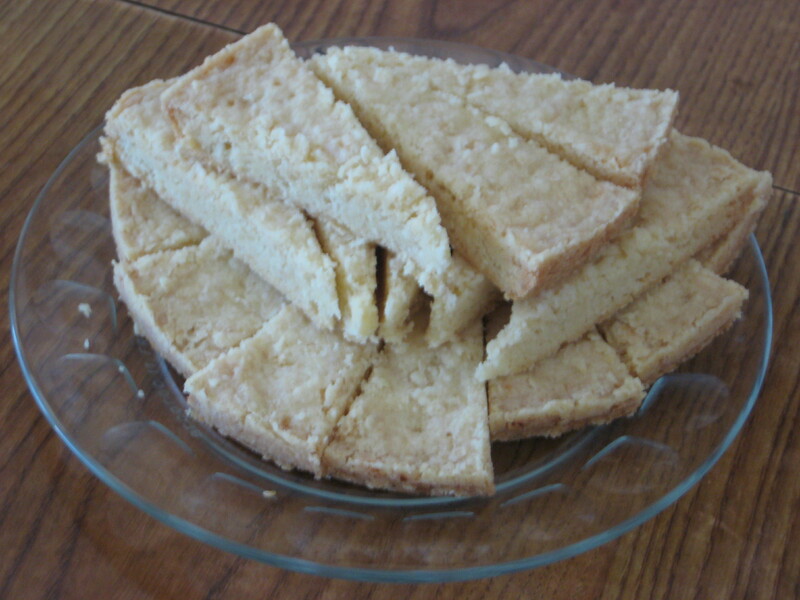 This version is a more rustic feel to it and is a bit crumbly, but really buttery. 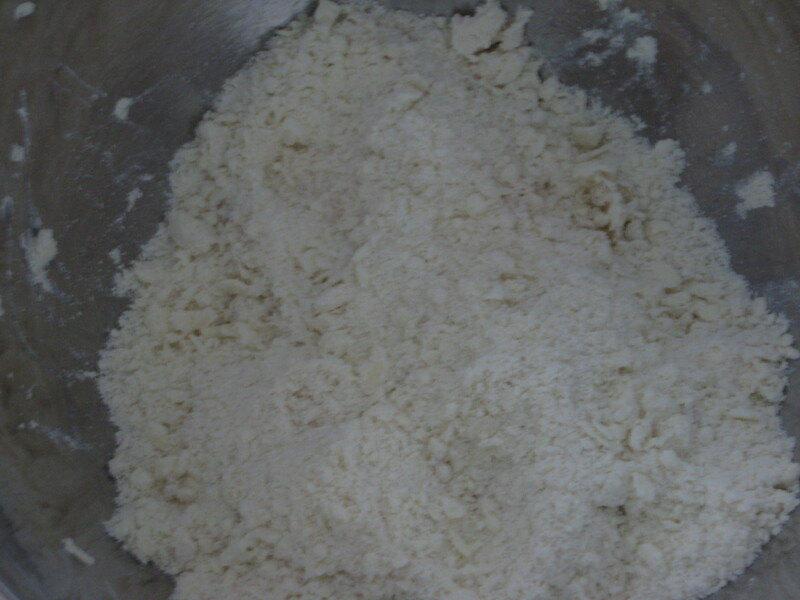 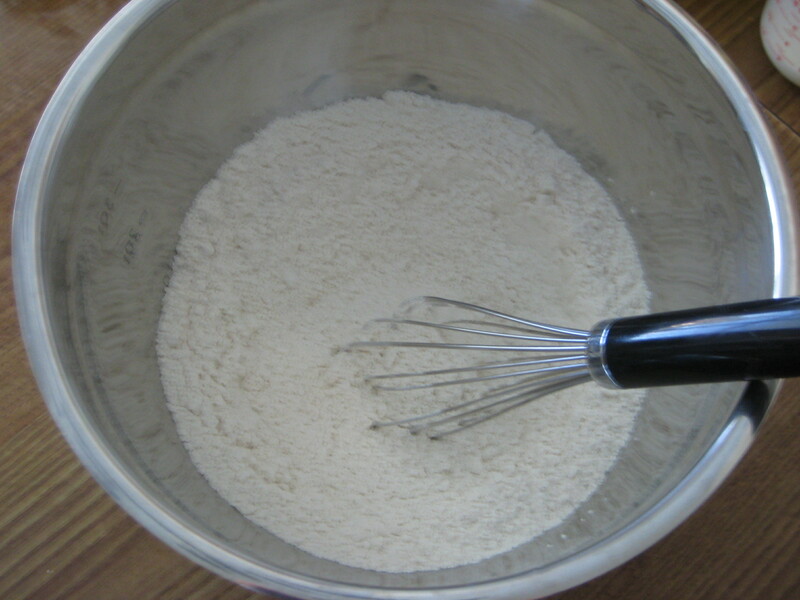 Step 2: In a large bowl, whisk together the flour, rice flour, salt and sugar together. 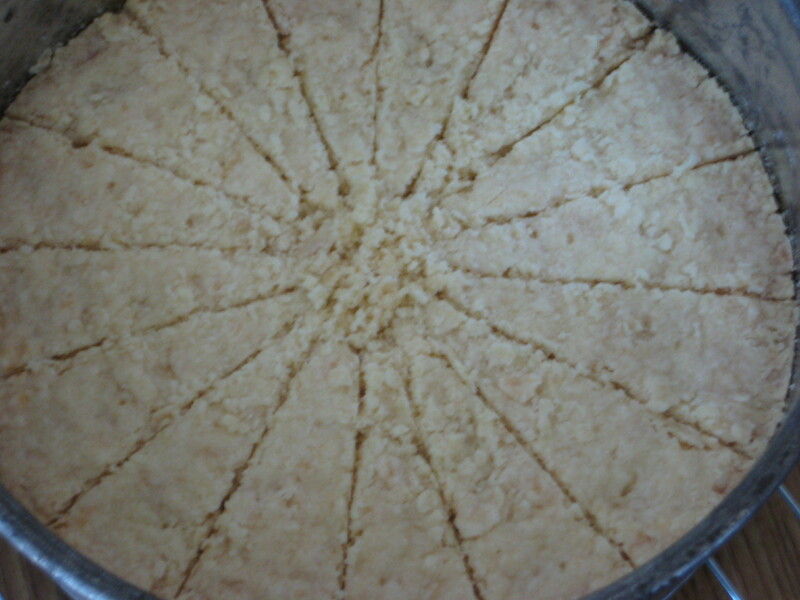 Step 5: Evenly press the shortbread into the tart pan, smoothing the top as much as possible. 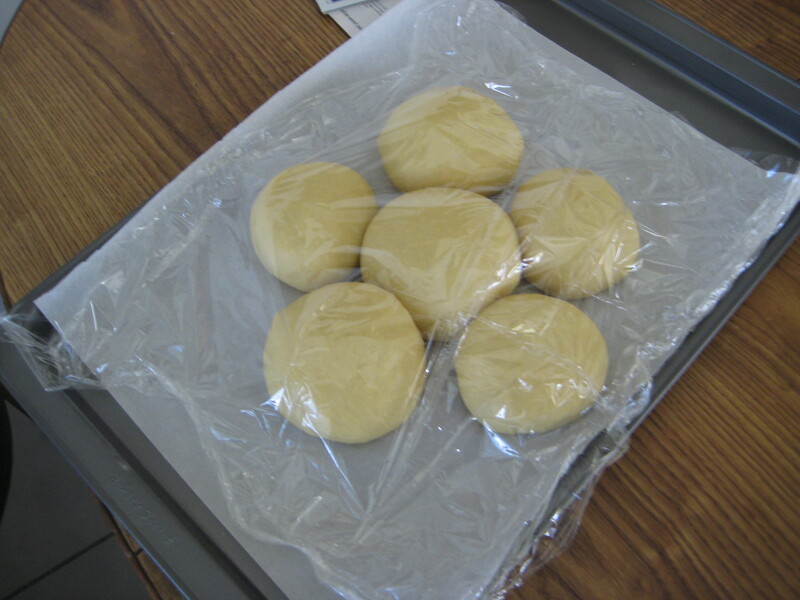 Step 6:Place shortbread in freezer for 10-15 minutes. 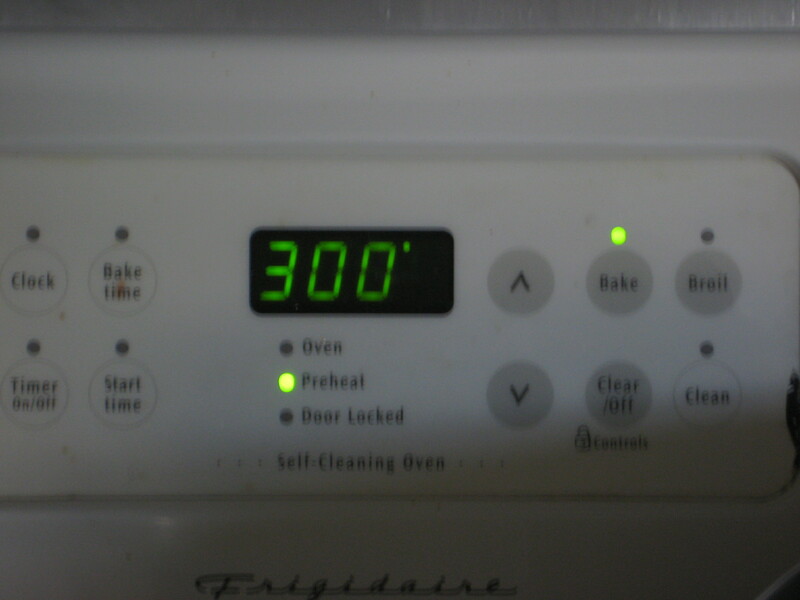 Step 7: Preheat oven to 300°F with the rack in the center of the oven. 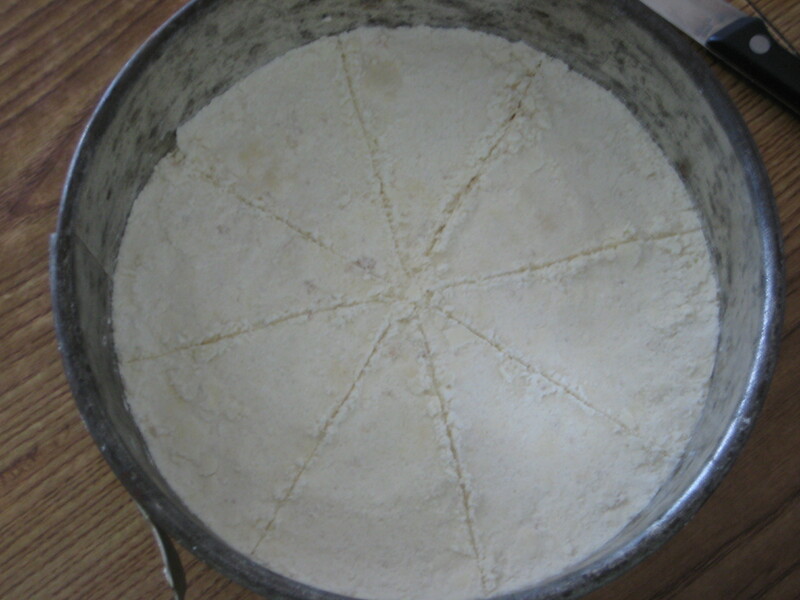 Step 9: Press a thumbprint at the edge of each triangle. 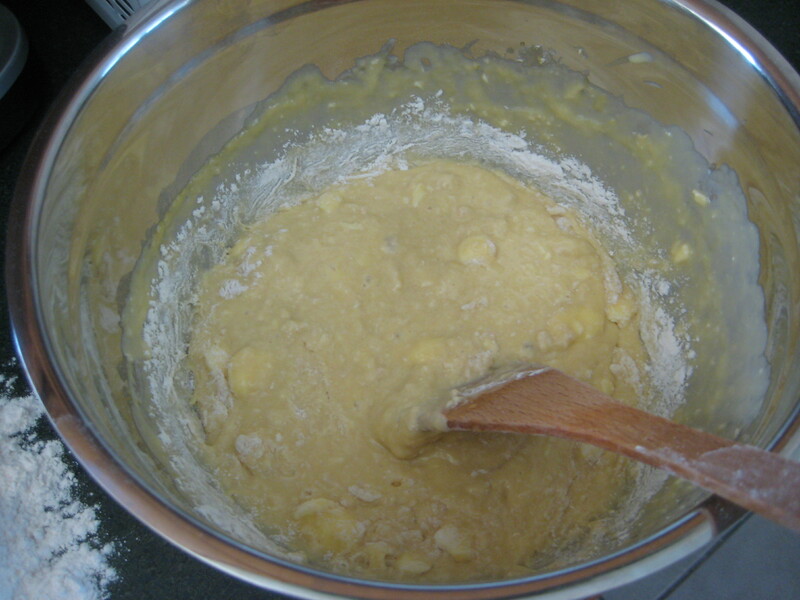 Step 10: Prick the surface shortbread with a fork. 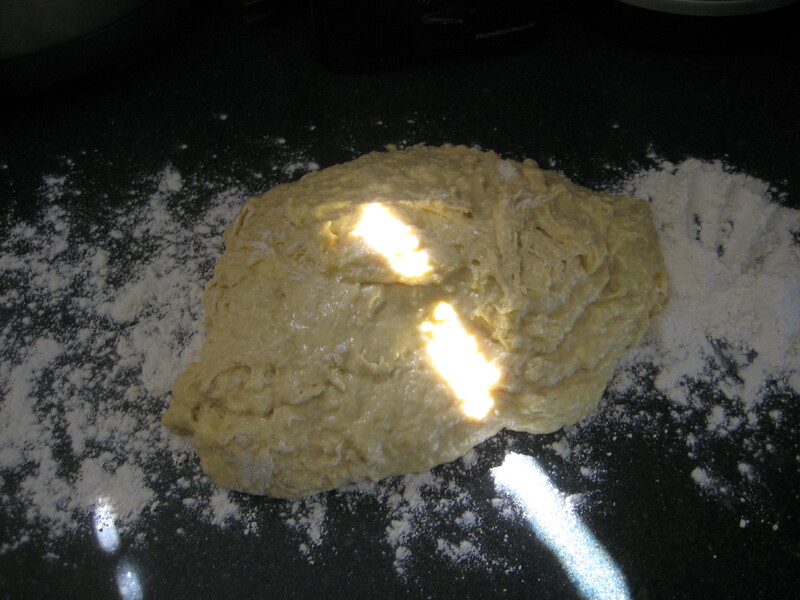 Step 11: Bake for 40-50 minutes, or until light golden/biscuit color. 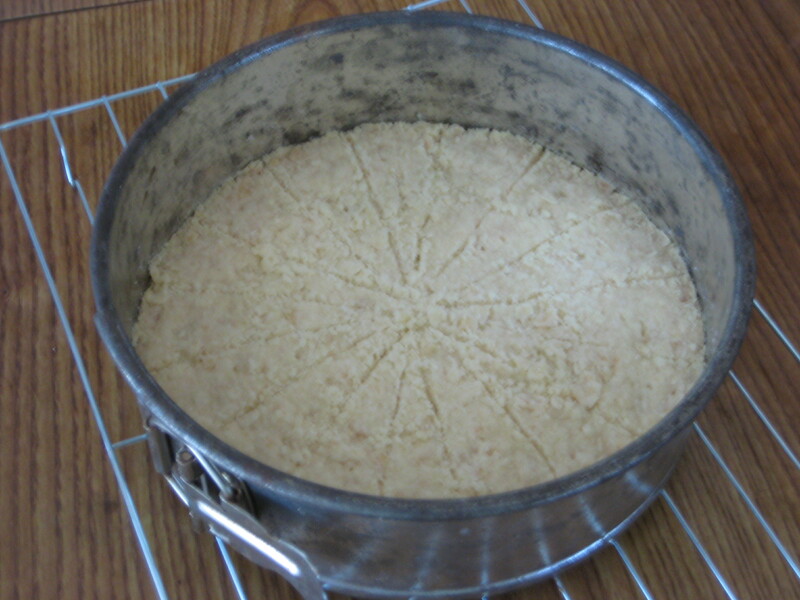 Step 14: Allow shortbread to cool completely in pan on wire rack before removing from pan.